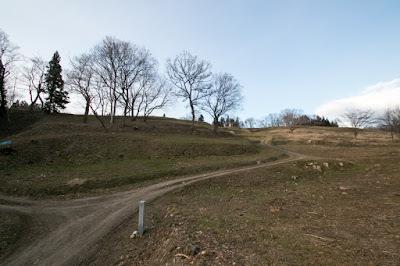 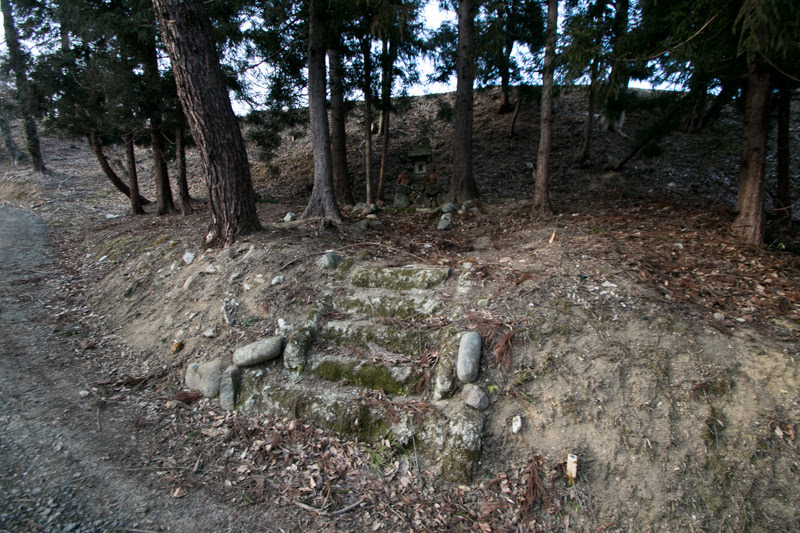 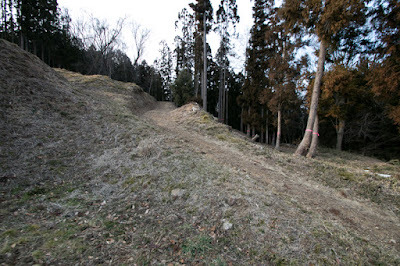 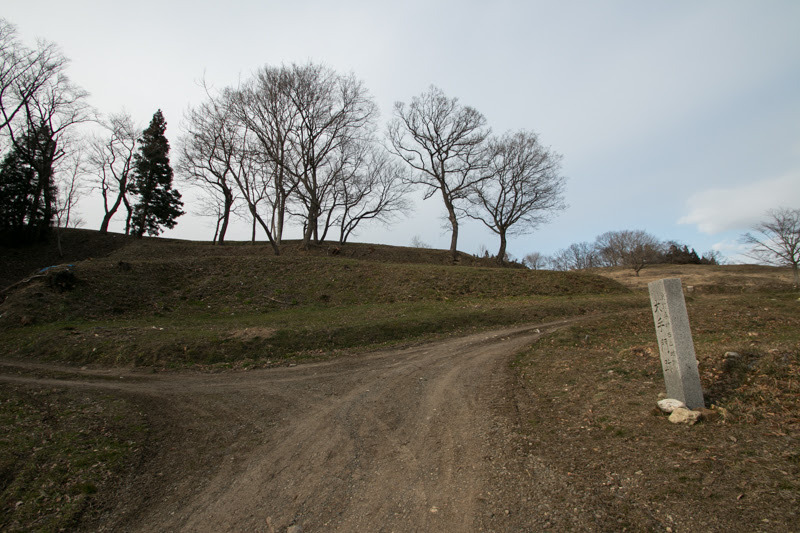 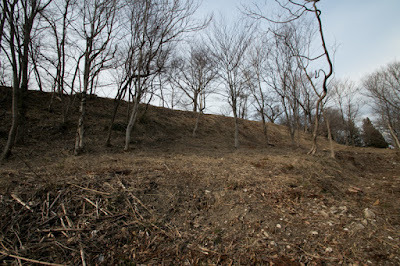 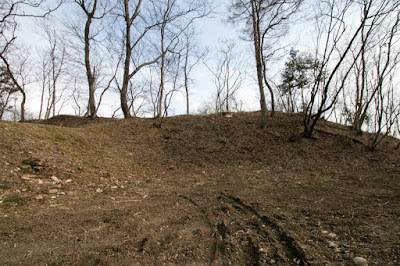 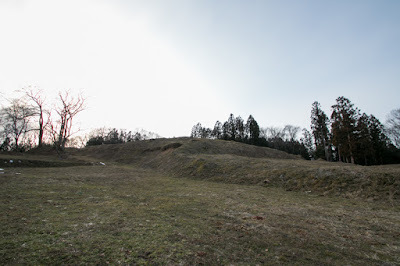 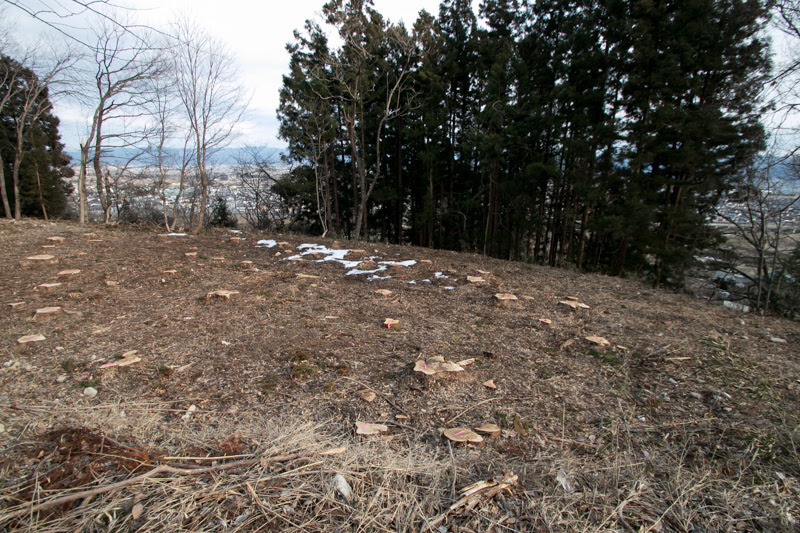 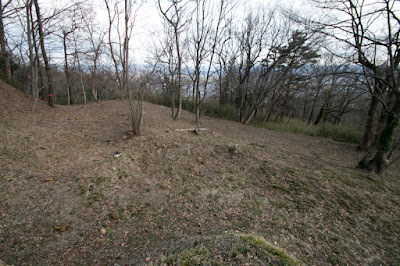 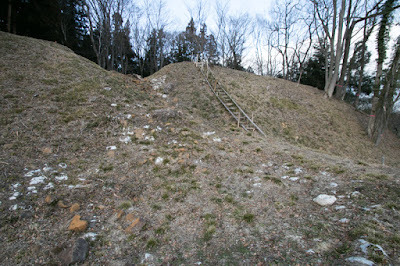 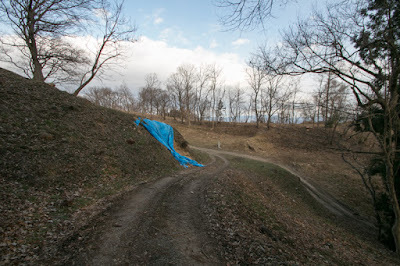 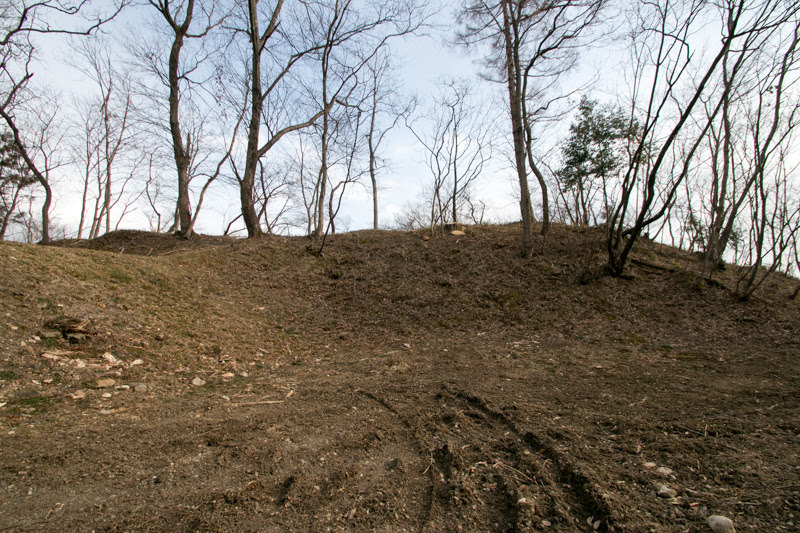 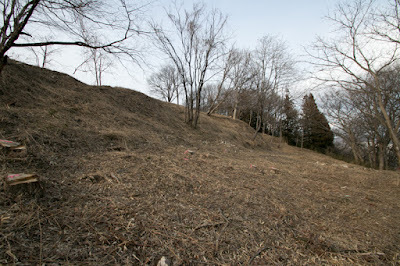 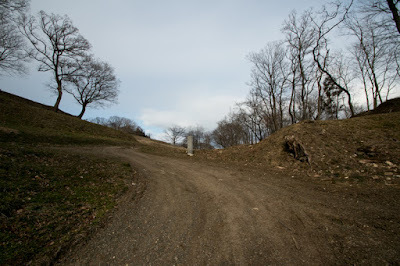 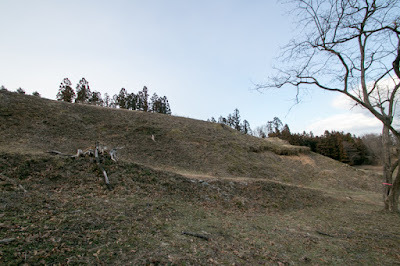 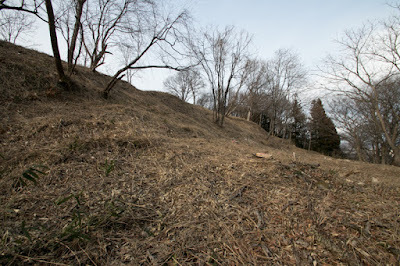 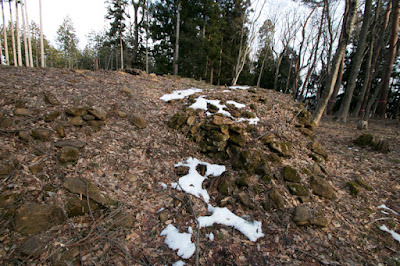 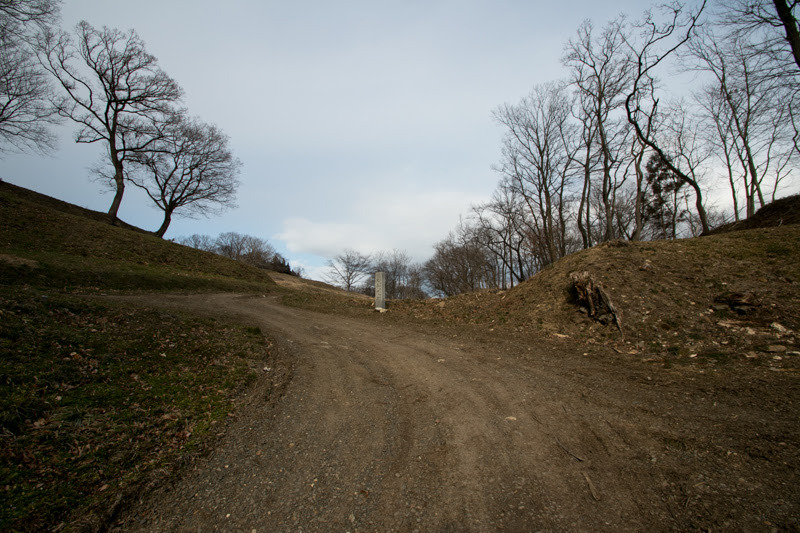 Kori Nishiyama castle (桑折西山城) is located over Takadate-yama mountain, one of about 100 meter height from hillside at the east of center of current Kori town in the north edge of Fukushima prefecture. 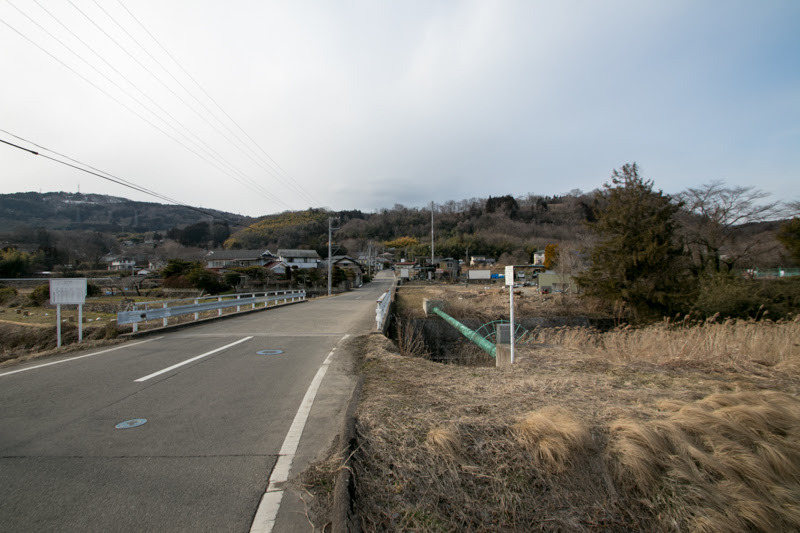 Kori town places at the bottle neck of gourd shaped Fukushima basin, one of four basins at south part of Tohoku region along with Koriyama basin, Aizu basin and Yonezawa basin. 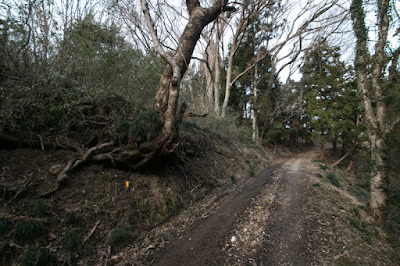 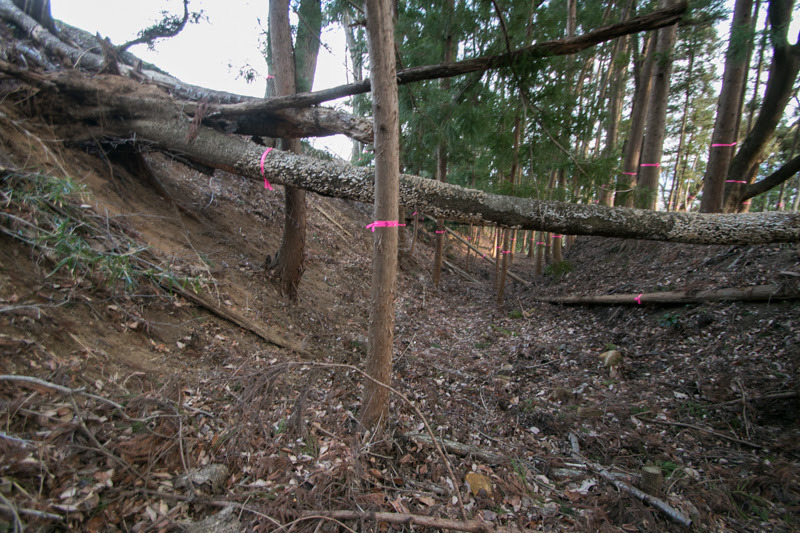 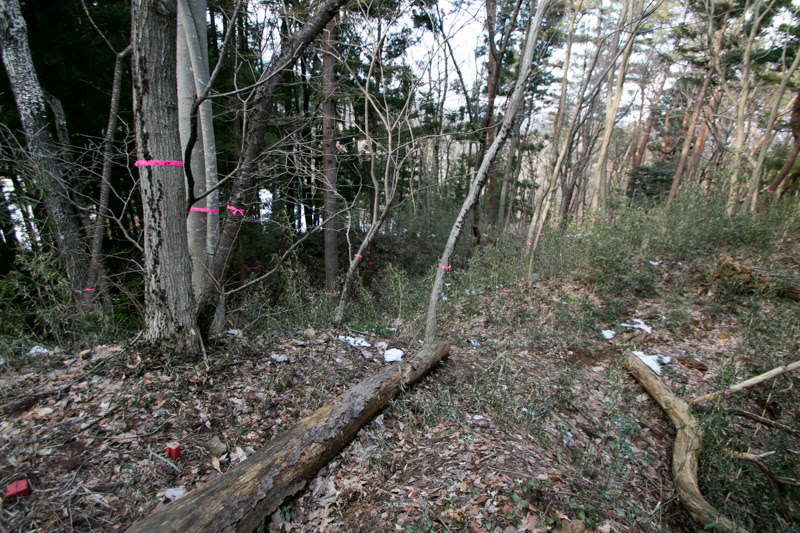 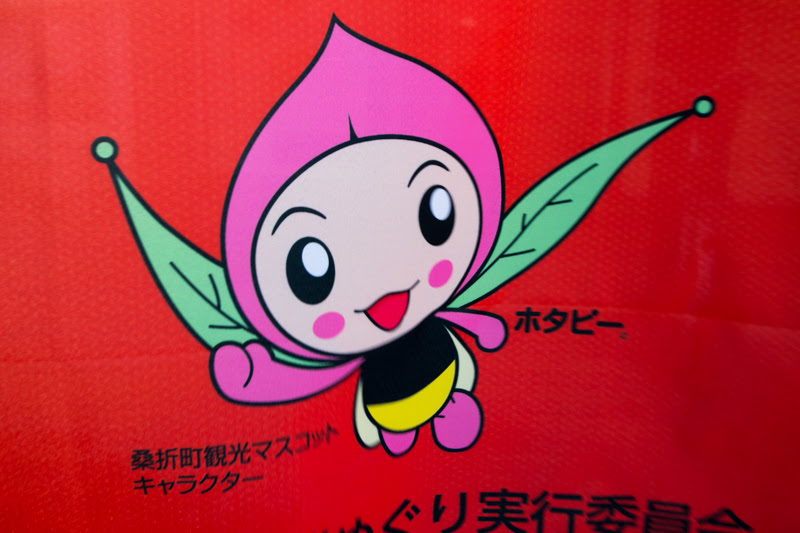 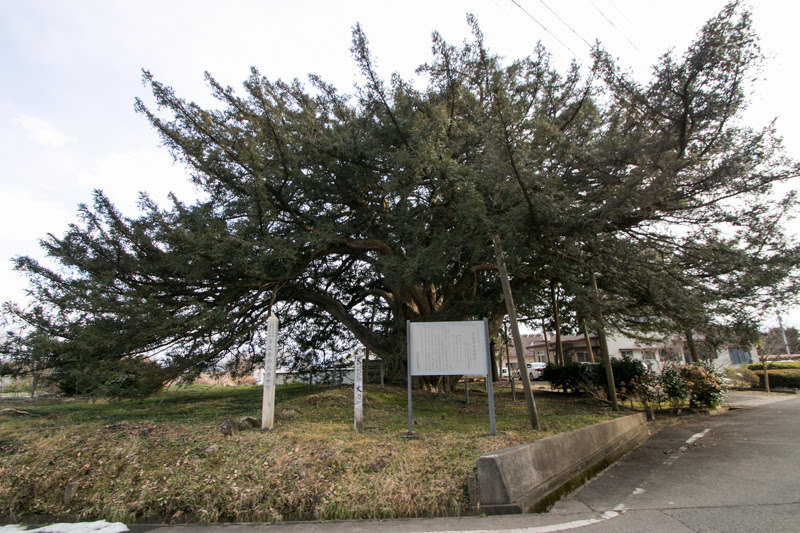 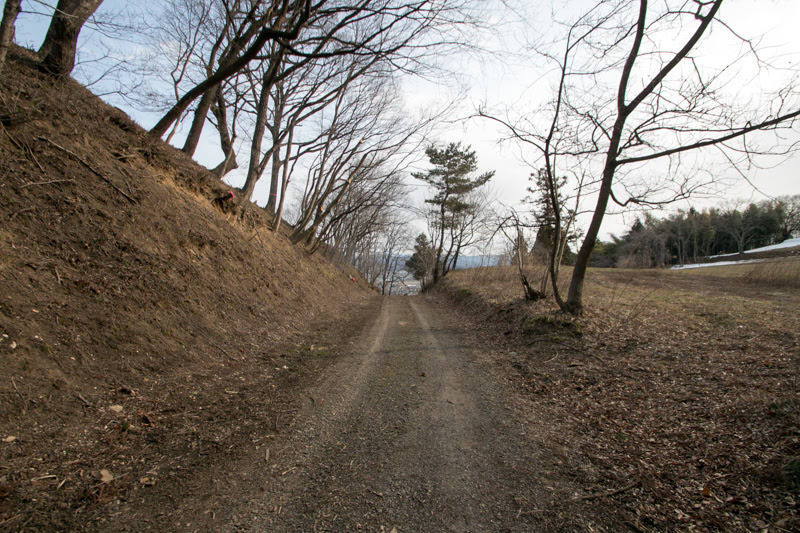 Historically Fukushima basin is at the middle of Tozando road or Oshu-Kaido road, a long road which connected central area and north part of Tohoku region. Even now, every major transportation such as Tohoku Shinkansen train or Tohoku Jidoshado Highway passes just beside of Kori Nishiyama castle. 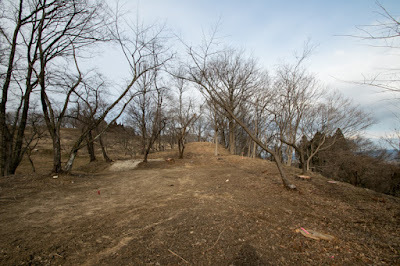 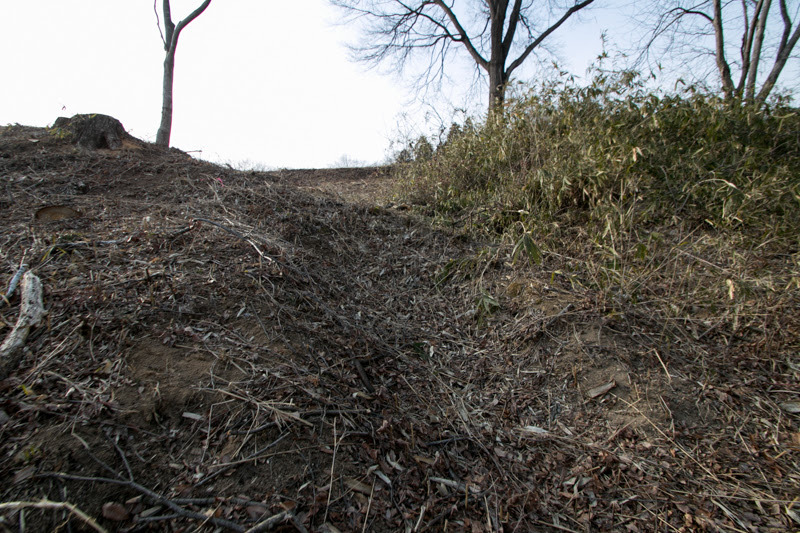 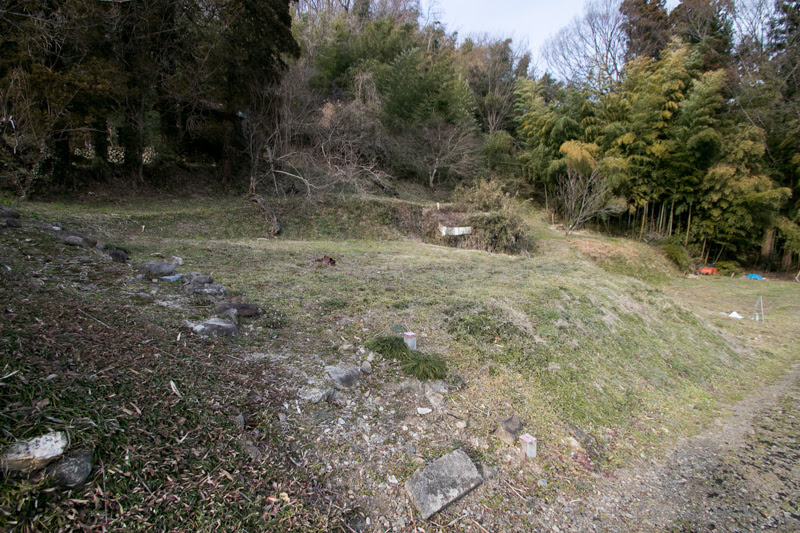 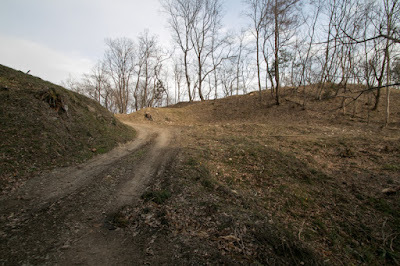 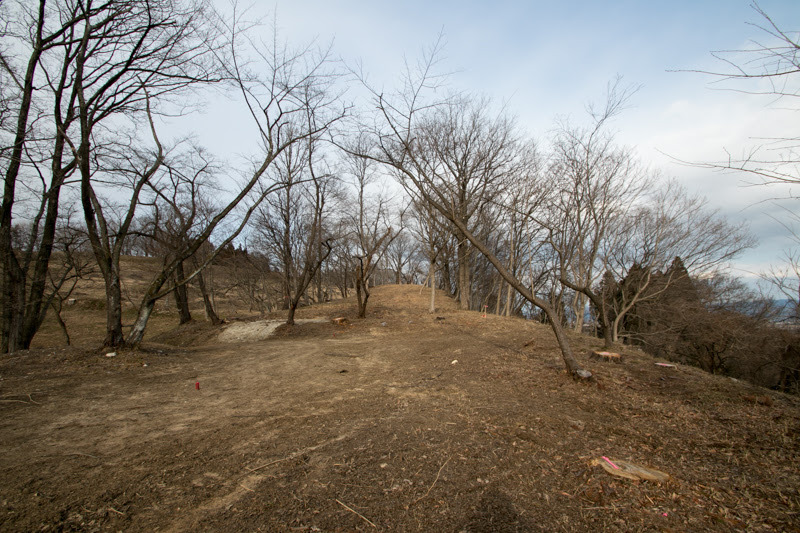 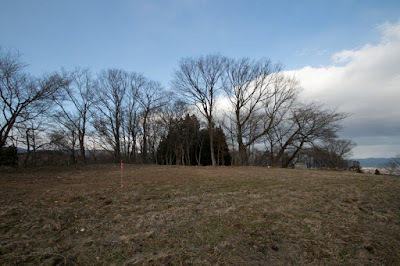 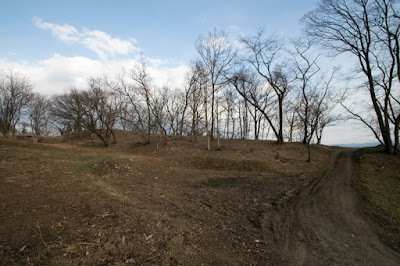 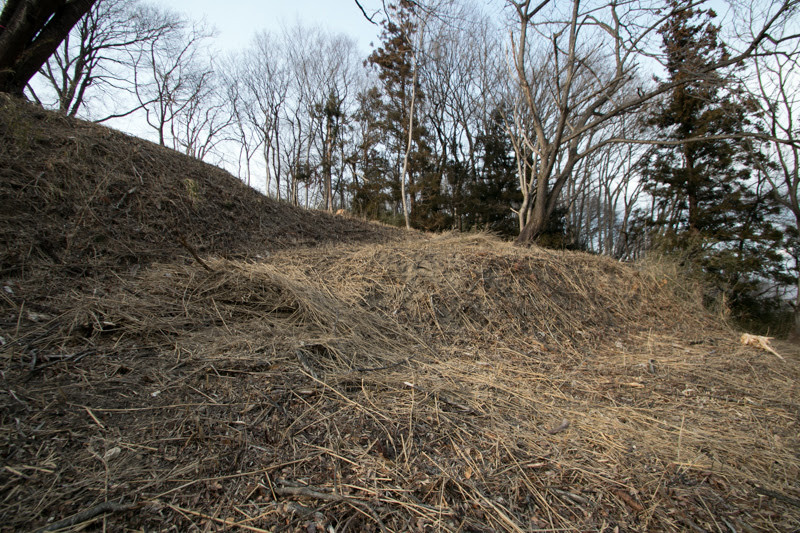 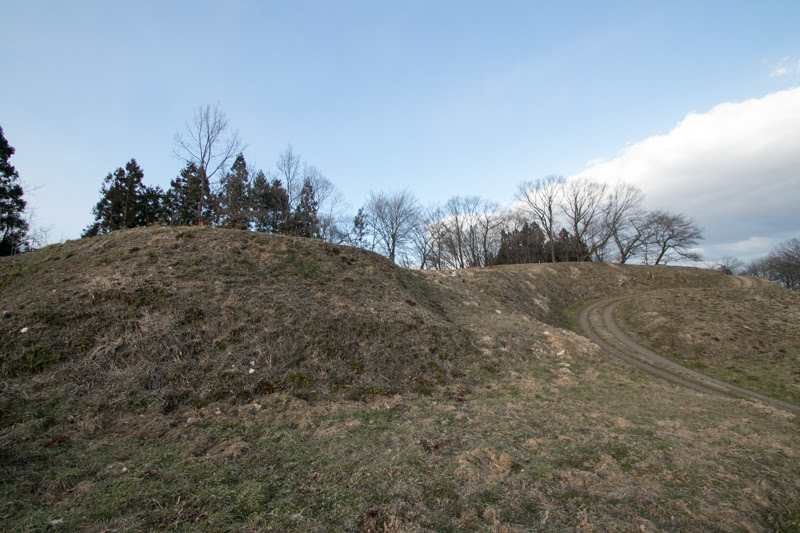 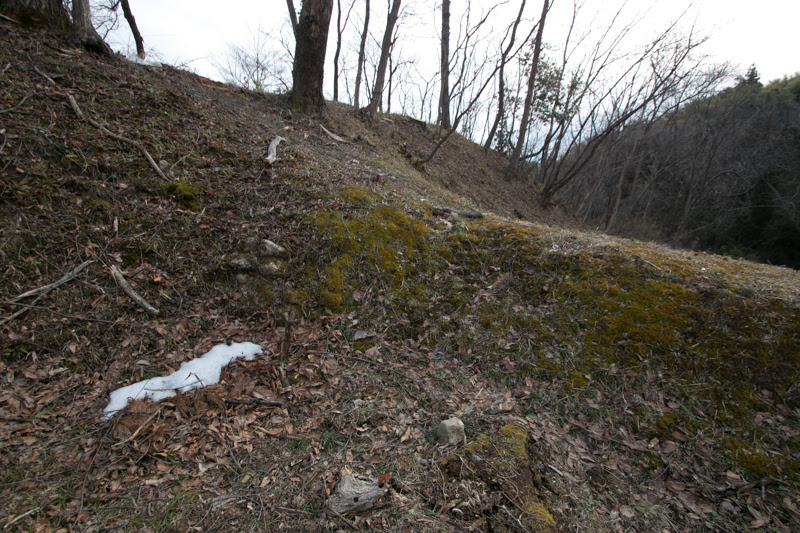 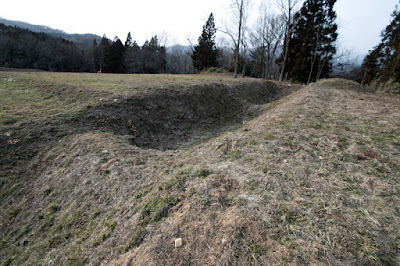 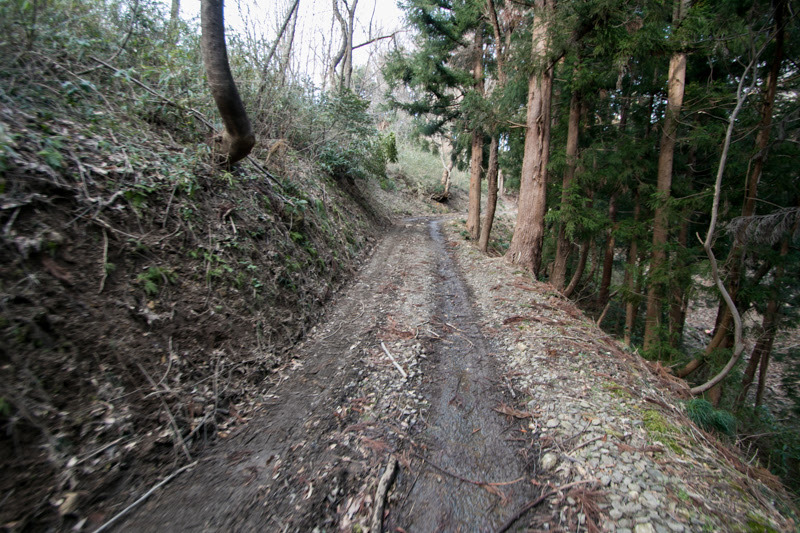 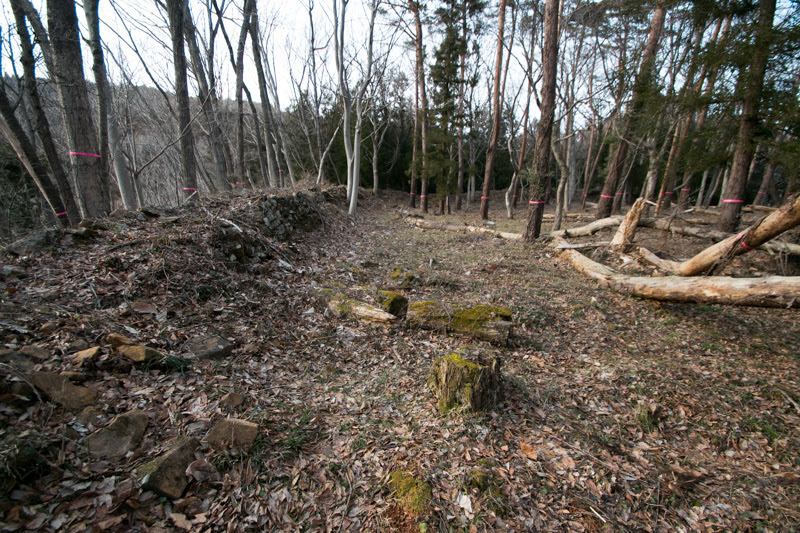 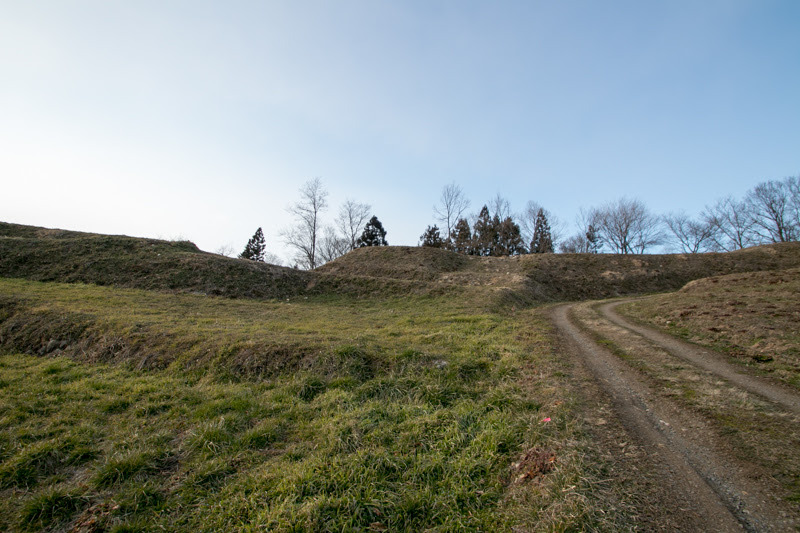 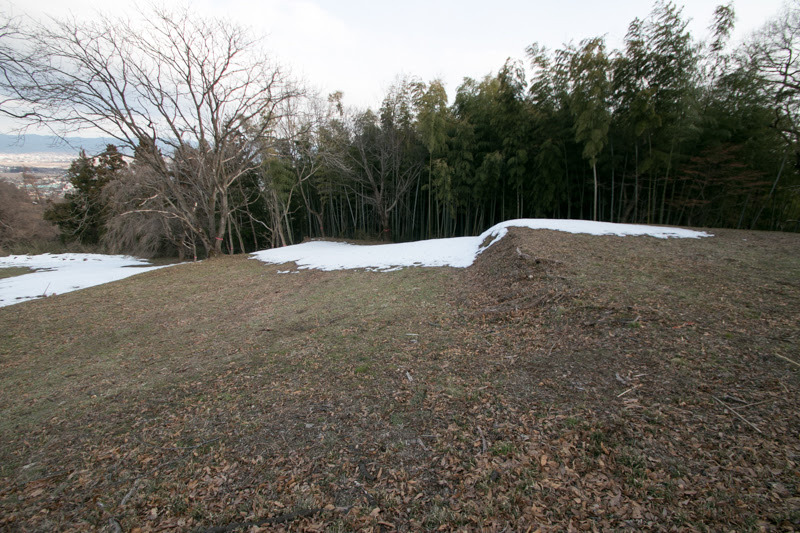 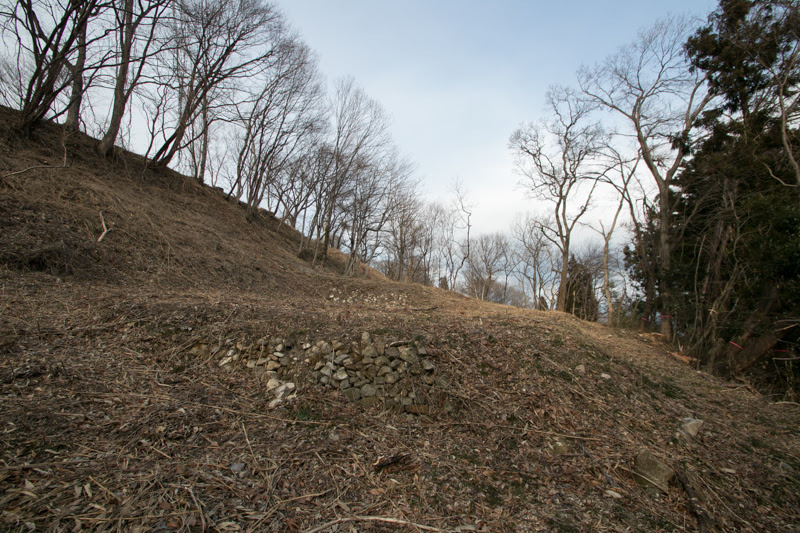 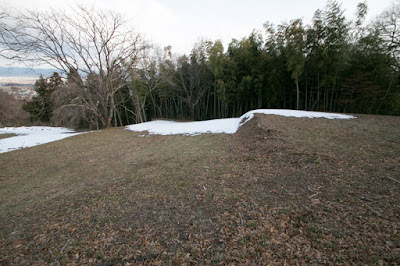 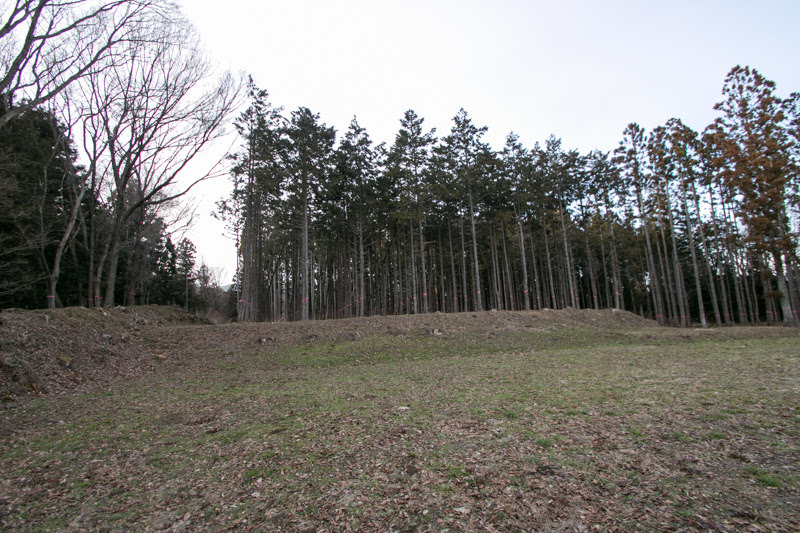 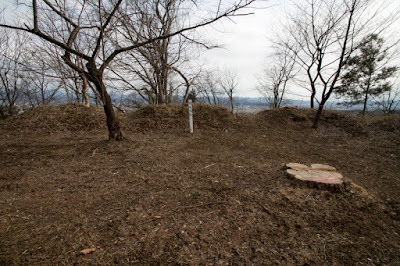 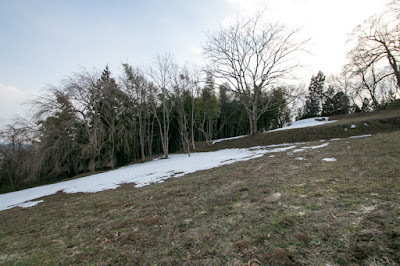 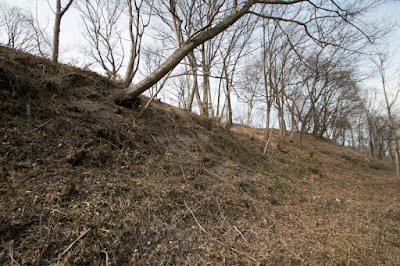 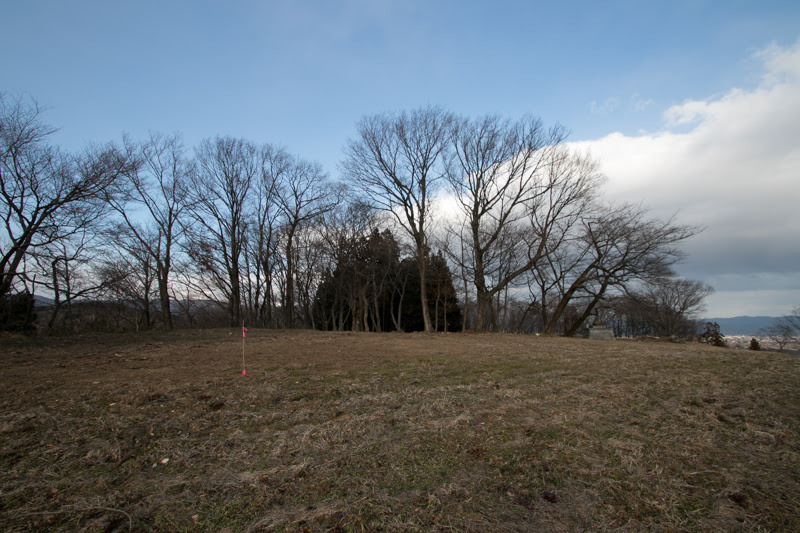 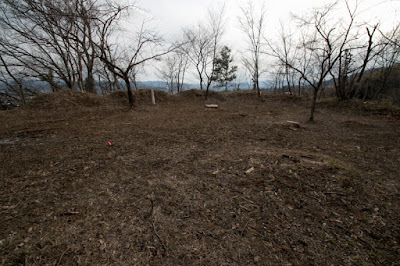 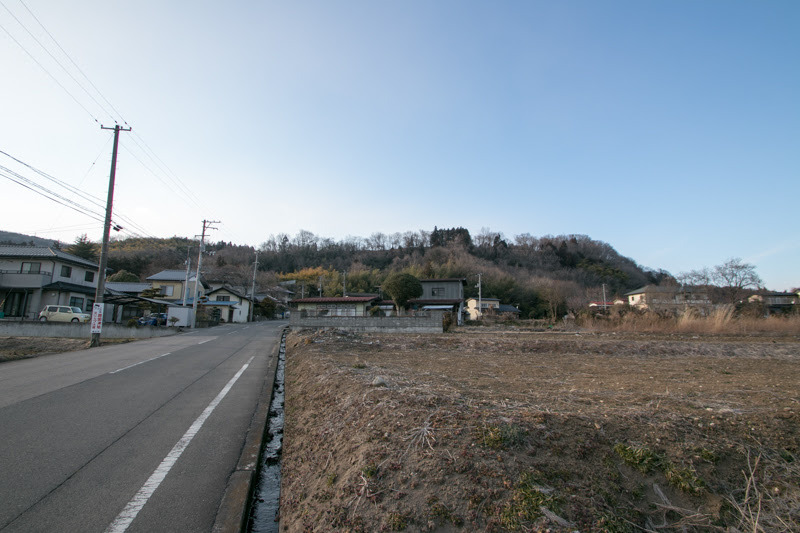 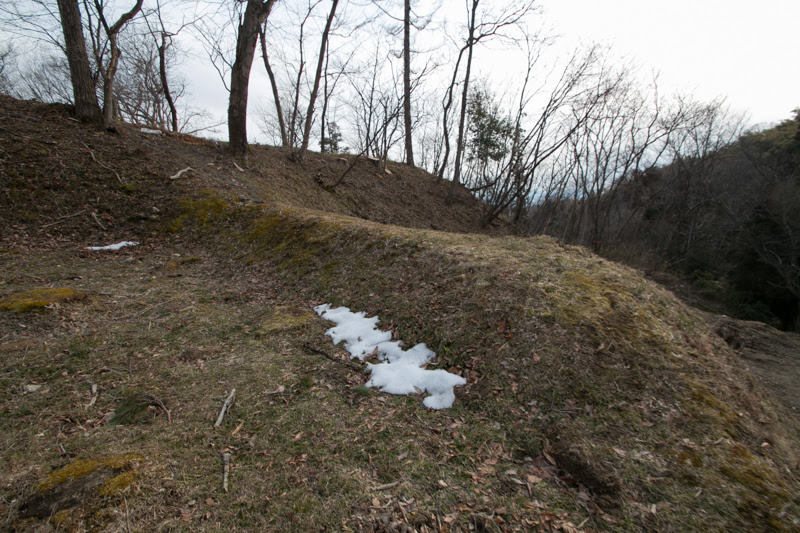 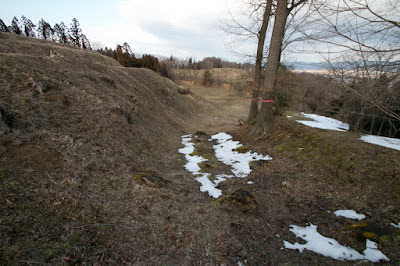 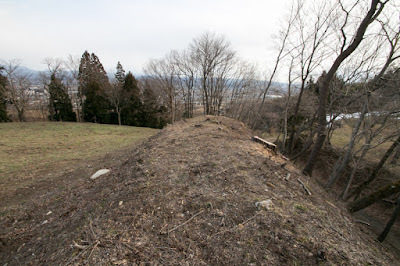 In addition to this geographical condition, castle site itself is a flat height protected by cliff and curved Ubugasawa river, it is an ideal place to build a castle as a main base. 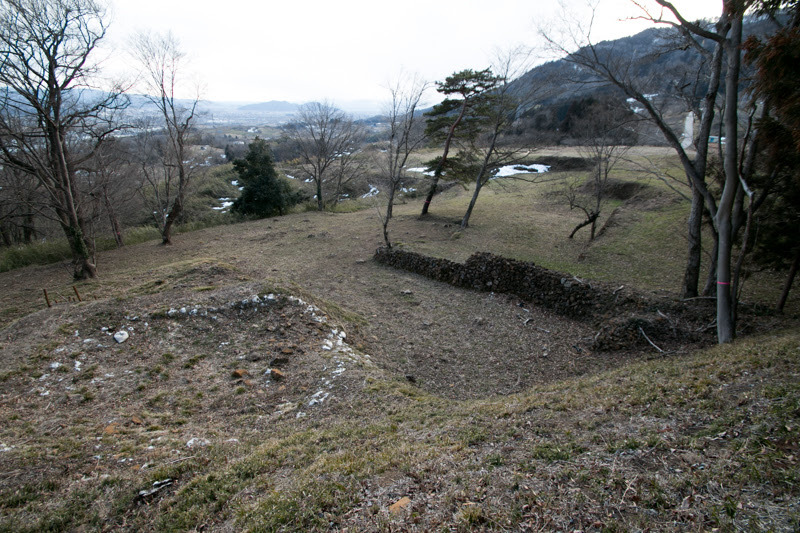 Same as the headquarter of current companies, main base of warlords were generally expected no to move frequently. 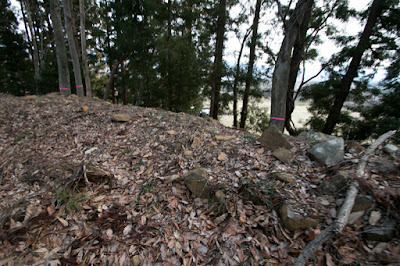 But if there is any reason to do so, warlords of course relocated it. 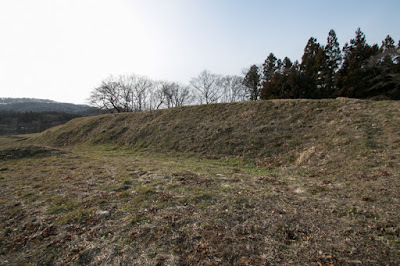 In general, if territory of a warlord significantly expanded, main base might be moved to the center of new territory to manage whole area efficiently. Contrary to this, if they lost former center but was not ruined, they had to move their base to other castle at remaining territory. 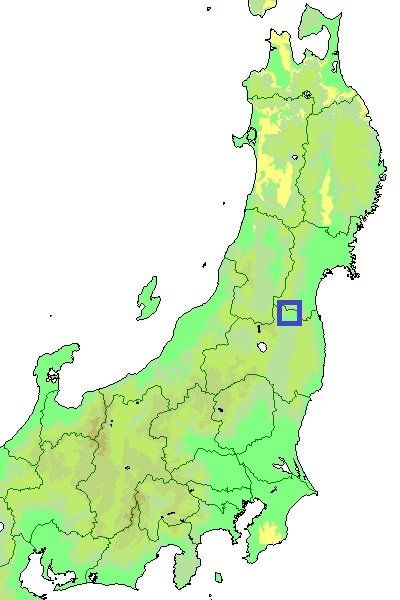 In addition to this geographical reason, there were also changes from political reason. If a warlord established centralized dominance at their territory, they often built new main base to show his authority and arrival of new era to retainers and resident. 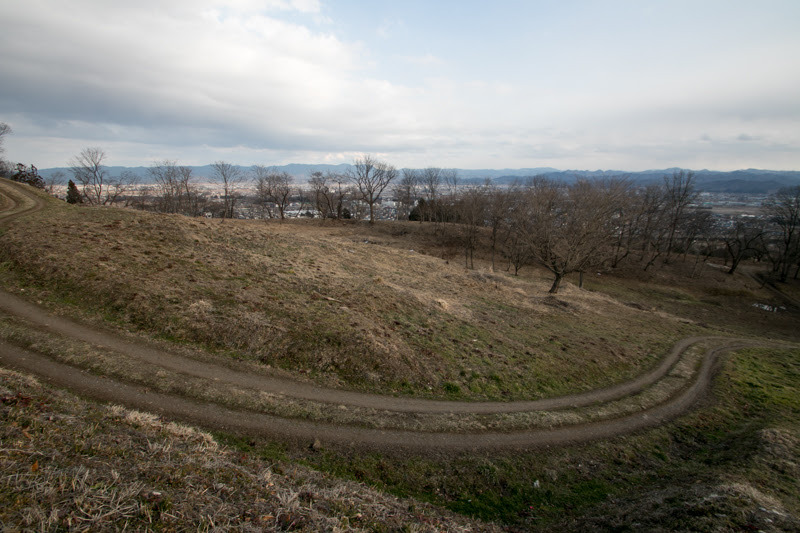 For the same case, at the settlement of severe internal conflict, the winner might change their main base to change the atmosphere of clan and make new start. Furthermore, under Toyotomi government and Edo Shogunate, many feudal lords were ordered to change their territory along with their main base. 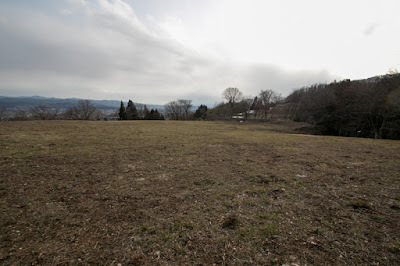 Of course practical reasons were the cause of relocation. At the beginning of Muromachi era many lords lived residences at flat land, but facing internal or external military pressure, they moved their main base to mountain castles to seek security. 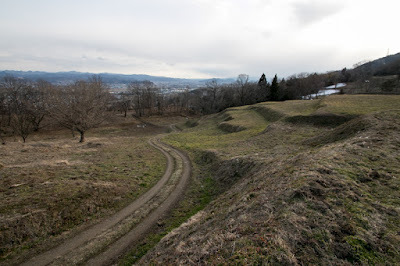 On the other hand, at the final stage of Sengoku period. 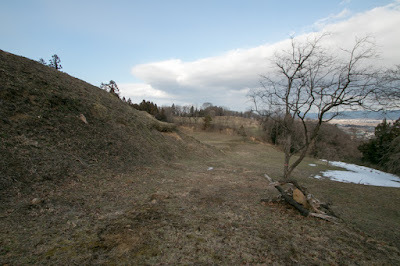 many warlords moved their main base from mountain castles to castles at flat area, as it became possible to protect castles at flat land by stone walls and matchlock guns, and to develop commercial town around the castle. 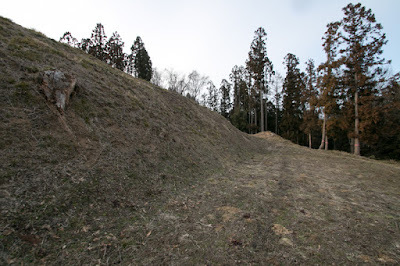 For example, Nobunaga Oda (1534-1582) who promoted from small local lord of Owari province (western half of Aichi prefecture) to central ruler changed his main base from Kiyosu castle to Komakiyama castle, Gifu castle and Azuchi castle along with significant expansion of territory. On the other hand, traditional warlords such as Takeda clan, Uesugi clan or Mouri clan did not change their main base in spite of expansion. 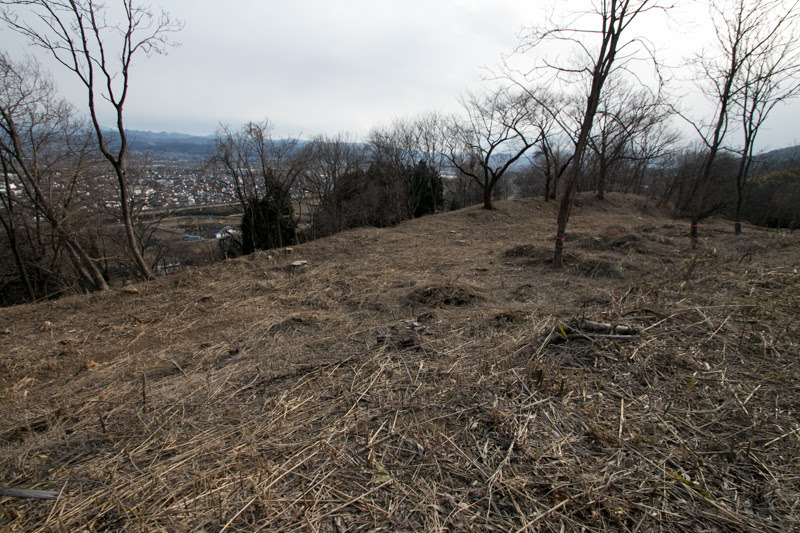 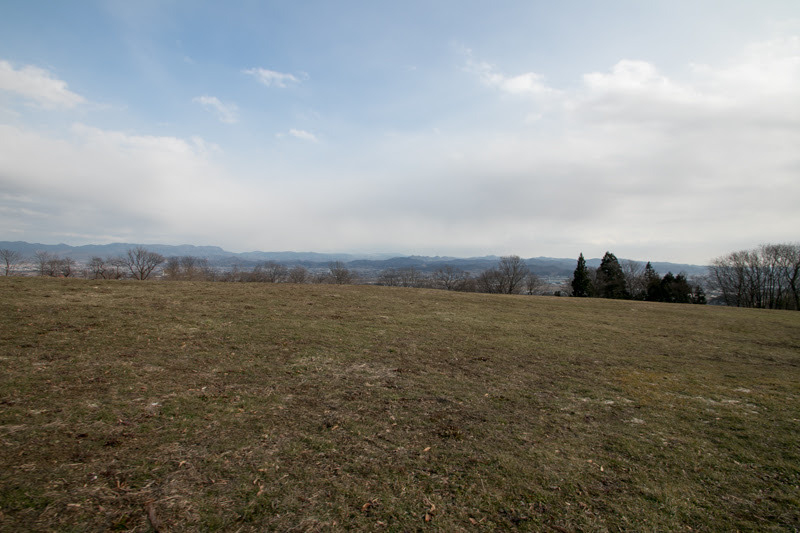 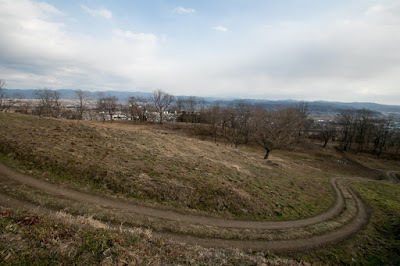 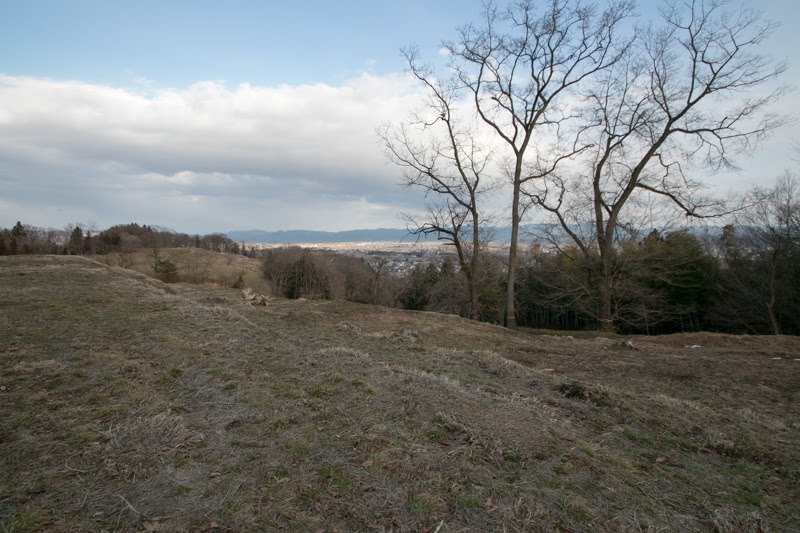 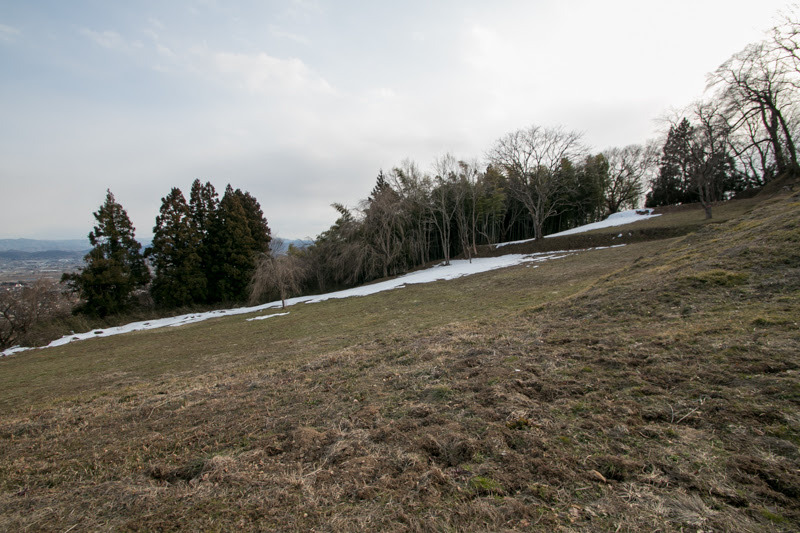 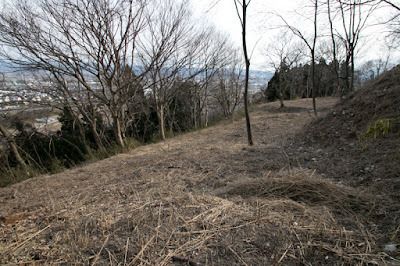 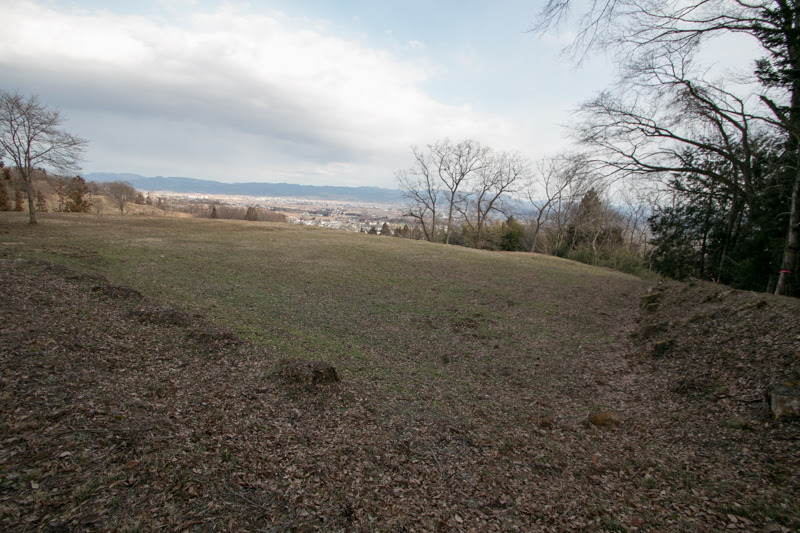 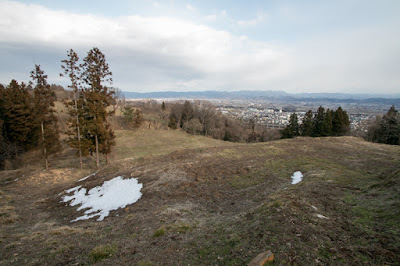 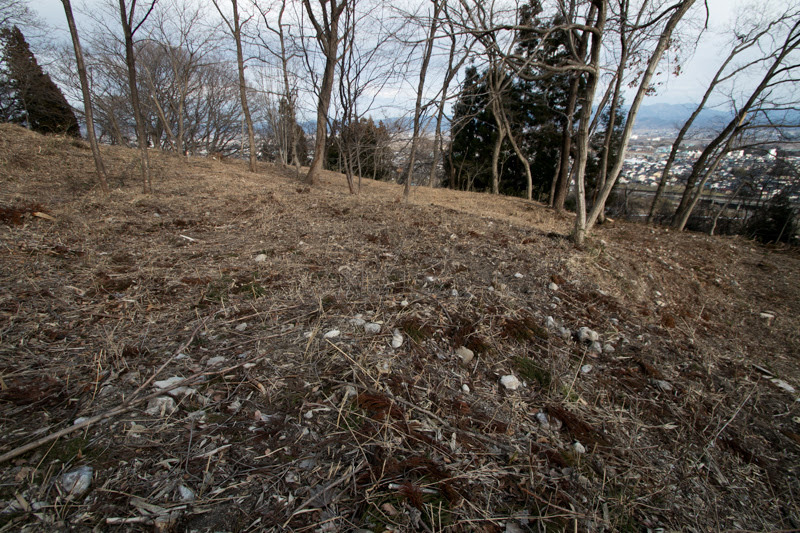 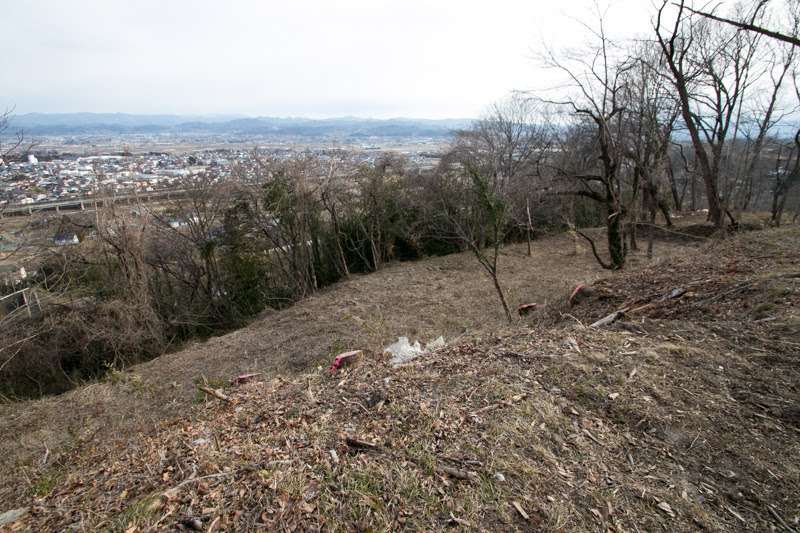 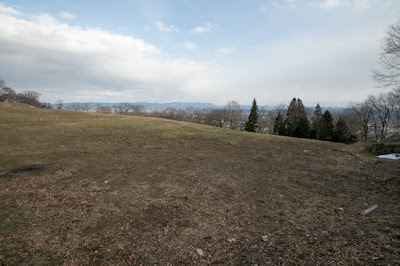 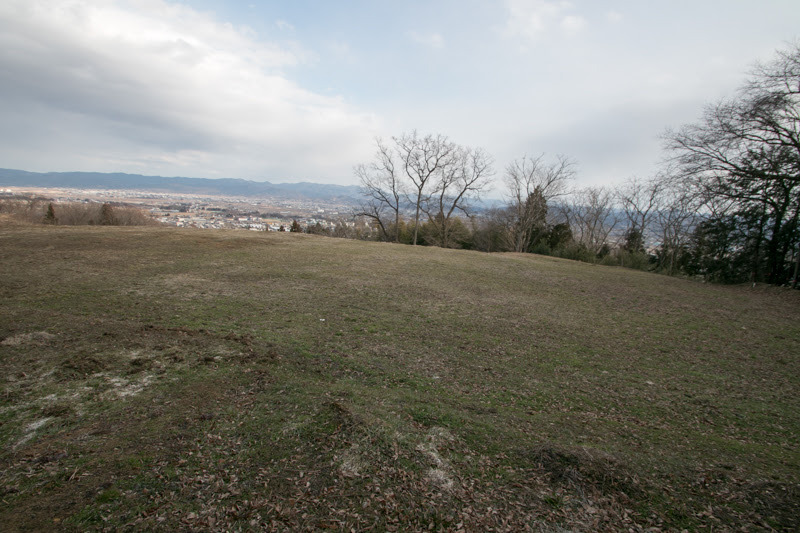 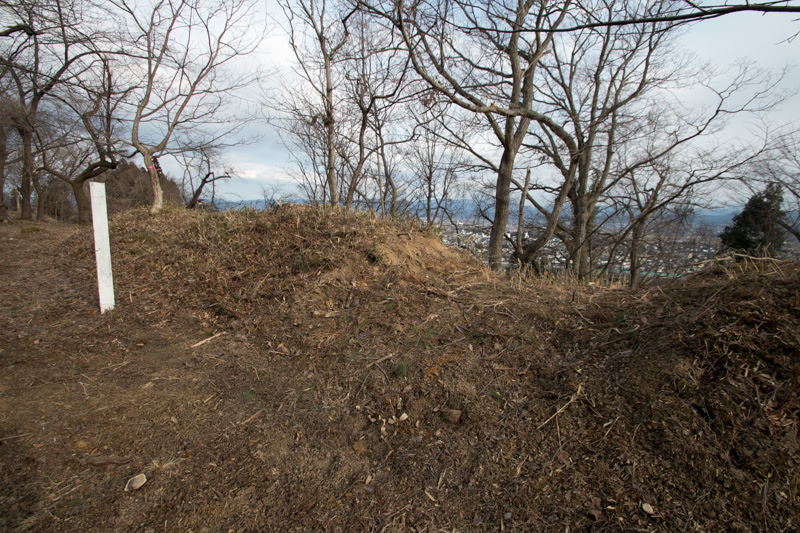 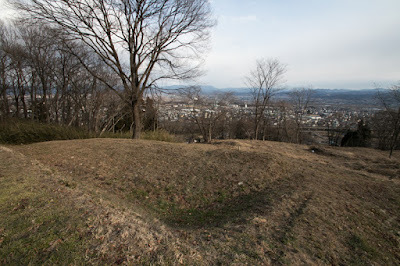 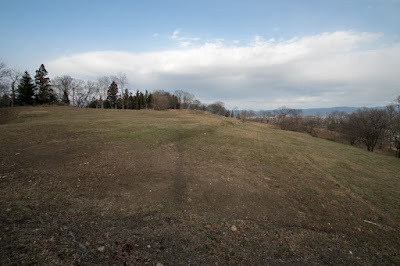 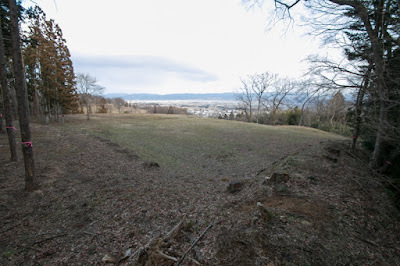 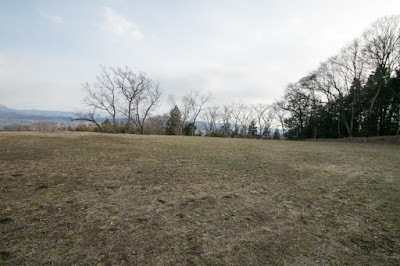 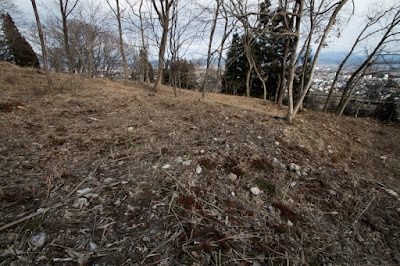 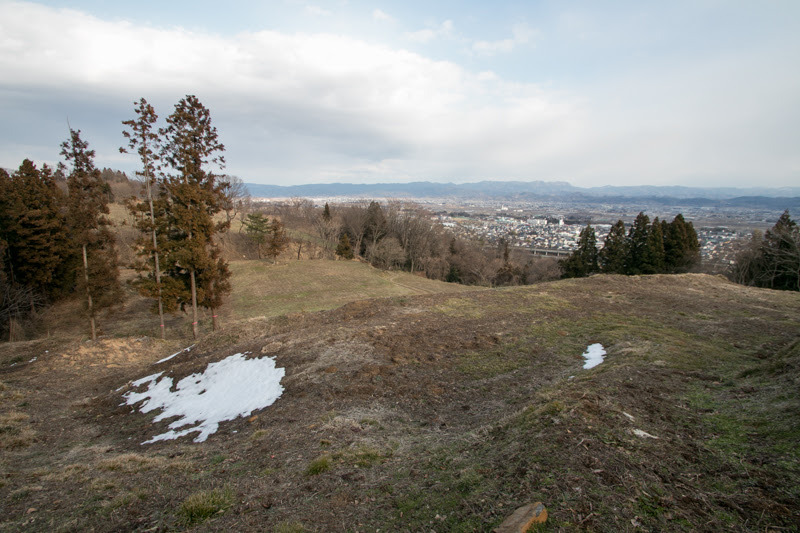 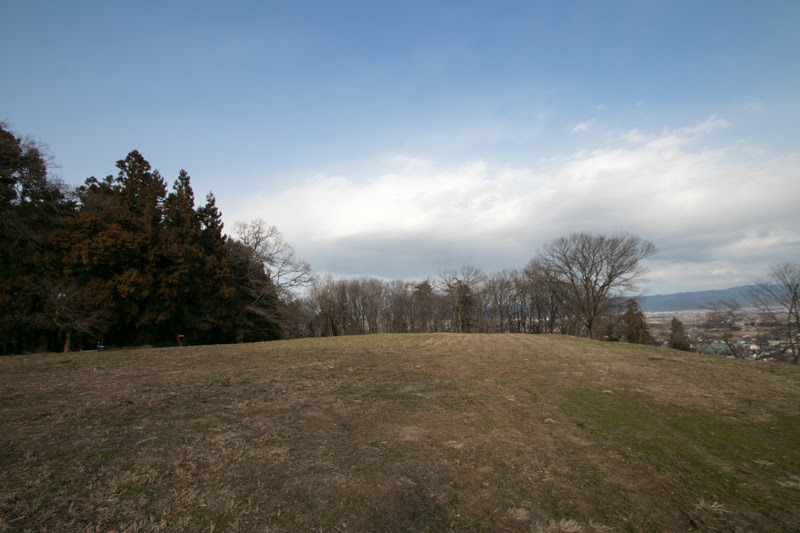 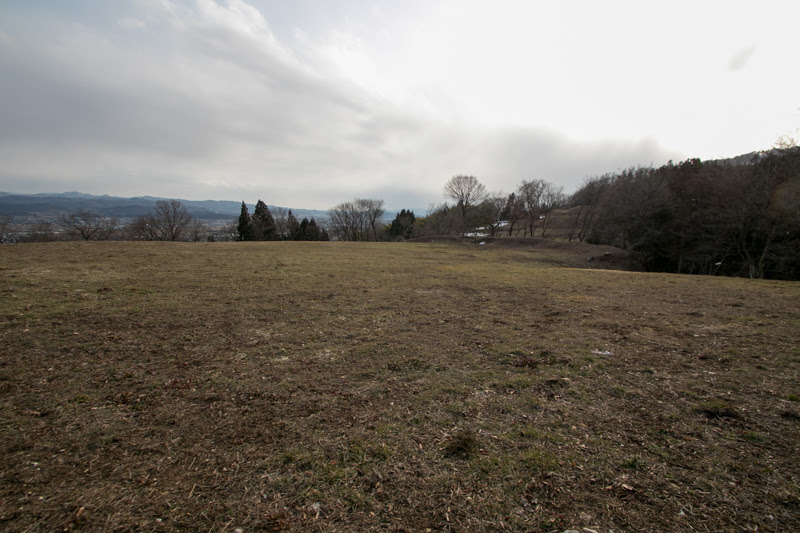 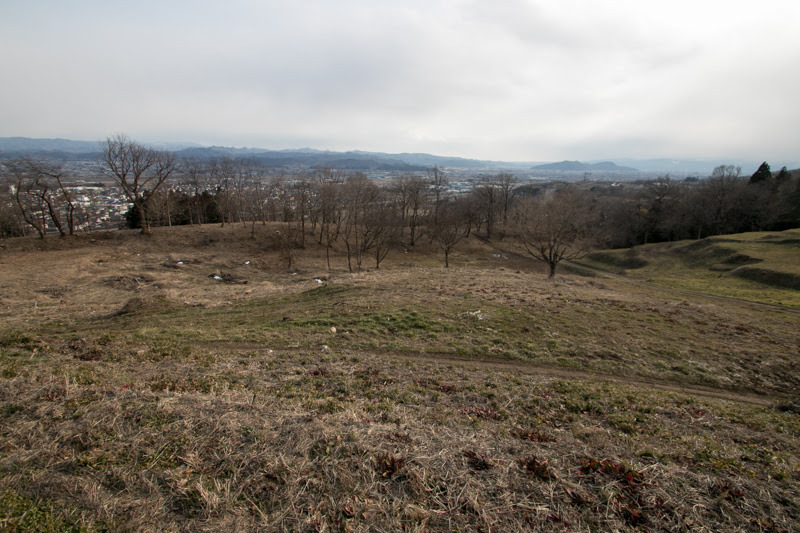 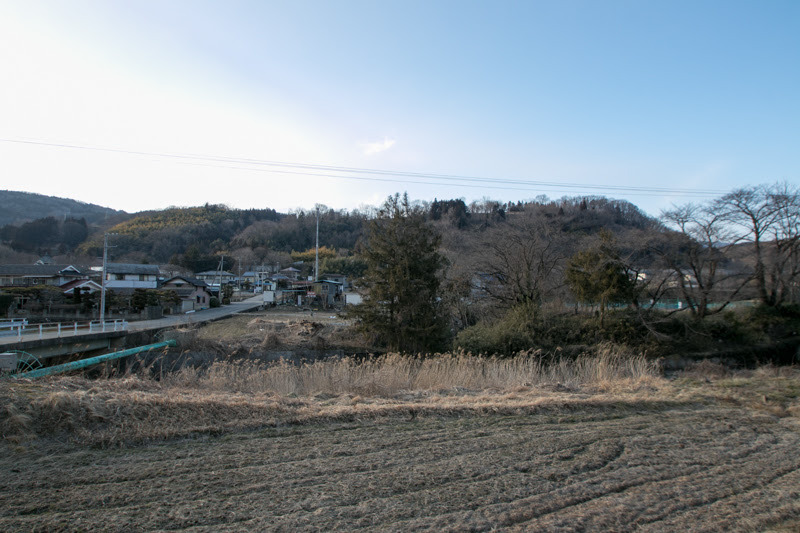 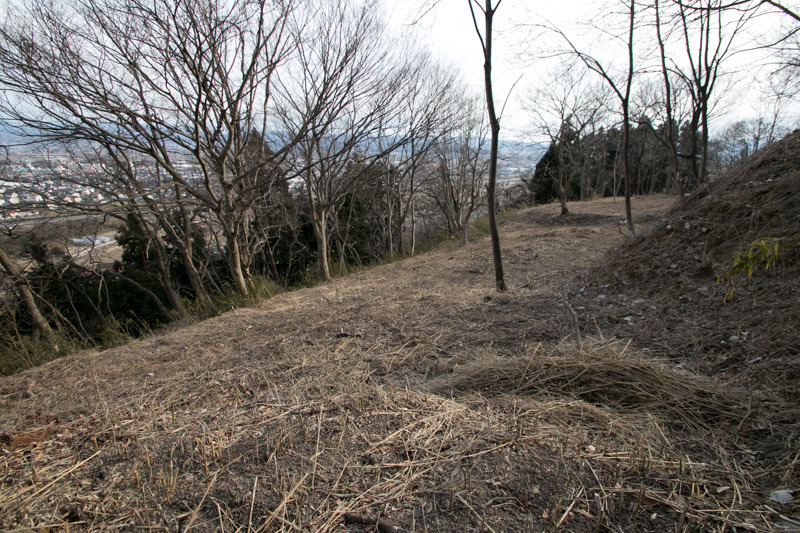 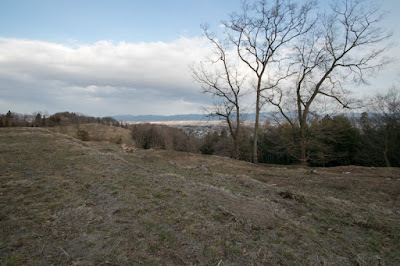 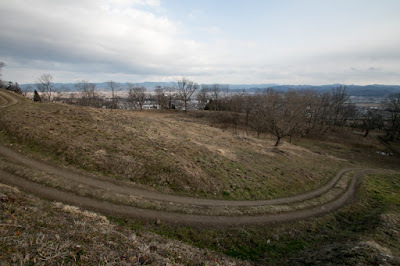 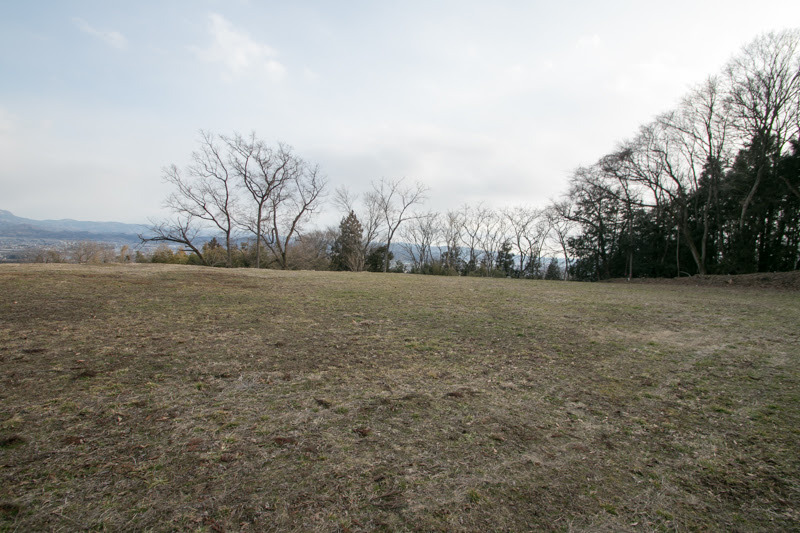 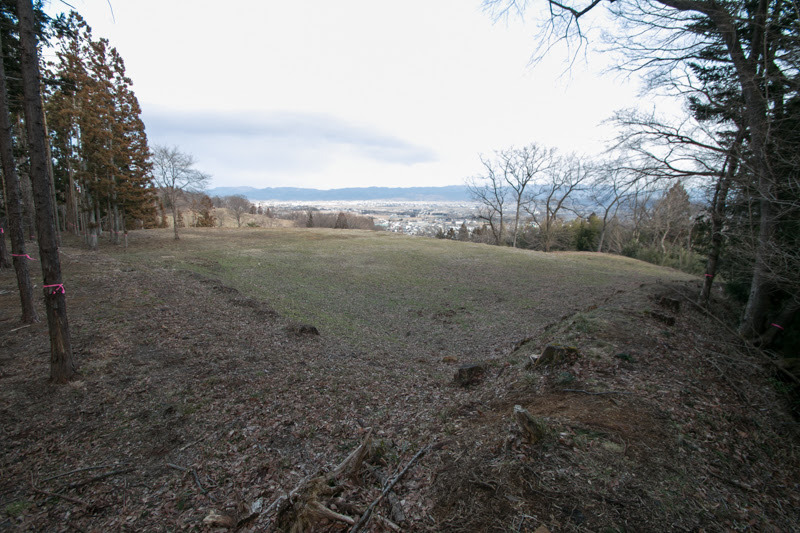 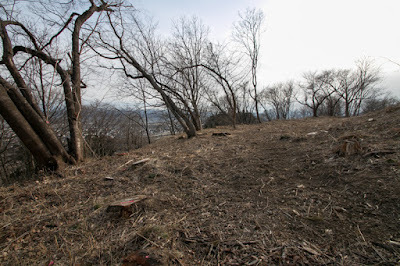 From this view point, Date clan which was a major warlord of Tohoku region, relocated their main base from Yanagawa castle to Kori Nishiyama castle, Yonezawa castle, Kurokawa castle, Iwadeyama castle and Sendai castle during 70 years from 1532 to 1601. 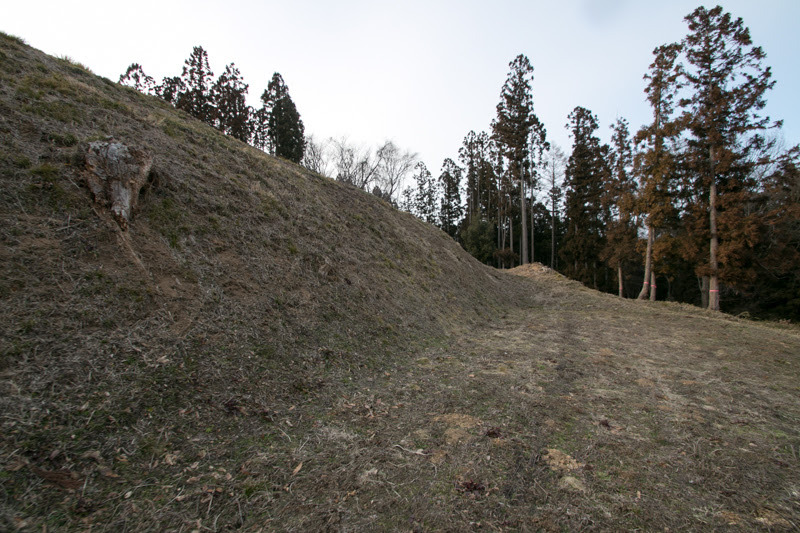 This record is an extraordinary one for local warlord along with Shimazu clan which changed their main base four times, which might be brought by internal, external and geographical reasons. 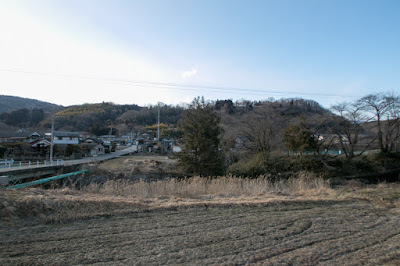 Date clan was originally a branch family of Isa clan, a local Samurai which at Hitachi province (Ibaraki prefecture) which was said as a descendant of central noble Fujiwara clan. 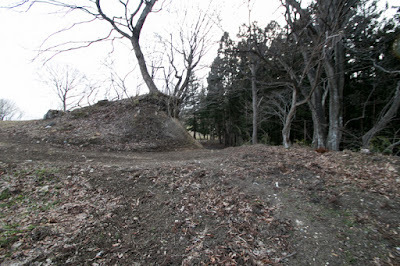 In the latter half of 12th century, Tamemune Isa (?-1221) served to Yoritomo Minamoto (1147-1199), the founder of Kamakura Shogunate, and daughter of Tamemune became the concubine of Yoritomo. 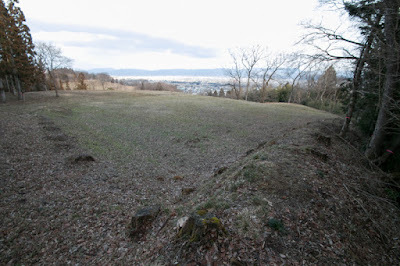 In 1589, Yoritomo Mimamoto, who already ruined Taira clan at the battle of Dannoura in 1585 and seized most part of Japan from Kanto region to Kyushu island, raised his army against Oshu Fujiwara clan, which semi-independently reigned north part of Tohoku region over 100 years. Oshu Fujiwara clan once hired Yoshitsune Minamoto (1159-1189), the younger brother of Yoritomo and made significant achievement at the battle against Taira clan but was expelled by Yoritomo, and also built a long clay wall at Atsukashi-yama mountain, just at the north of Kori Nishiyama castle to prevent the intrusion of Kamakura Shogunate army. 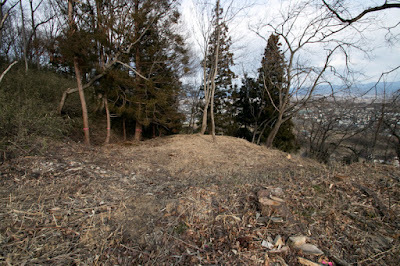 But after the change of leader, Oshu Fujiwara clan which faced pressure from Kamakura Shogunate killed Yoshitune and tried to subordinate to Kamakura Shogunate. 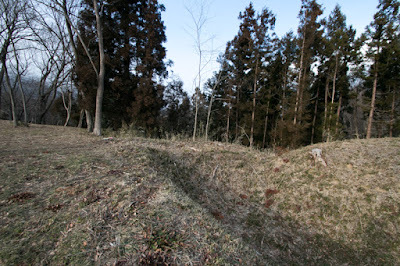 But Yoritomo did not admit this and lead large army toward Tohoku region. In August 1189, Tamemune Isa fought against Oshu Fujiwara army lead by its important retainer Sato clan and broke it, then opened the way to Fukushima basin. 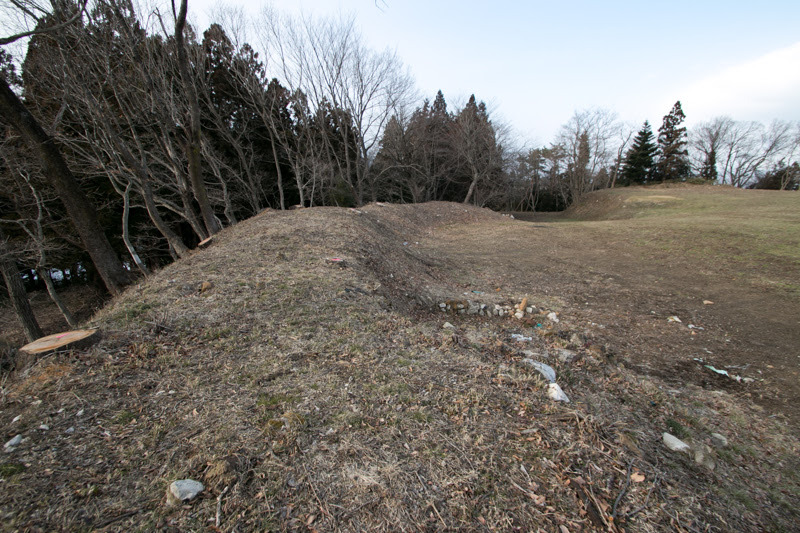 Furthermore, Yoritomo made total attack of the clay wall at Atsukashi-yama, and defense line of Oshu Fujiwara clan fell only in one day. By this defeat Oshu Fujiwara clan easily collapsed, and Yoritomo captured Tohoku region only in one week. 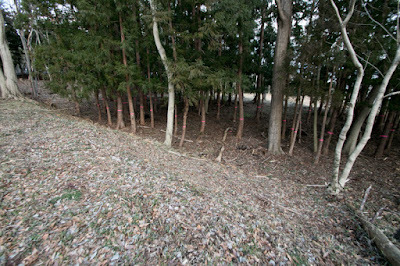 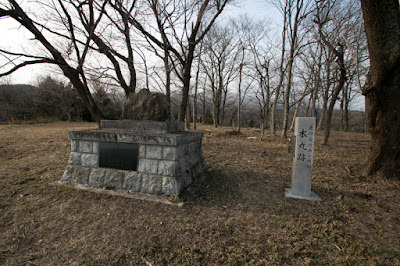 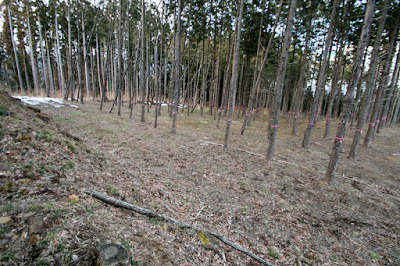 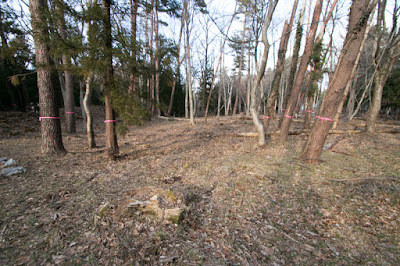 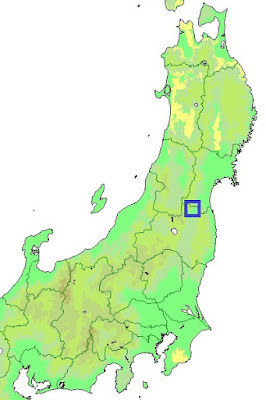 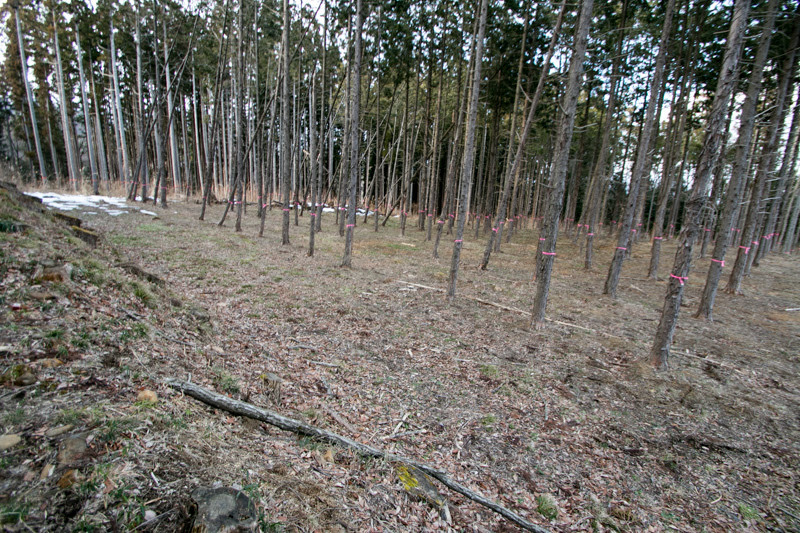 To reward the achievement of Isa clan, Yoritomo gave Date providence at north half of Fukushima basin. 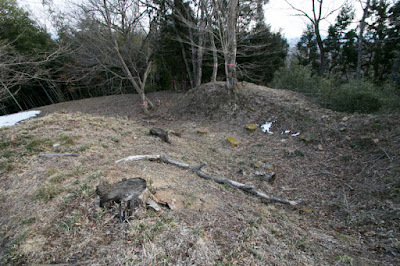 Later branch family of Isa clan moved to this territory and became the local lord then named as Date clan. 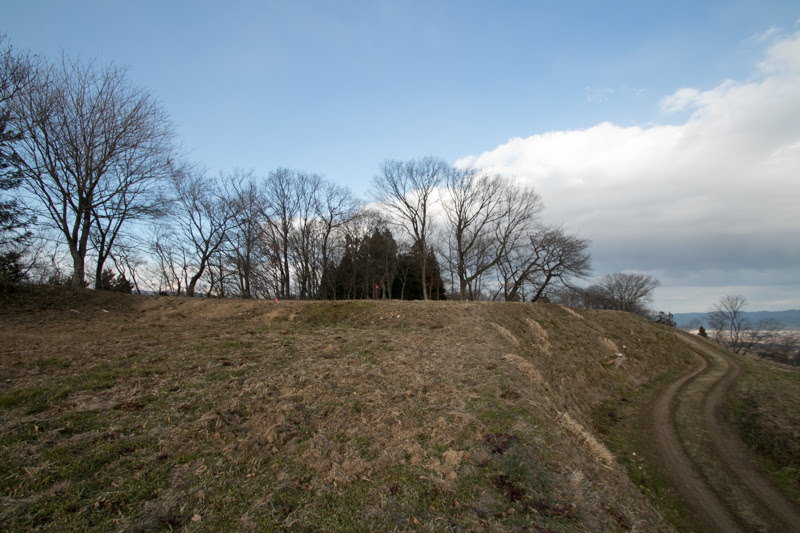 Date clan at first built Yanagawa castle at eastern riverside of Abukuma-gawa river. 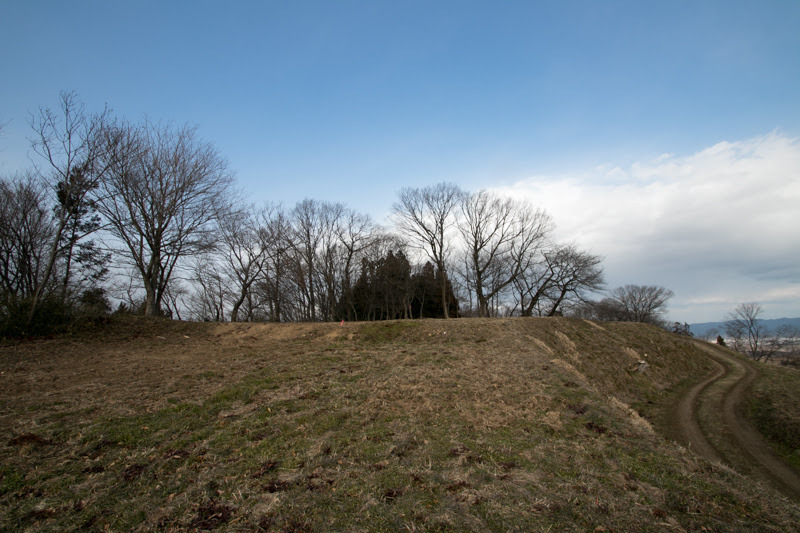 At the fall of Kamakura Shogunate in 1333, Date clan once belonged to South Court of Emperor Godaigo (1288-1339) and followed Akiie Kitabatake (1318-1338) who was sent as the general commander of Tohoku region by Emperor. 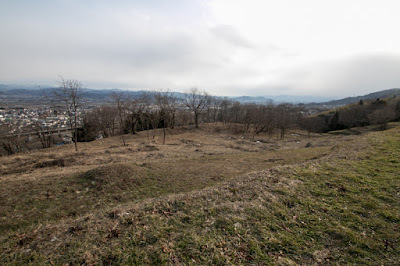 Date clan followed two time long expedition of Akiie from Tohoku region to Kyoto city, and Akiie once moved his main base from Takajo castle to Ryozen castle, a mountain base at the territory of Date clan. But looking at inferior situation of South Court, Date clan turned to Muromachi Shogunate. 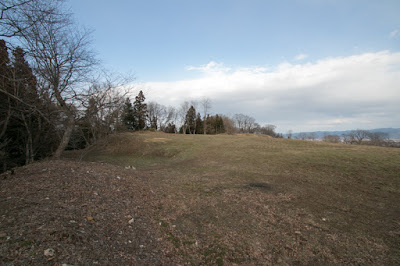 Once Date clan followed to Osaki clan, a relative of Muromachi Shogunate and general governor of Tohoku region, but Date clan made connection to Shogunate directly and continues expansion by their own will. 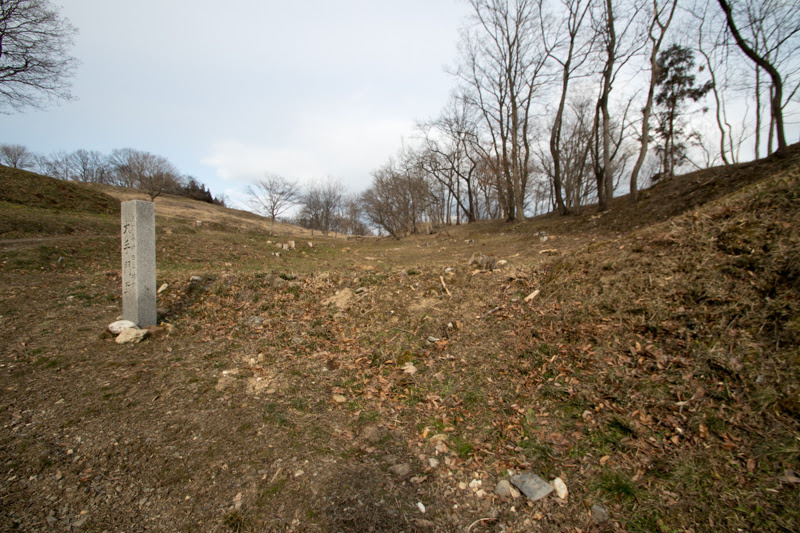 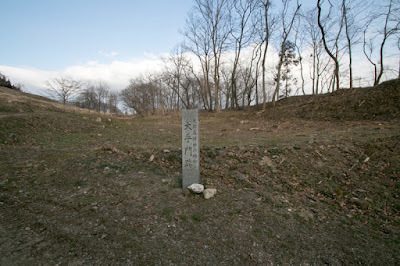 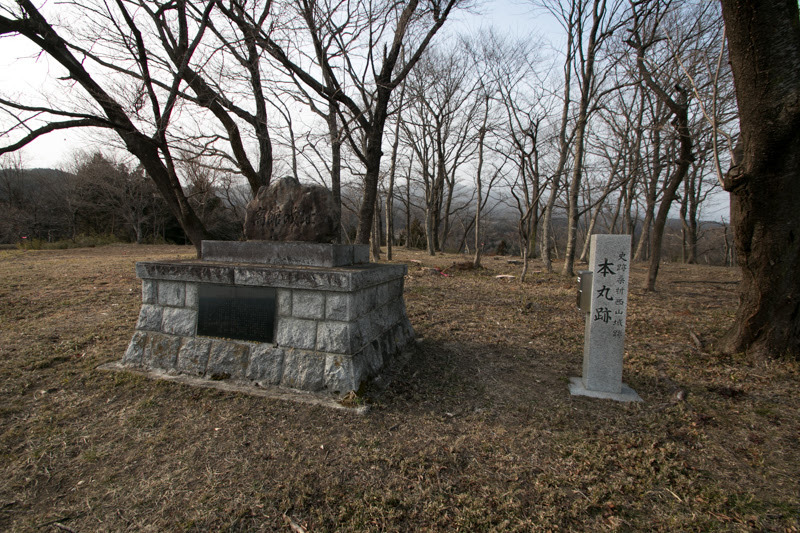 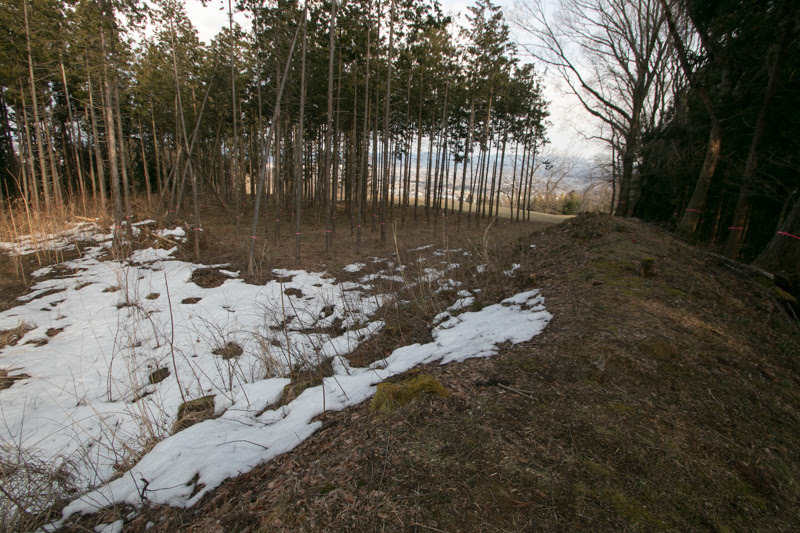 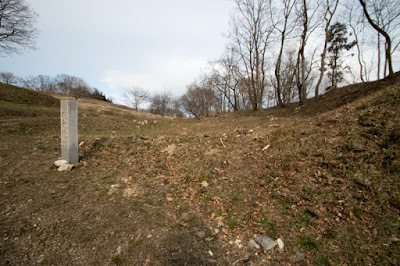 At the time of Munetoo Date (1324-1385), Date clan advanced into south part of Dewa province (Yamagata prefecture) across Oshu mountain, and captured Yonezawa basin defeating Nagai clan. 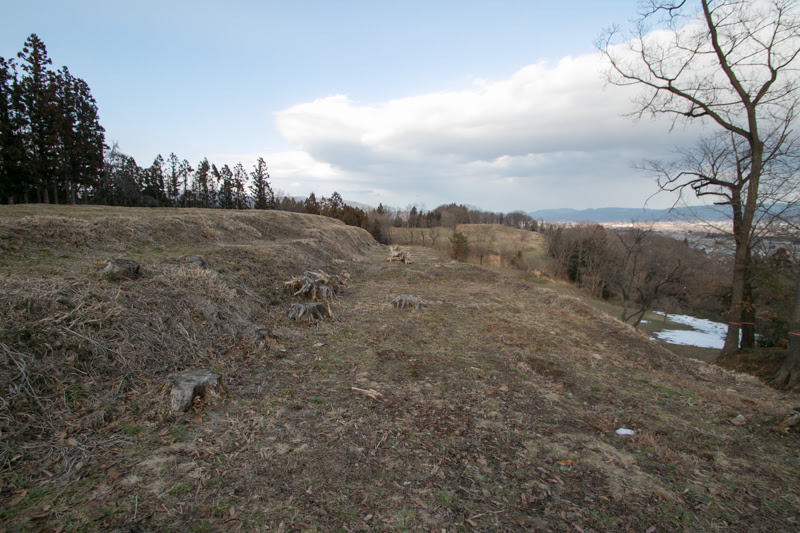 Further, Date clan fought with Osaki clan and expanded their authority to local lords at south part of current Miyagi prefecture, such as Rusu clan or Kokubu clan. 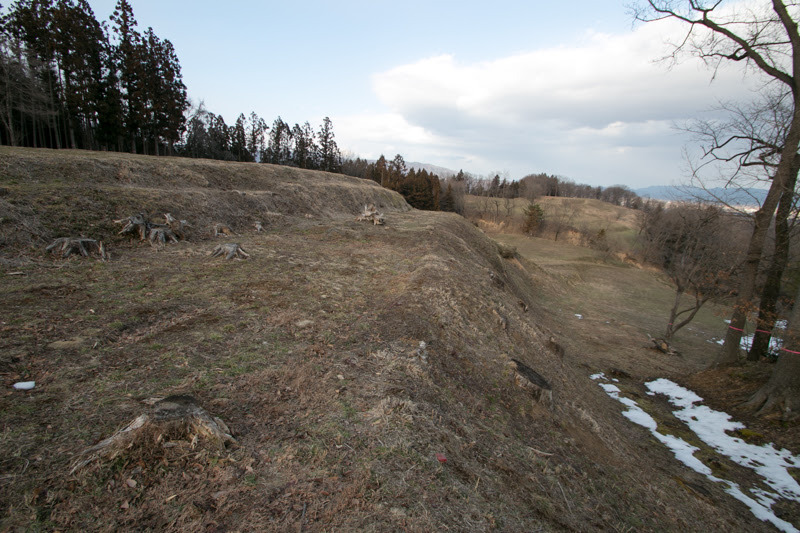 Facing repellence of surrounding lords or Shogunate, Date clan grew into the prominent local lord at Tohoku region by the end of 15th century. 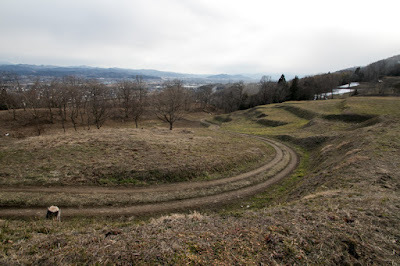 At the beginning of 16th century, Tanemune Date (1488-1565) continued expansion into surrounding areas, and once dominated Mogami clan at Yamagata basin. Tanemune achieved the position of general governor at Tohoku region, and produced their providential rule "Jinkaishu" and strengthened his control to the clan. Tanemune also moved his main base from Yanagawa castle to Kori Nishiyama castle built in 1532, to show his authority. 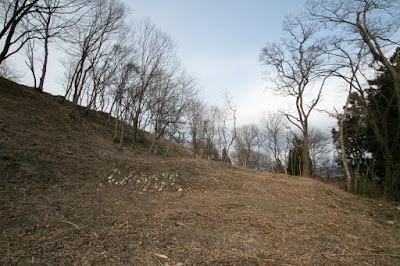 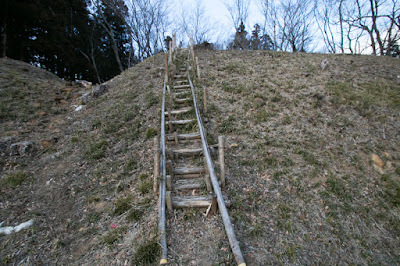 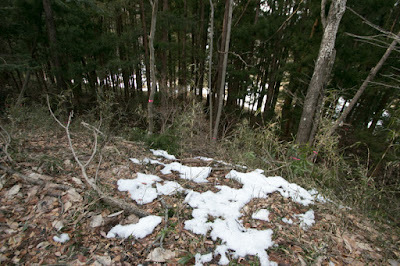 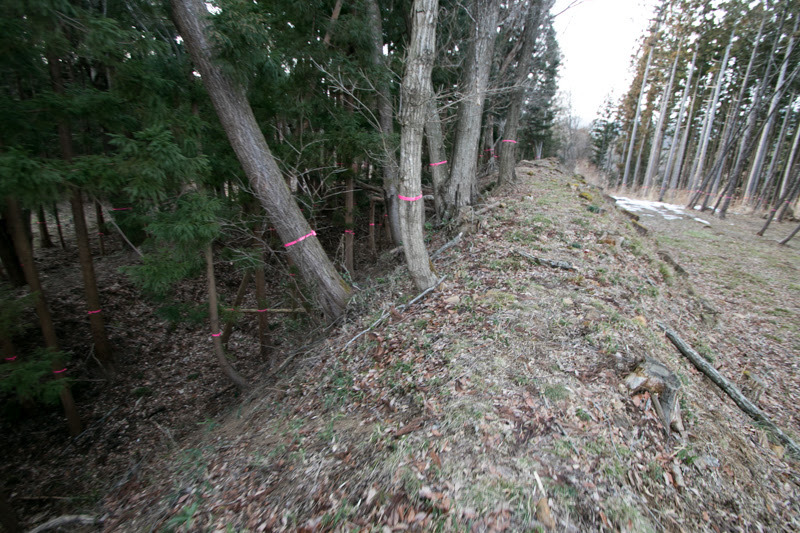 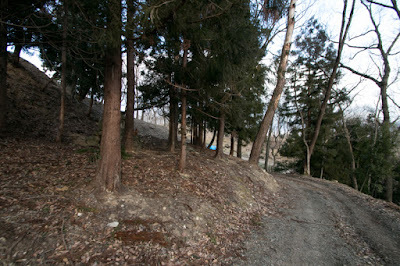 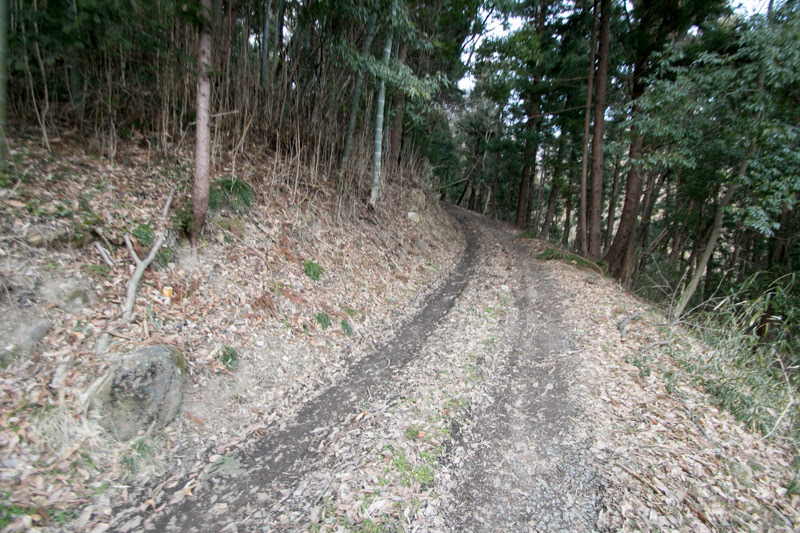 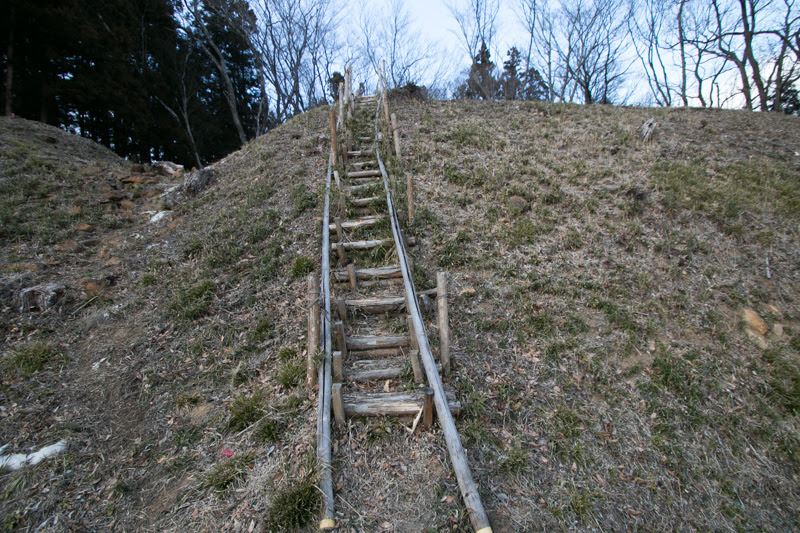 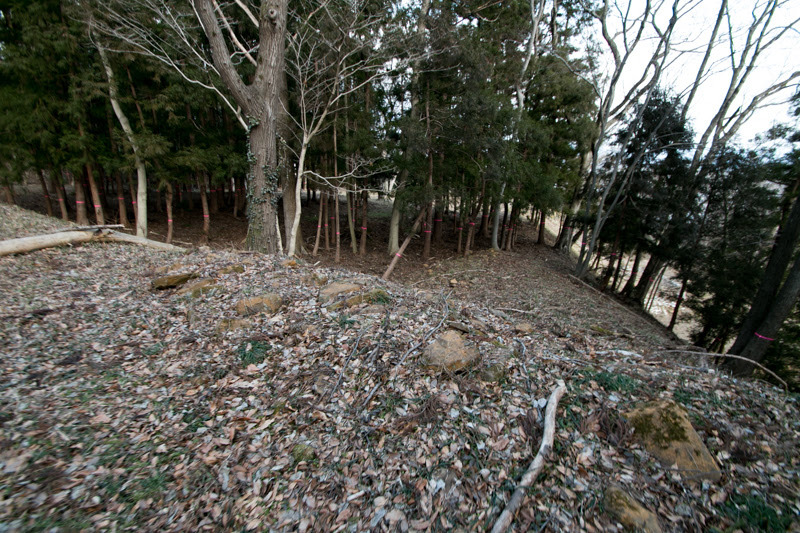 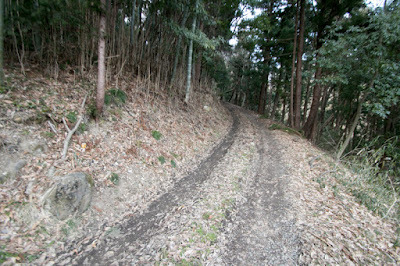 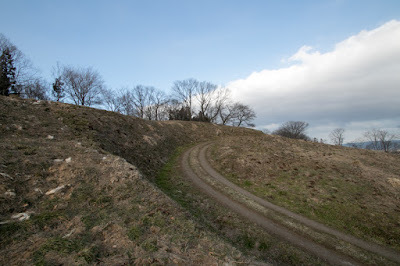 Kori Nishiyama castle is built over gentle slope of Takadate-yama mountain over 600 meter long and 200 meter wide. 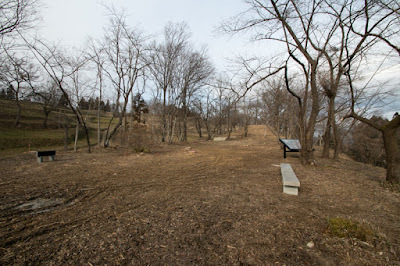 Whole shape of the castle is a ship like long and narrow flat area, being separated into five areas by dry moats or height gap consist of eastern two terraces, one connecting part and western two terraces. Eastern part of the castle has a old style with layers of small terraces, and might be built at first. 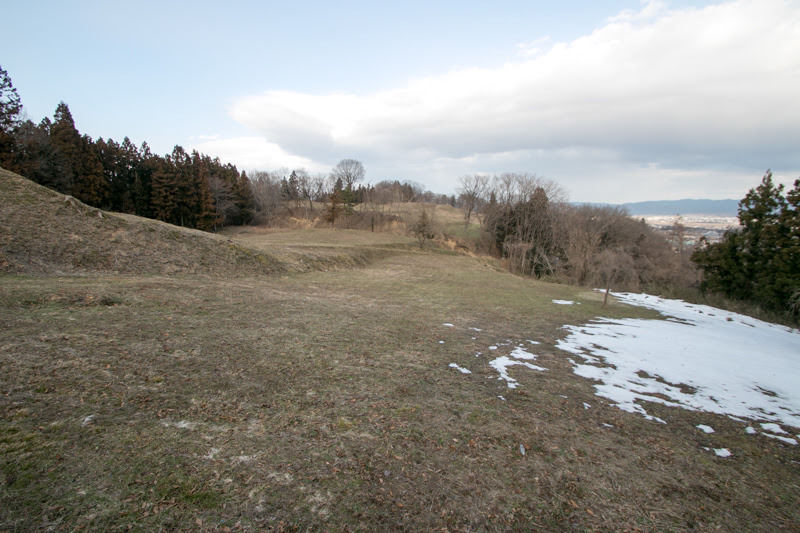 Central area of the castle is a long and narrow flat terrace of 100 meter long and 20 meter height, at the eastern edge of the ridge. 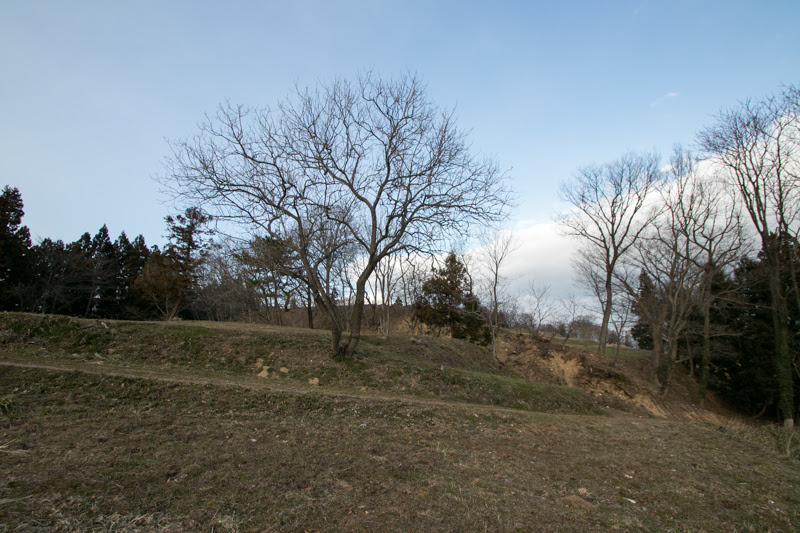 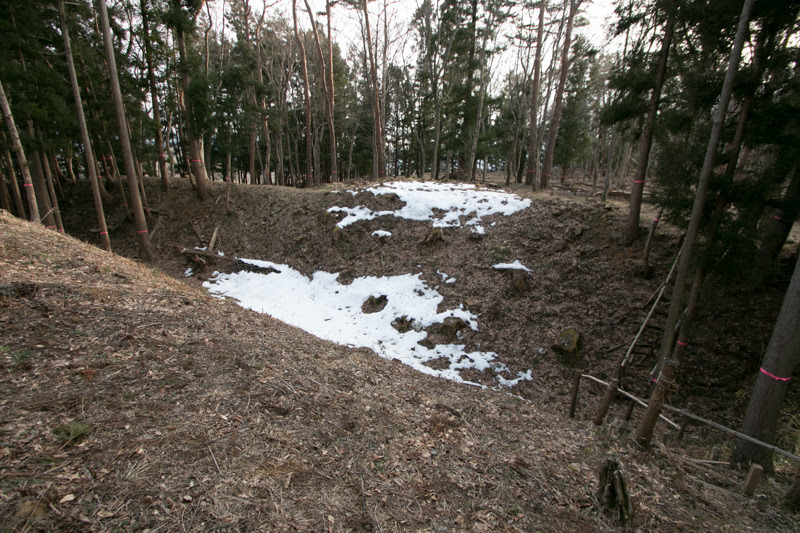 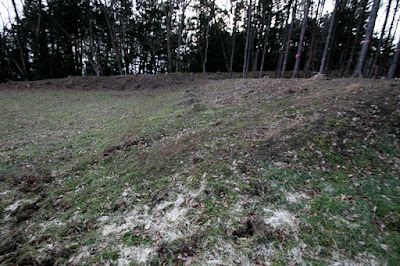 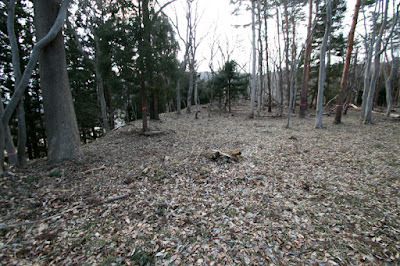 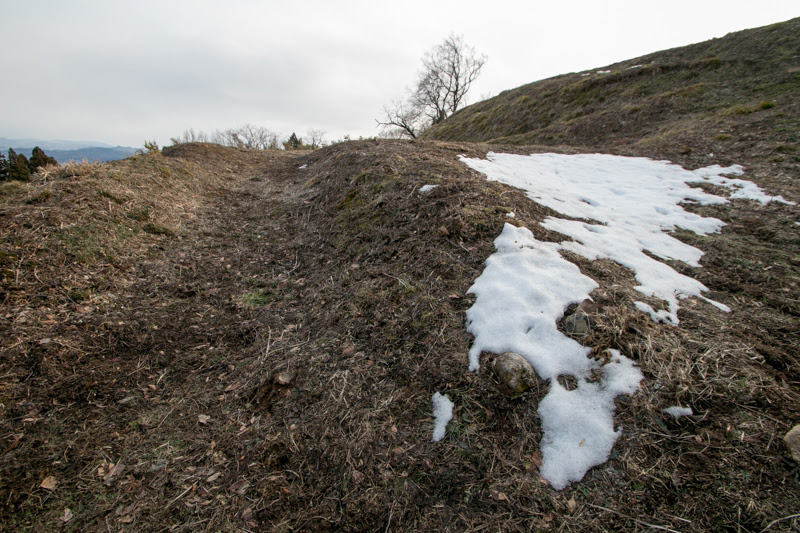 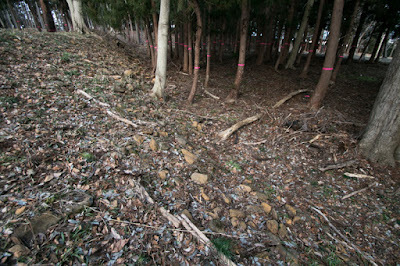 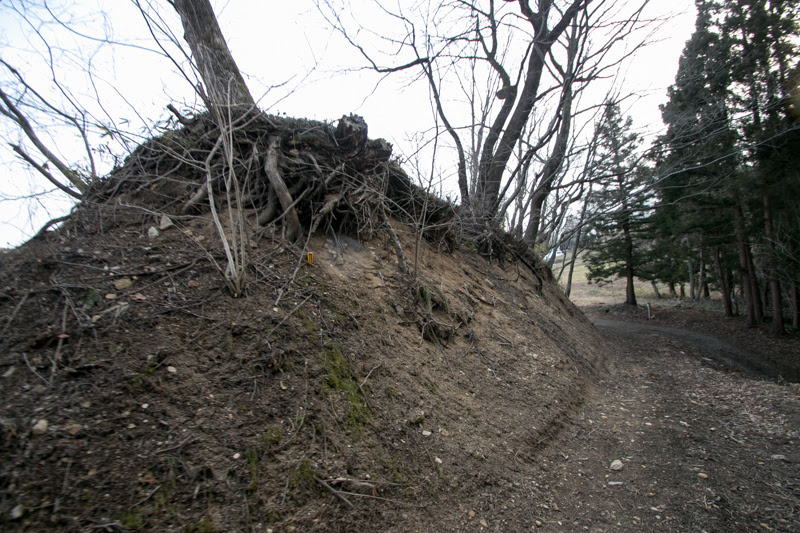 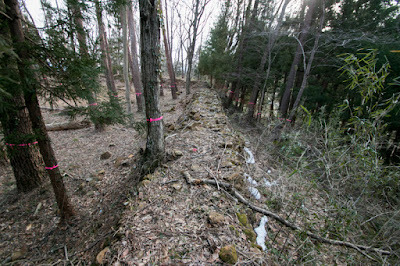 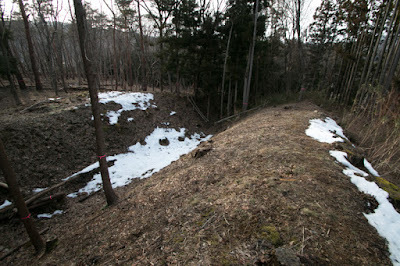 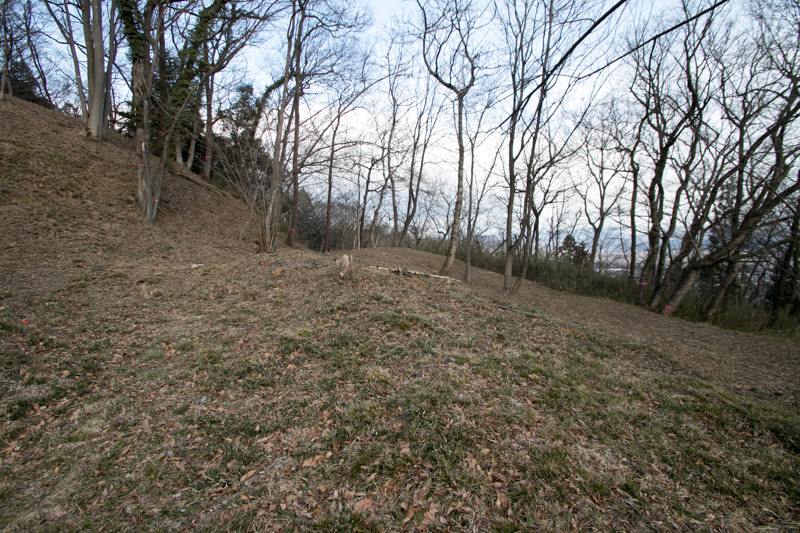 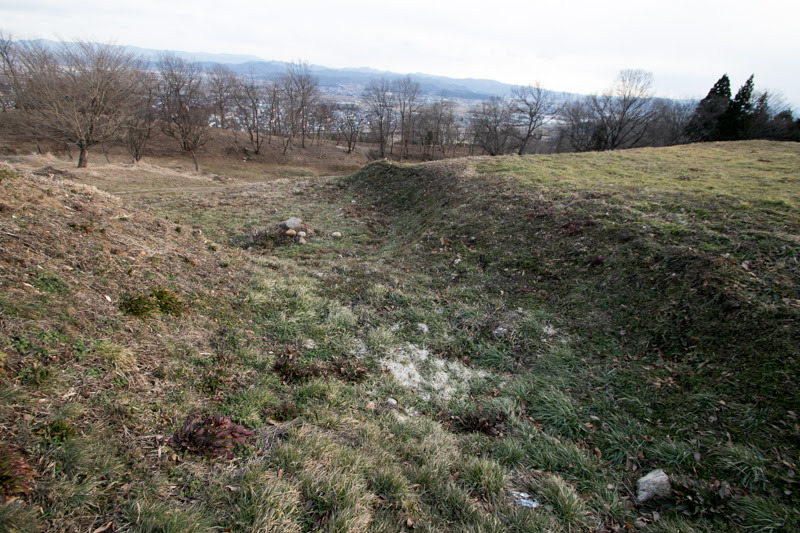 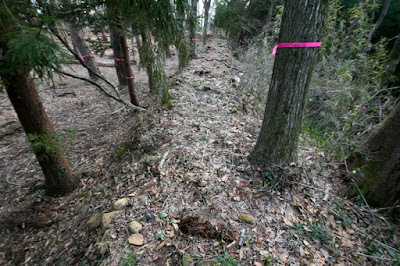 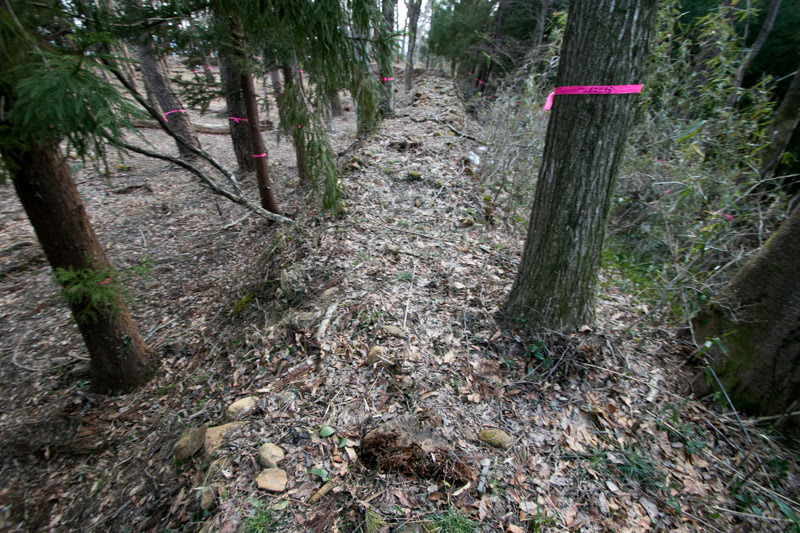 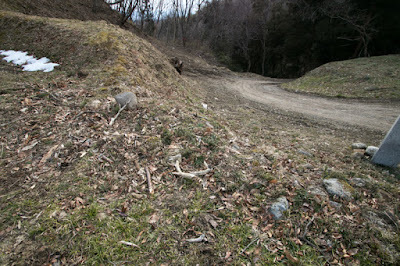 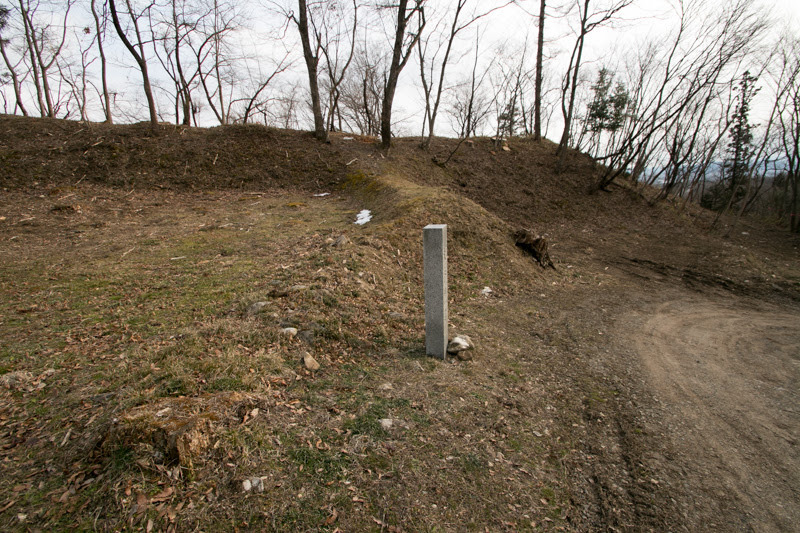 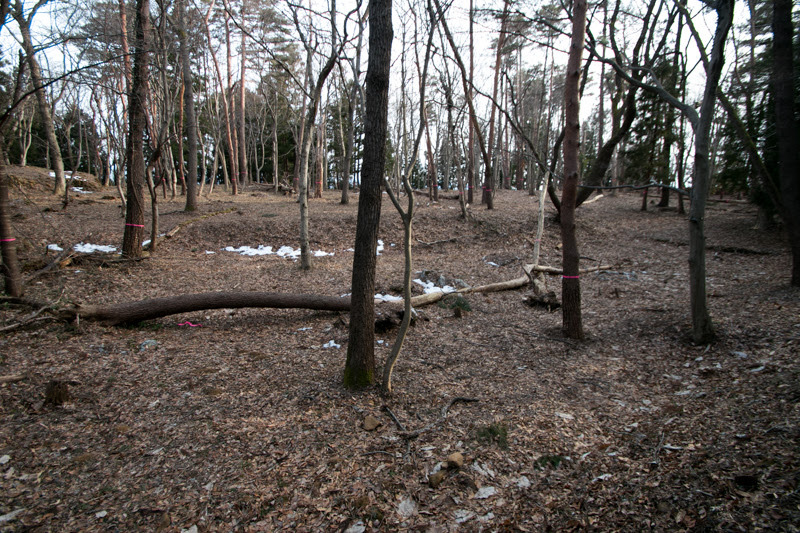 Ahead of dry moat, there is the secondary area of about 100 meter long square, which is surrounded by clay walls. 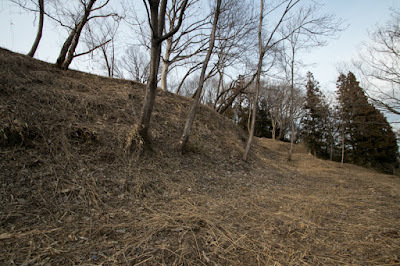 Small valley at the south of central area and secondary area is used as a camping and storage space. 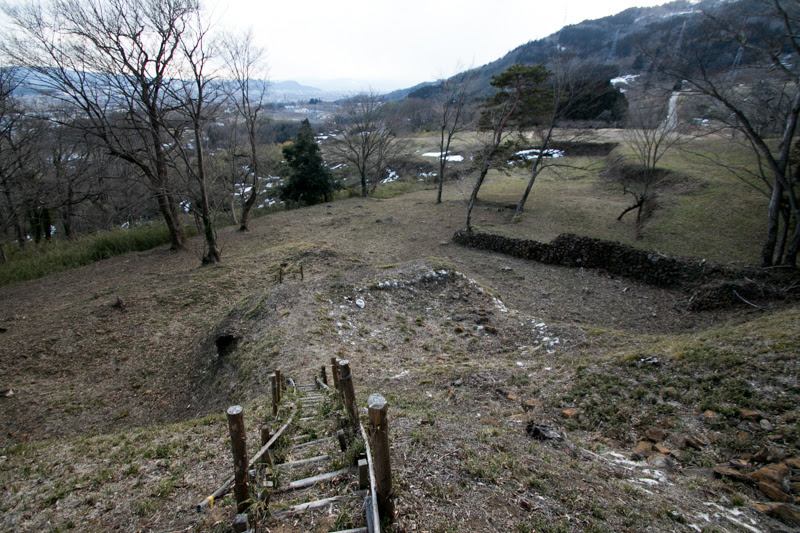 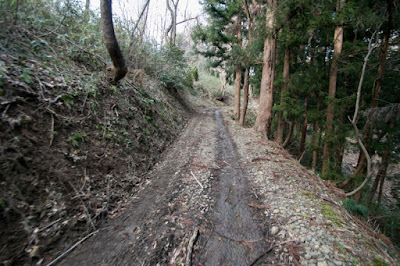 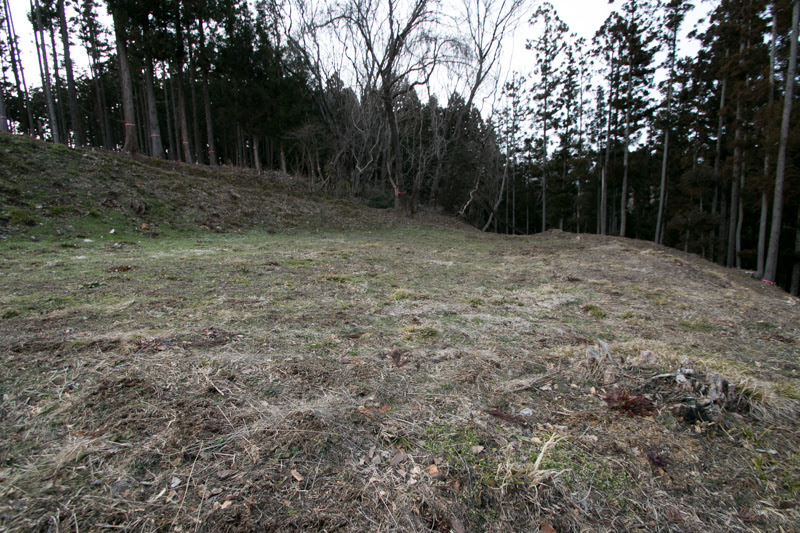 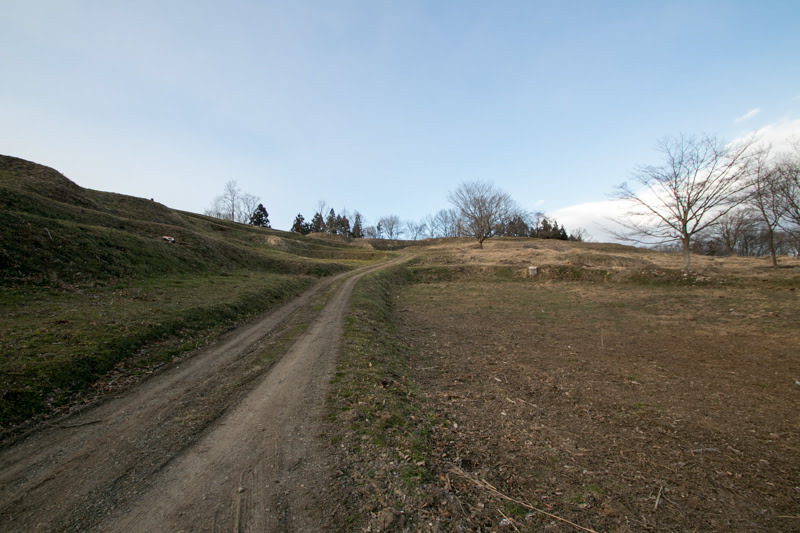 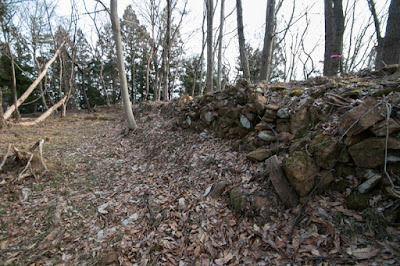 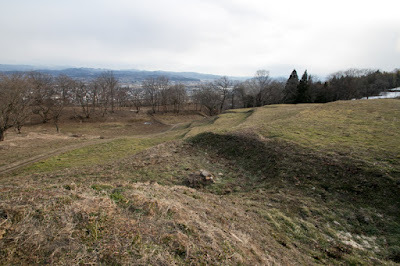 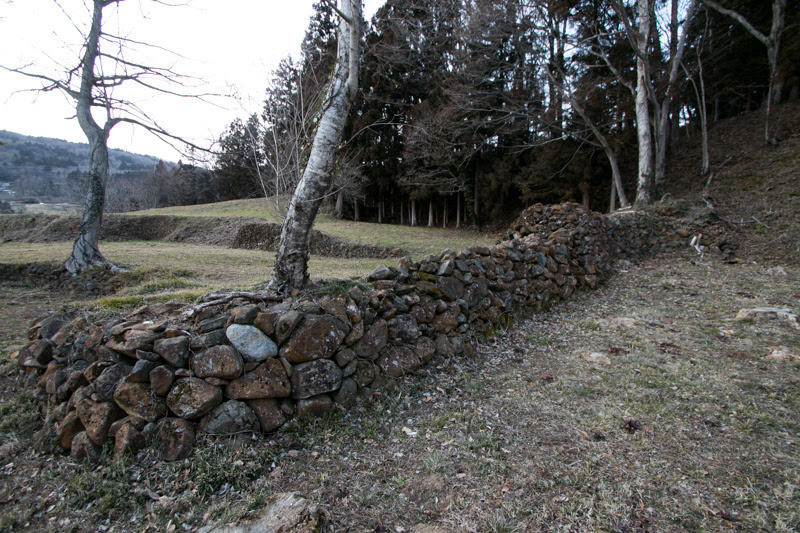 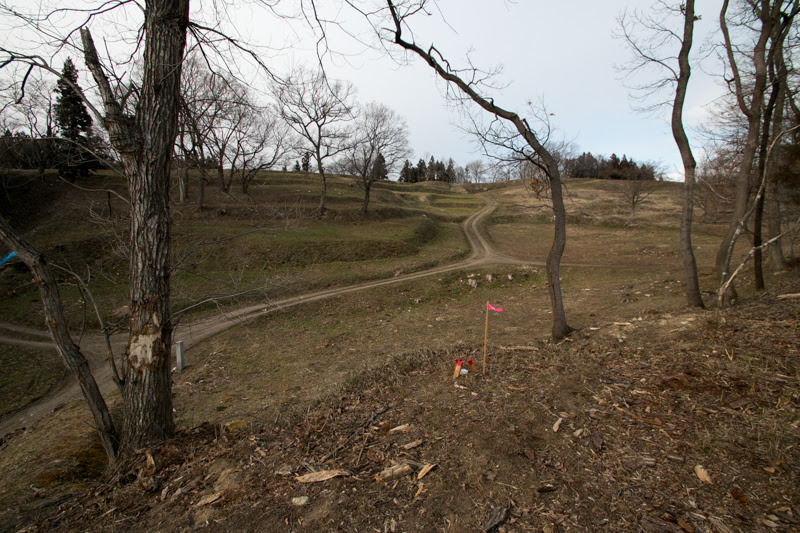 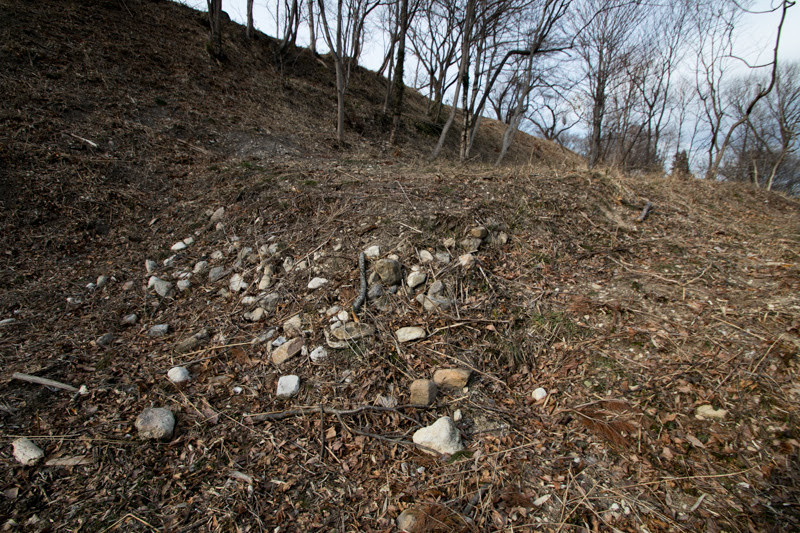 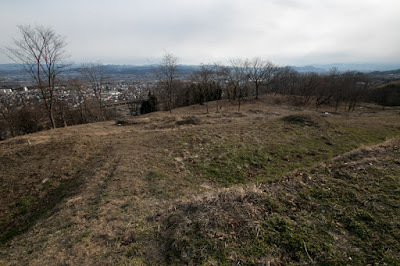 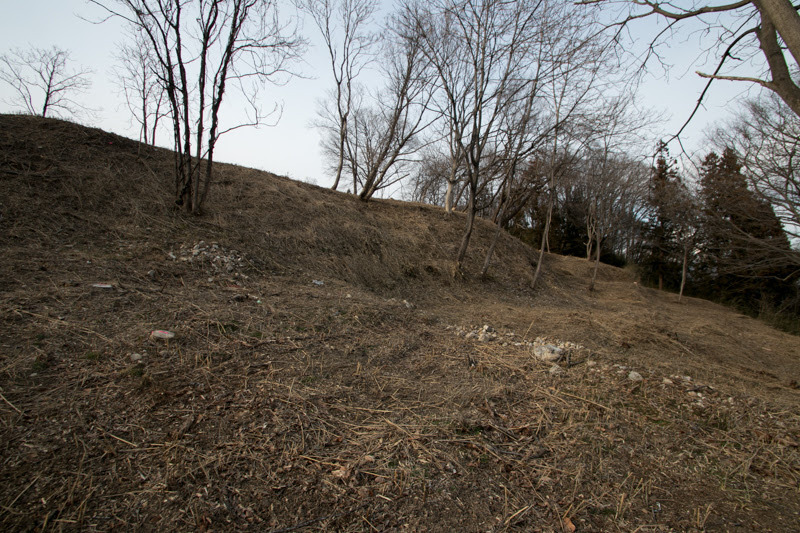 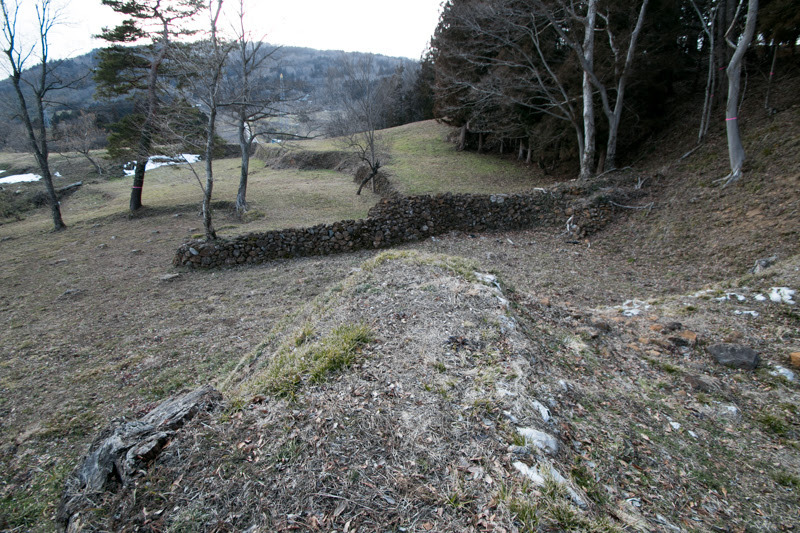 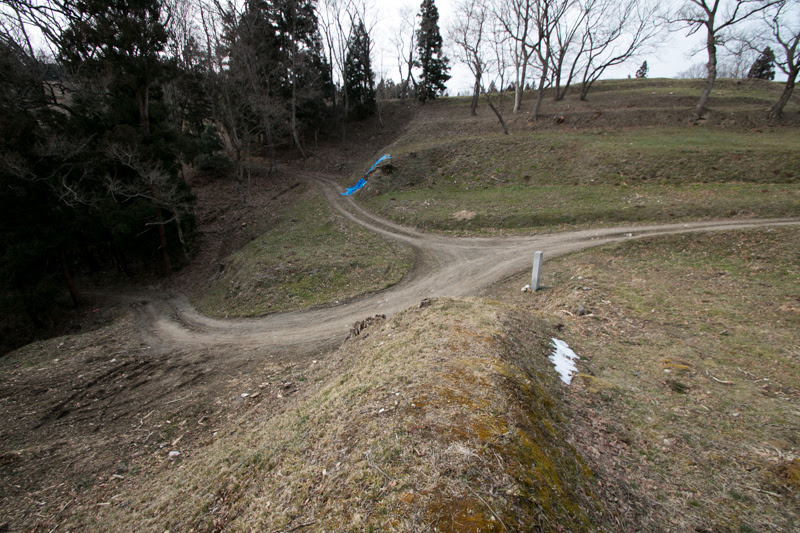 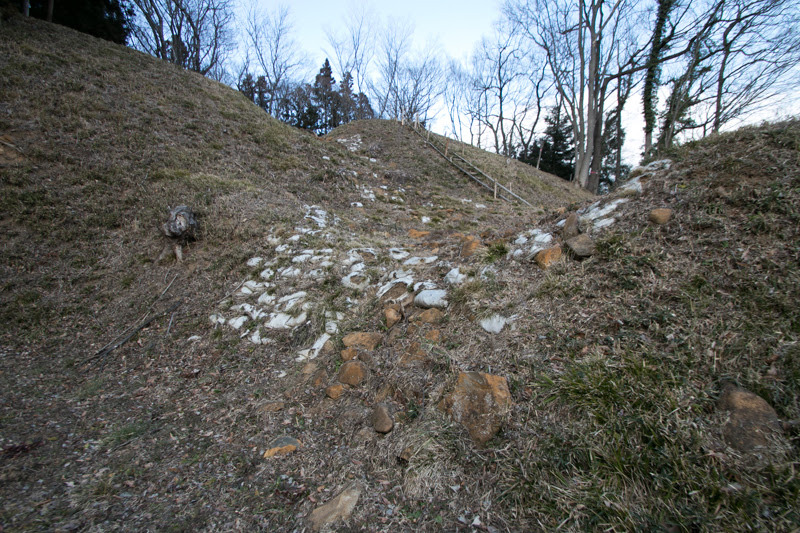 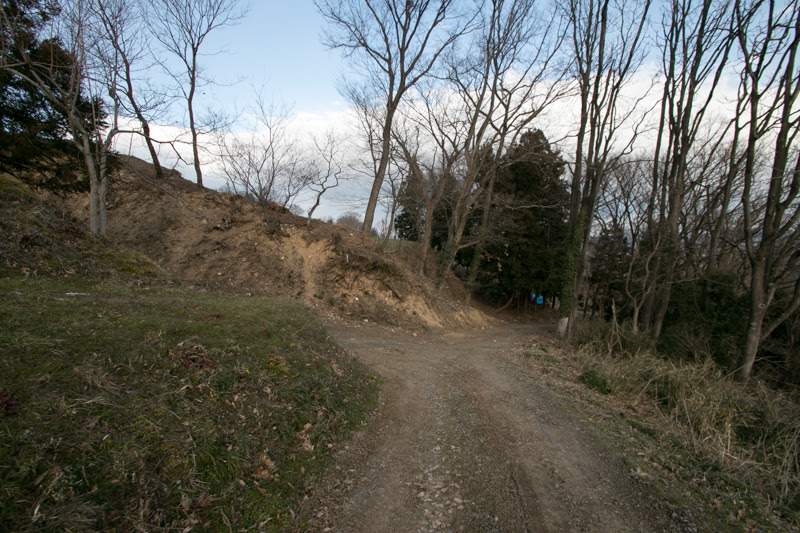 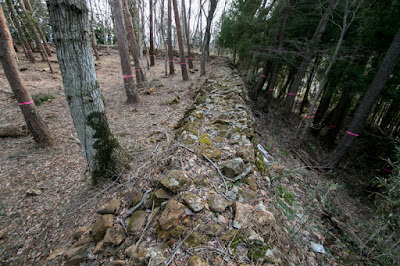 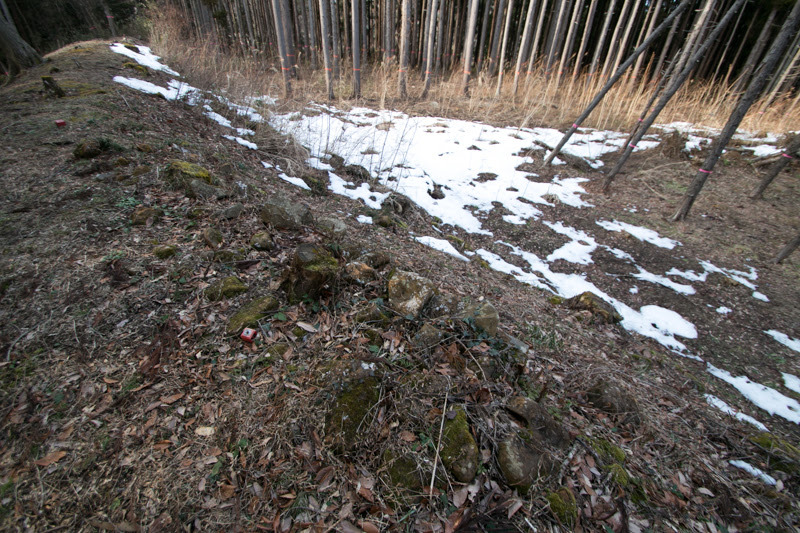 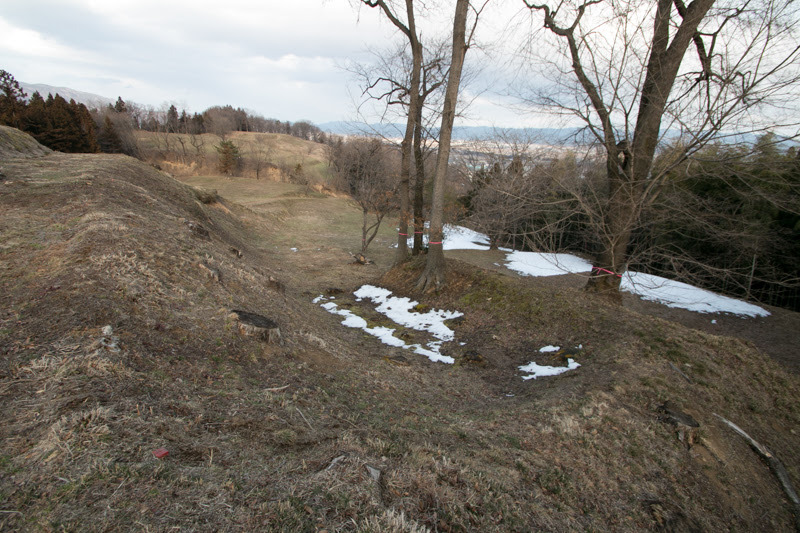 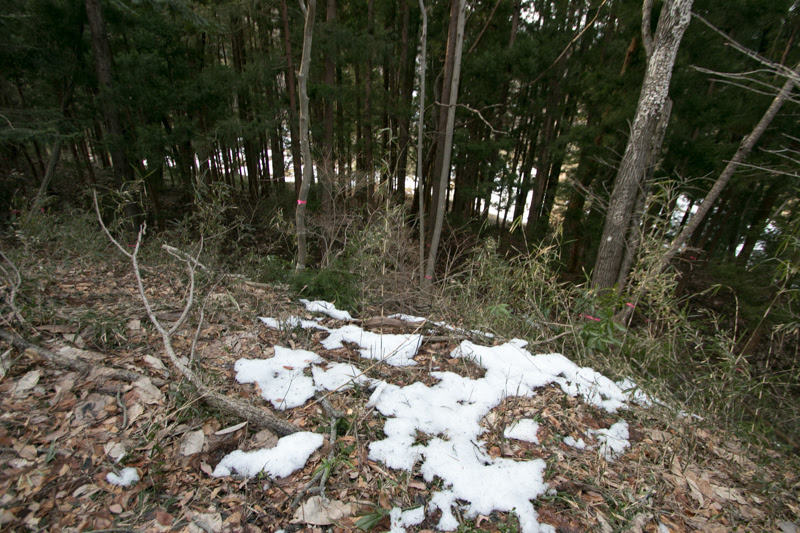 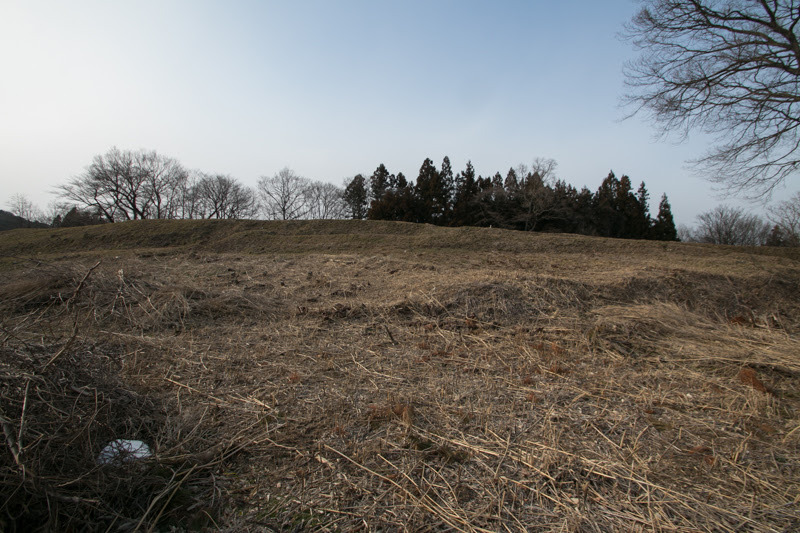 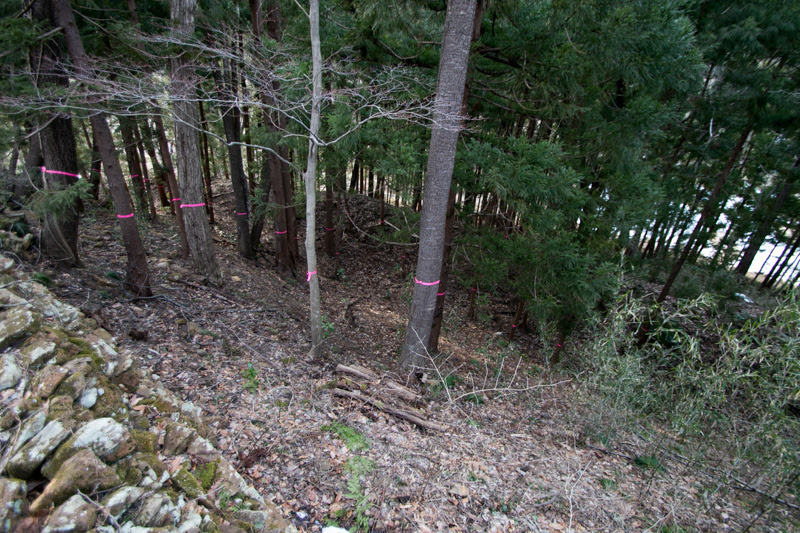 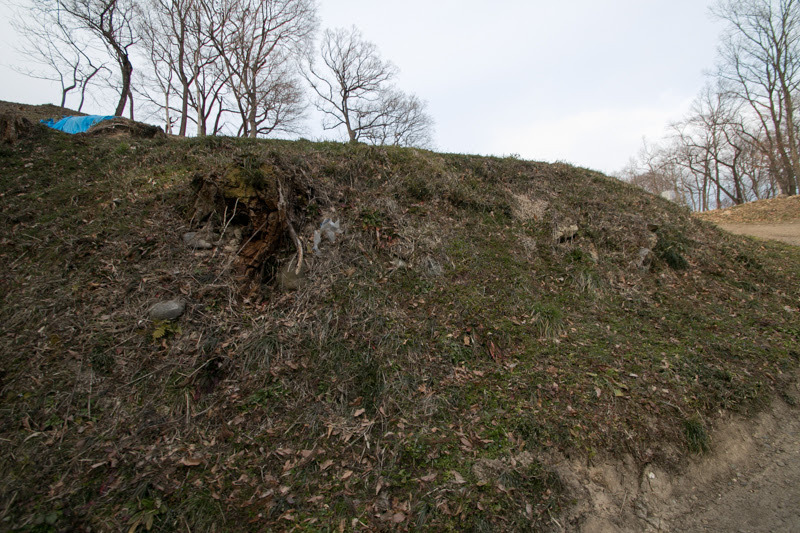 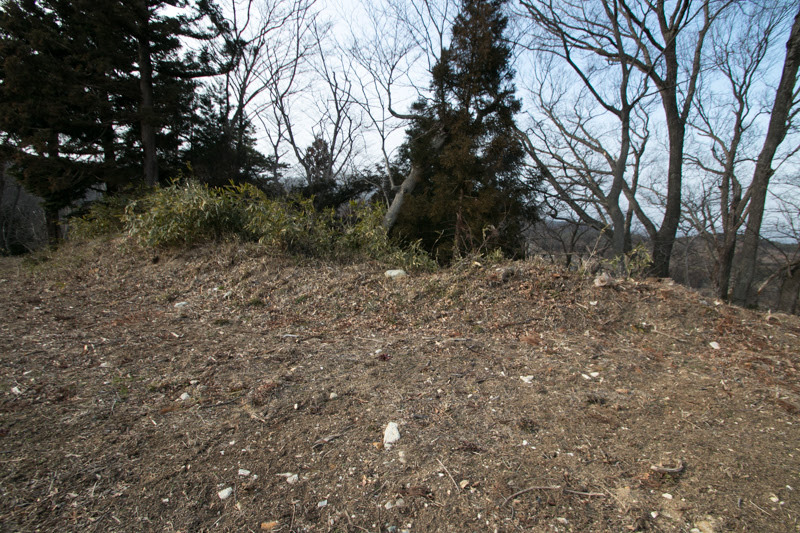 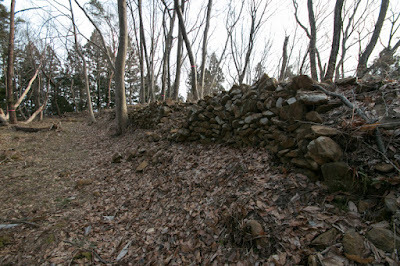 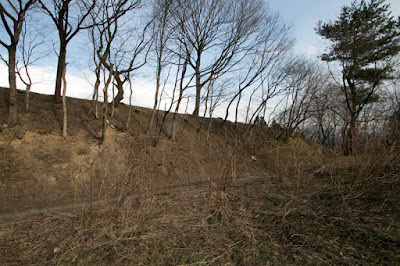 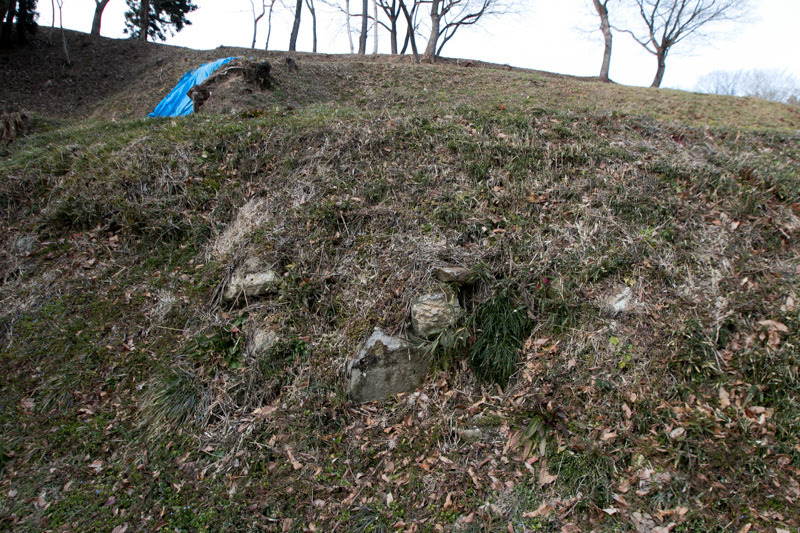 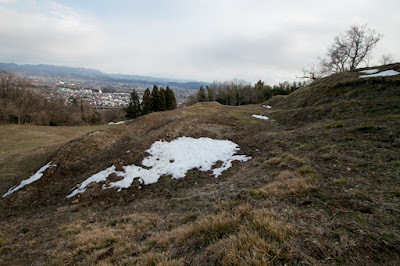 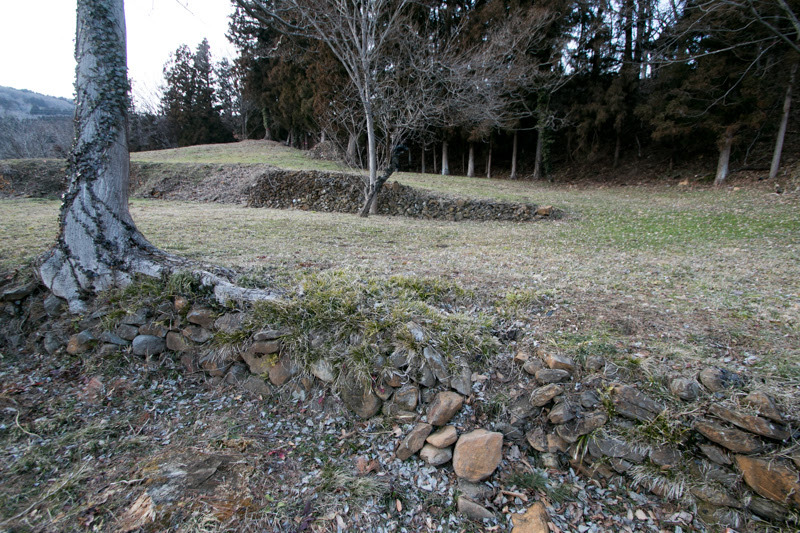 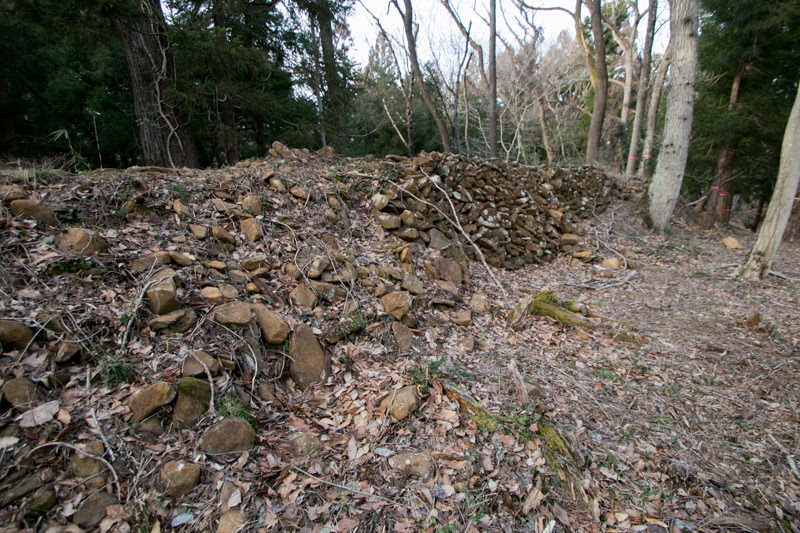 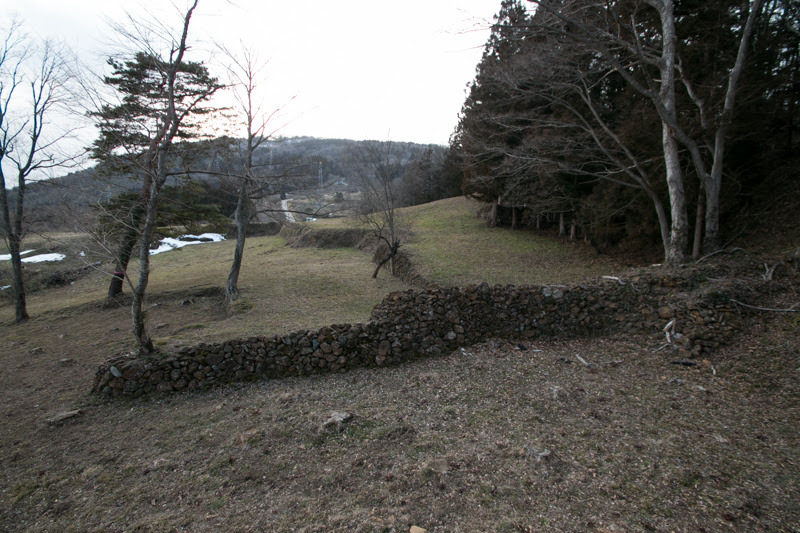 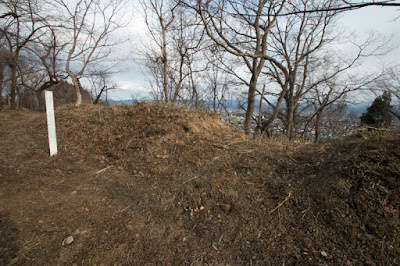 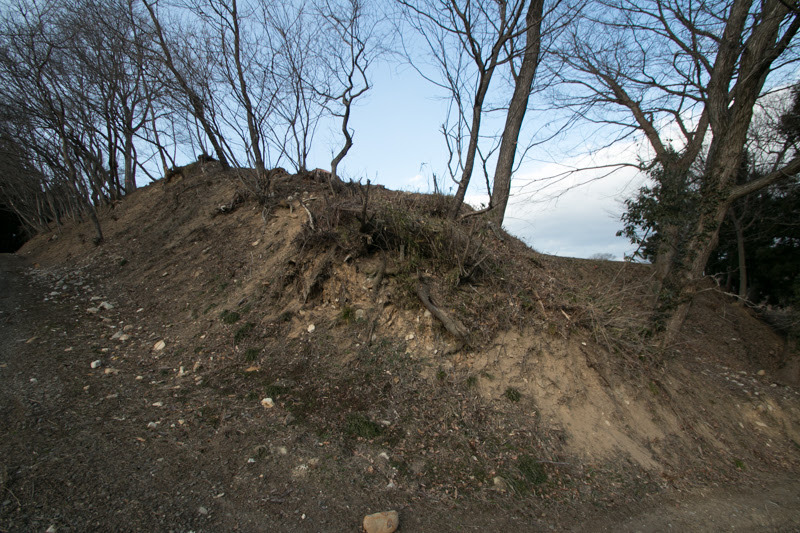 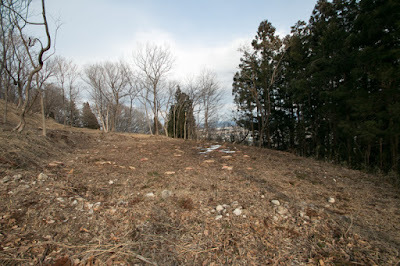 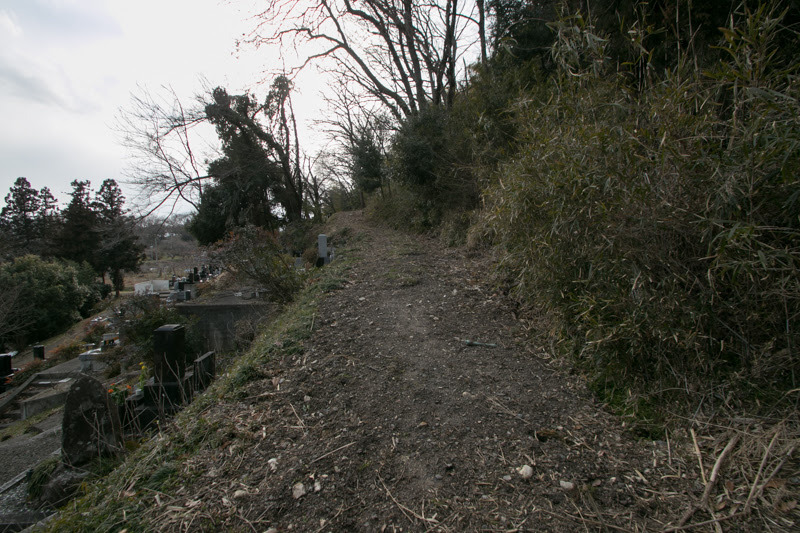 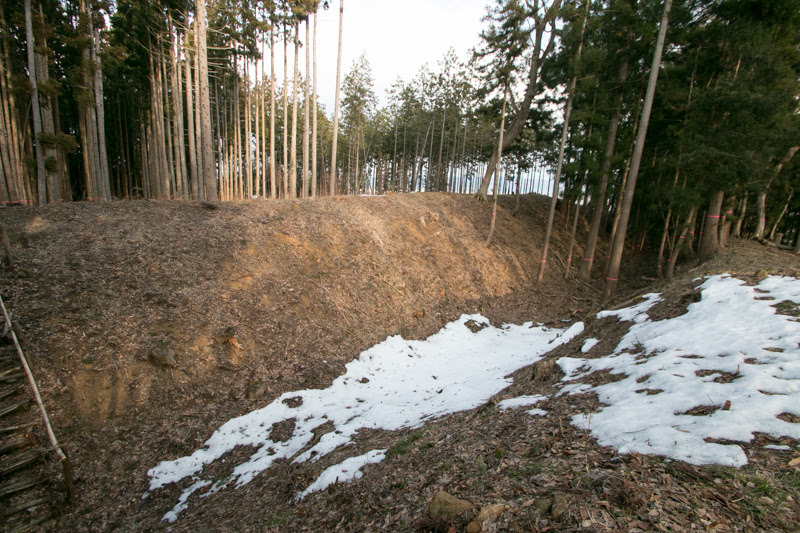 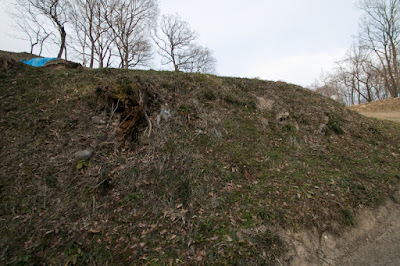 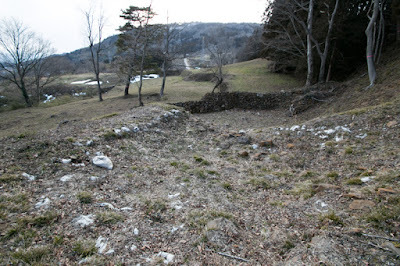 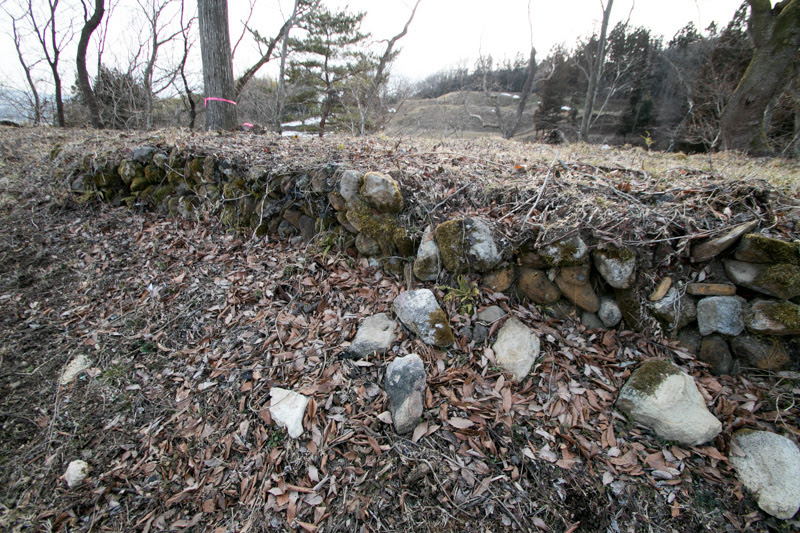 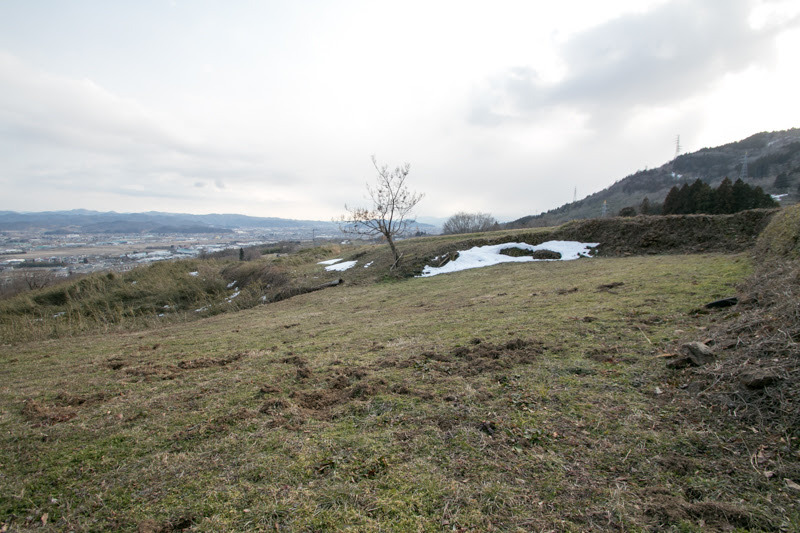 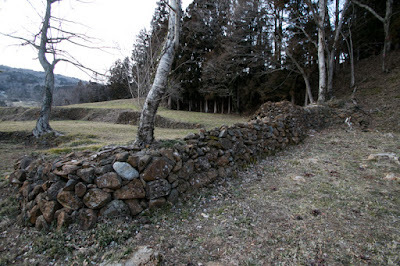 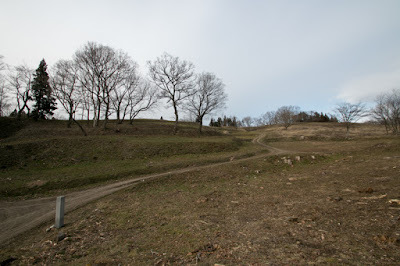 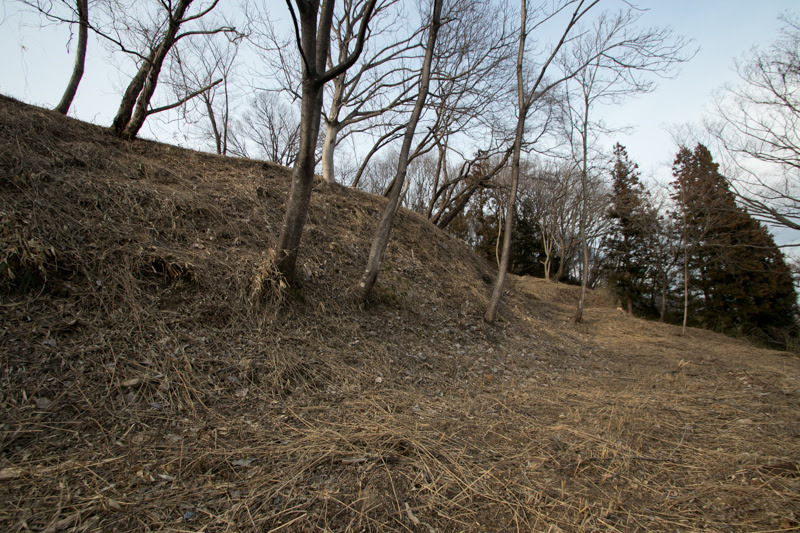 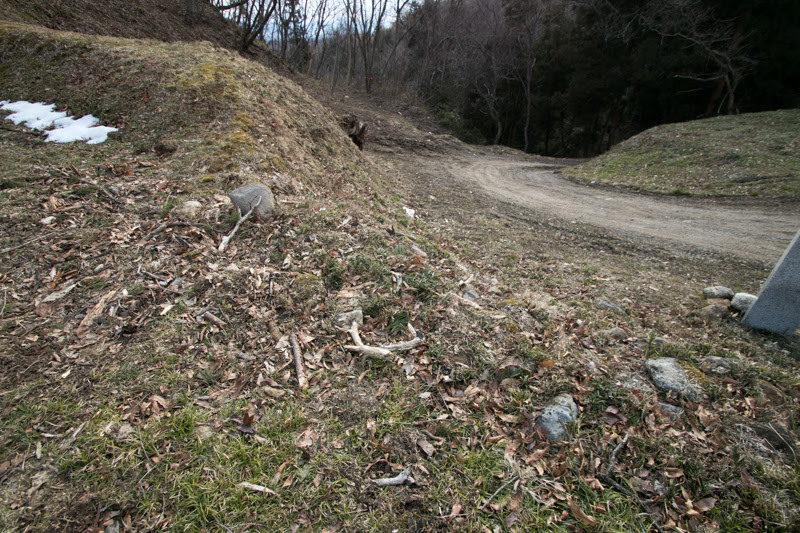 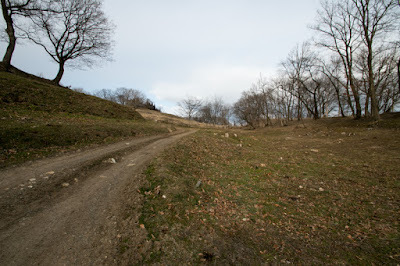 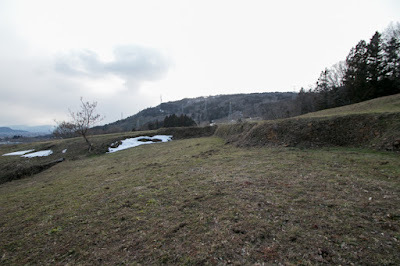 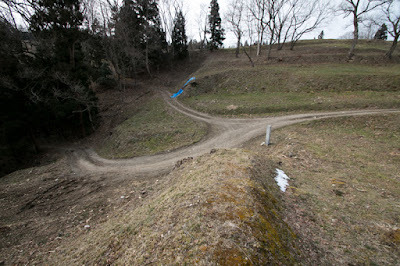 Western end of this valley is used as a main entrance of Kori Nishiyama castle, and still clay wall of gate strengthened by stone walls still remains. 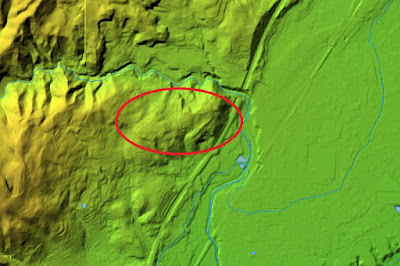 At the south of this valley, there is a narrow and long peak which might work as a wall toward south. 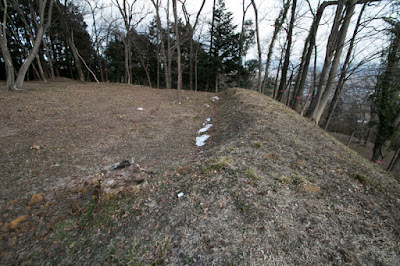 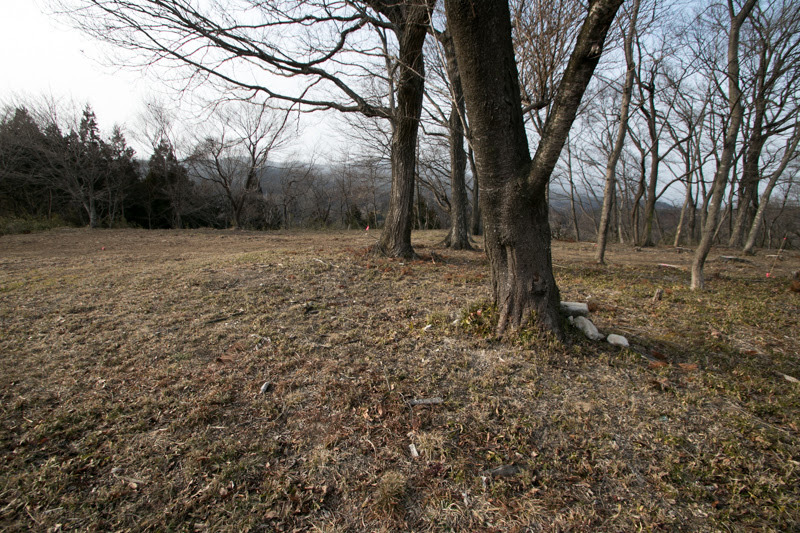 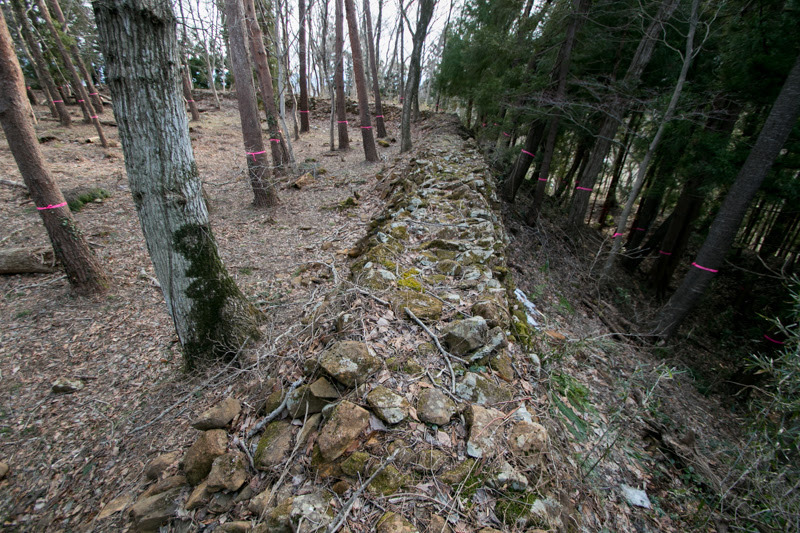 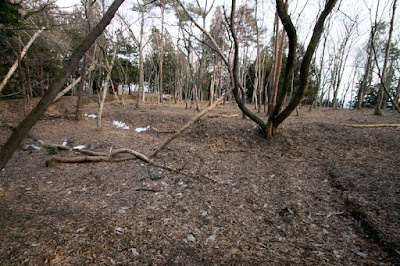 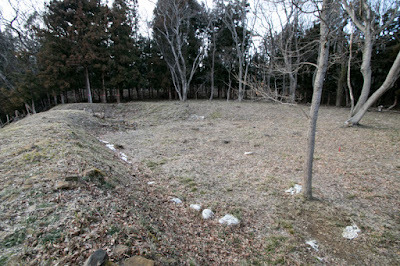 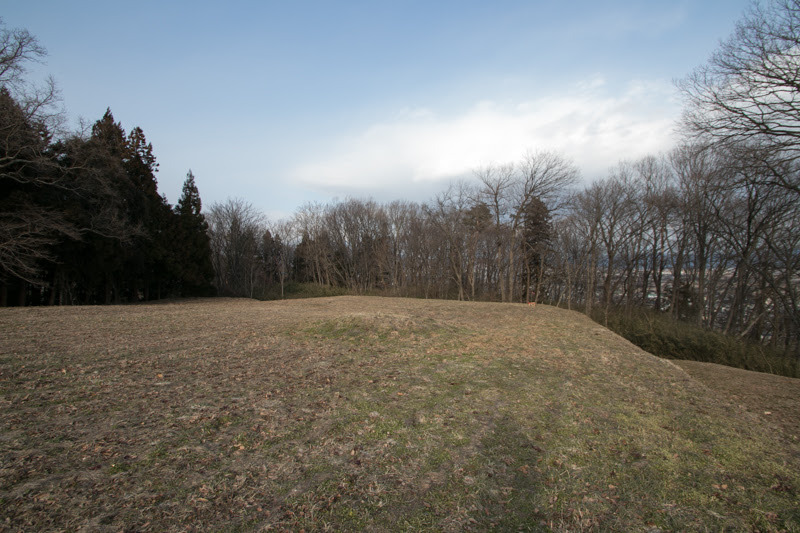 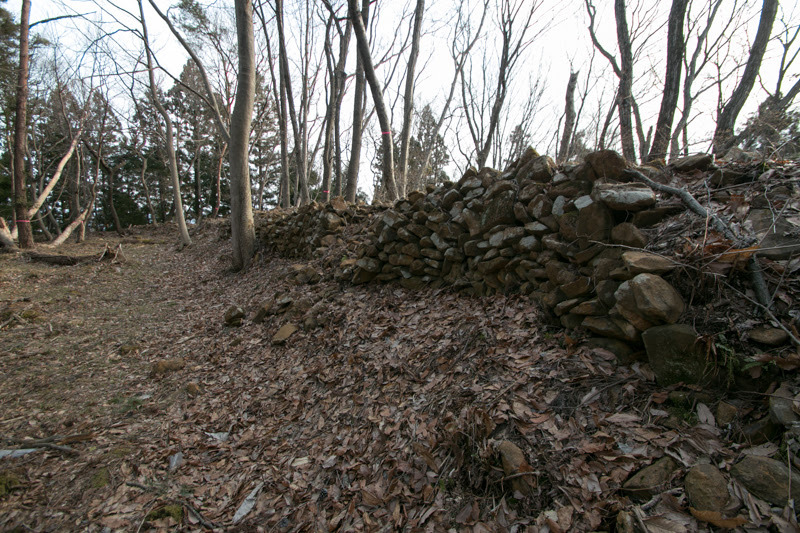 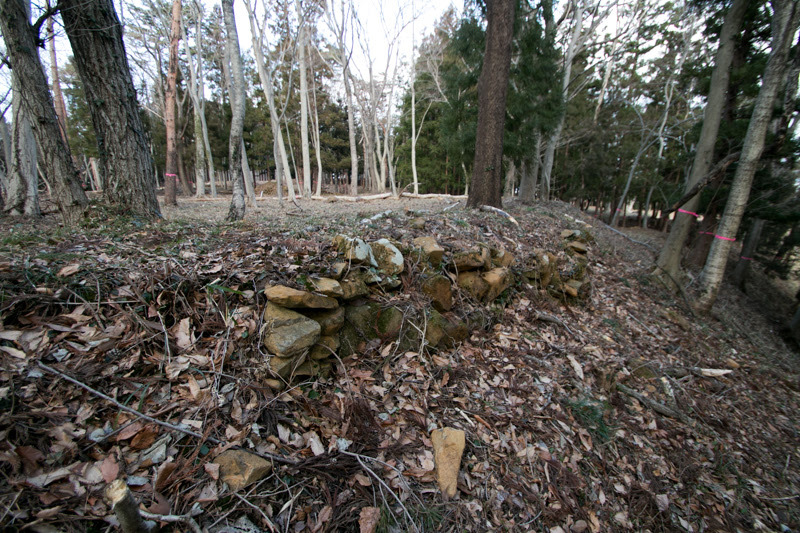 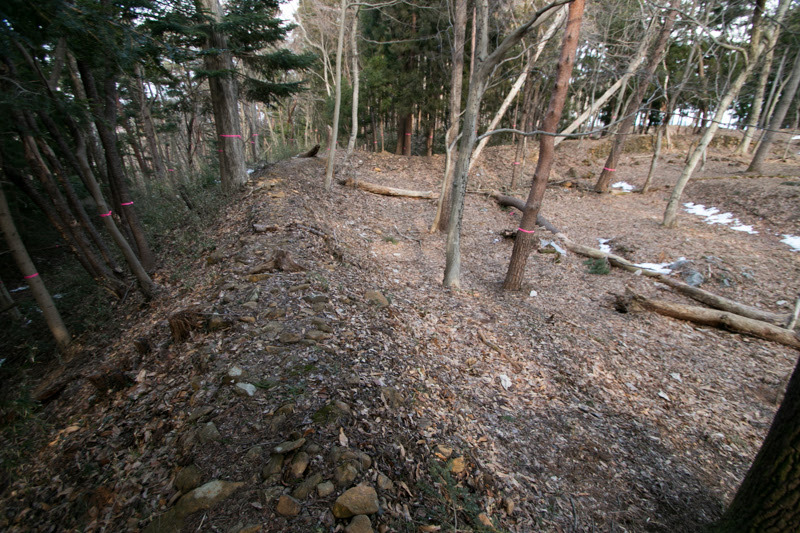 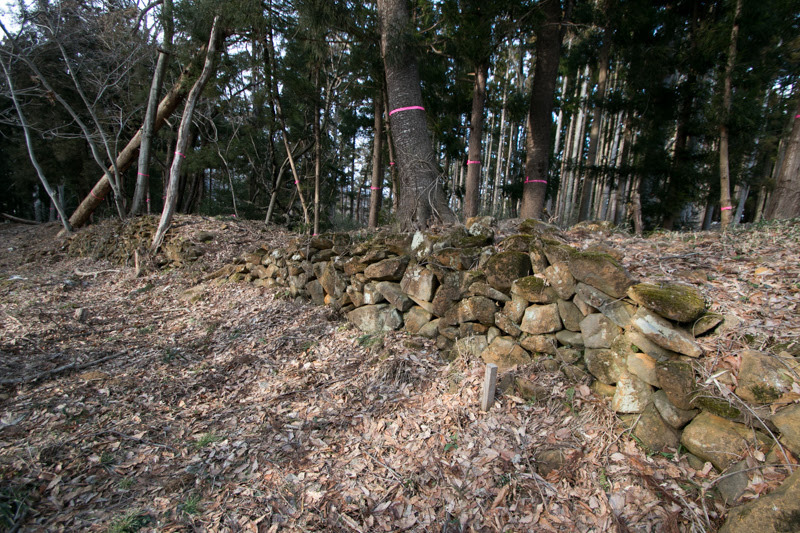 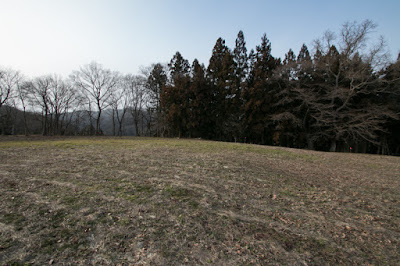 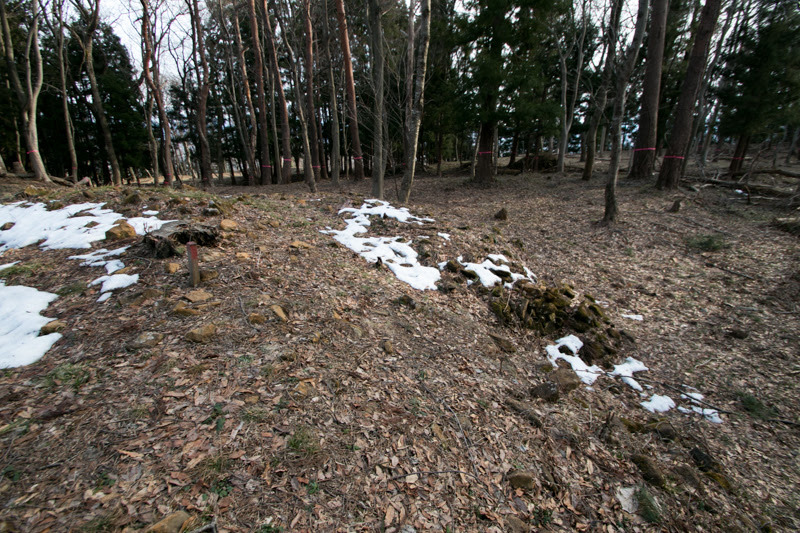 At Meiji revolution war, Sendai domain used this place as a battery and hollows used to place cannons still remain at clay wall. 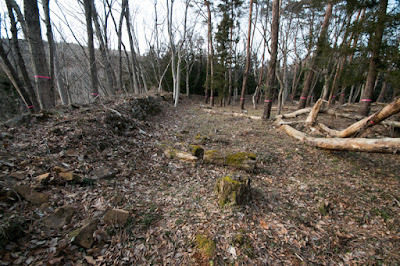 Ahead of third area as connecting part, western part is built at upper place. 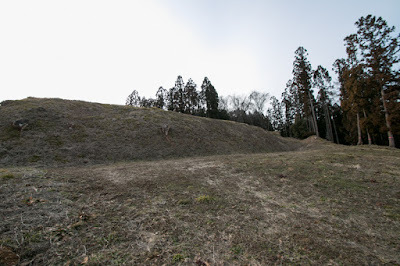 Fourth area is the large flat terrace of the castle of 150 meter long and 100 meter wide, which is wholly protected line of clay walls. 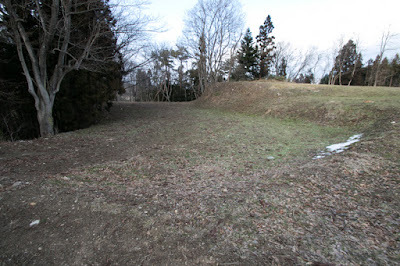 Opposite of deep dry moat over 10 meter wide, fifth area which might be the main part of castle at later period is built. 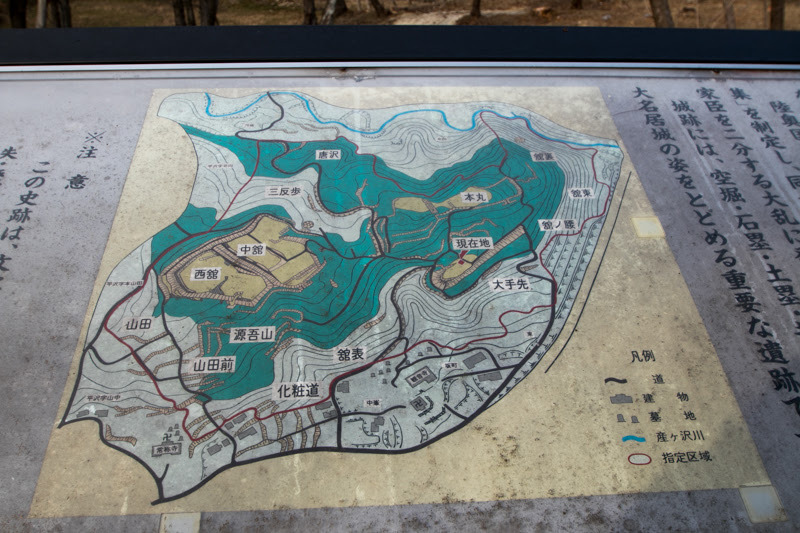 This area has a rectangular shape of 100 meter long and 60 meter wide, and separated into higher north half and lower south half. However, Harumune Date (1519-1578), who was the eldest son of Tanemune, feared endless expansion revolted to Tanemune with retainers in 1542. 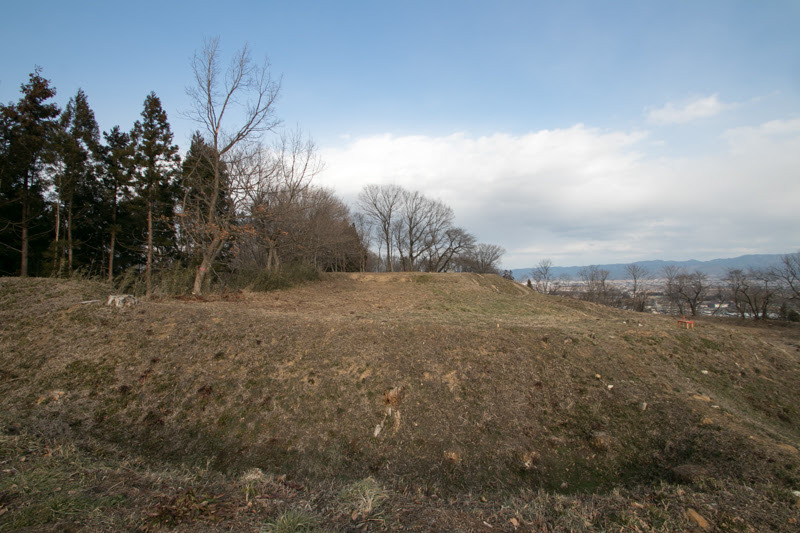 Harumune confiscated Tanemune at Nishiyama castle, but Tanemune was rescued by his supporters then serious internal conflict of Date clan named "Tenbun no Ran" started. This internal conflict continued five years, but finally Tanemune won and forced Tanemune to retire. Tanemune became the leader of Date clan moved his main base from Kori Nishiyama castle to Yonezawa castle in 1548, to change the situation and cope with Mogami clan at Yonezawa basin or Ashina clan at Aizu basin which left Date clan and grew into independent lords during internal conflict. 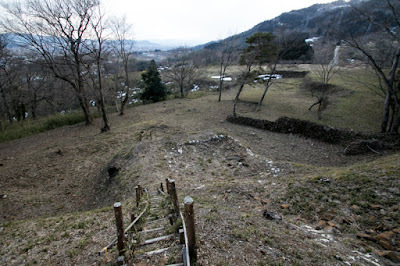 But aftermath of internal conflict was severe then Date clan once significantly lost their power. 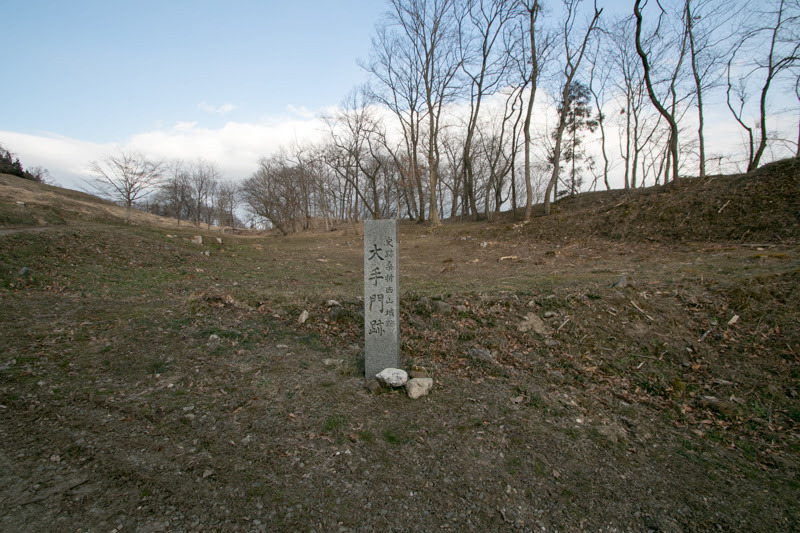 Furthermore, an internal conflict between Tanemune and his son Terumune Date (1544-1585) again, but this did not grow into serious matter. At the end of period of Tanemune Date, nearly 40 years from internal conflict, Date clan recovered former power. 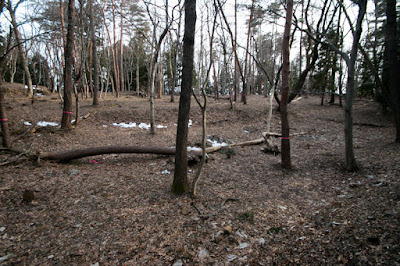 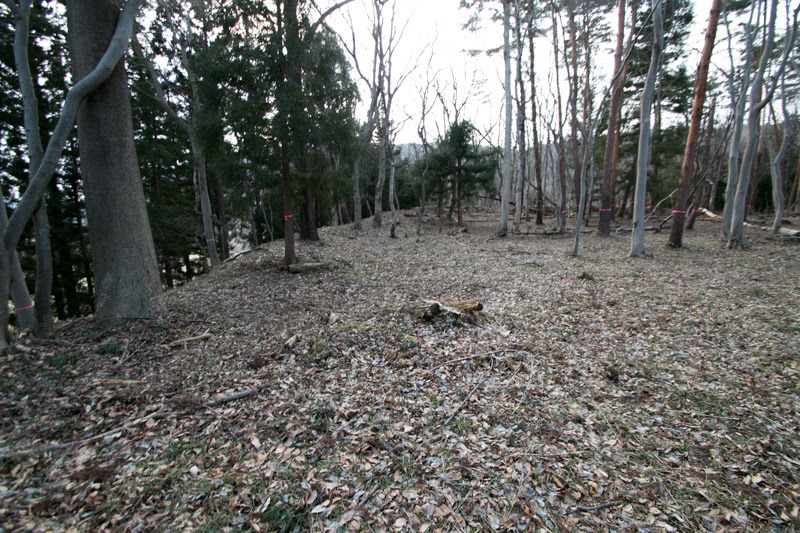 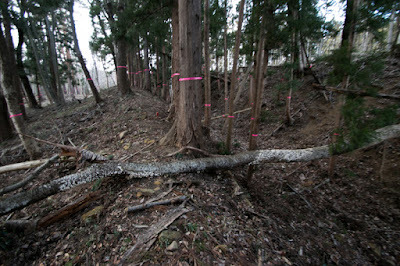 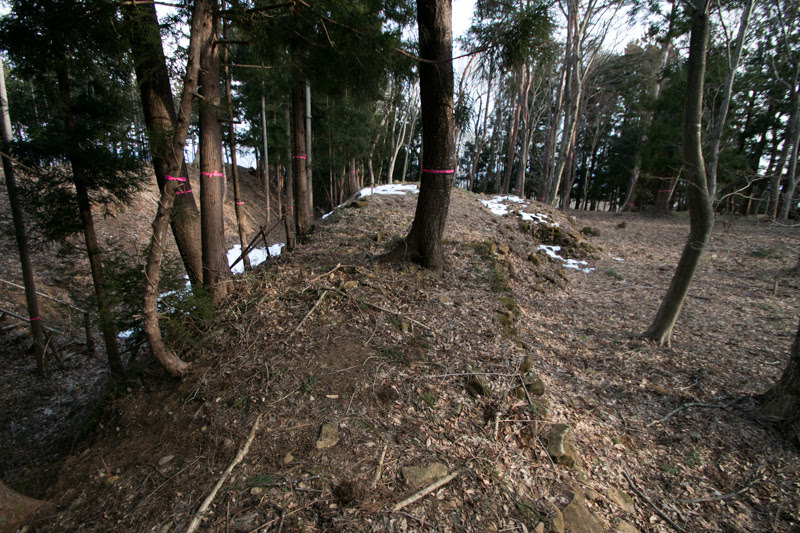 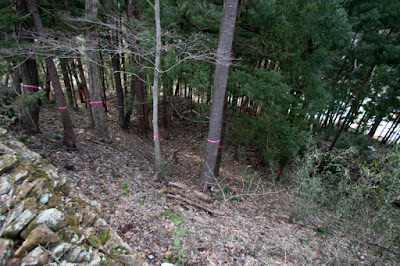 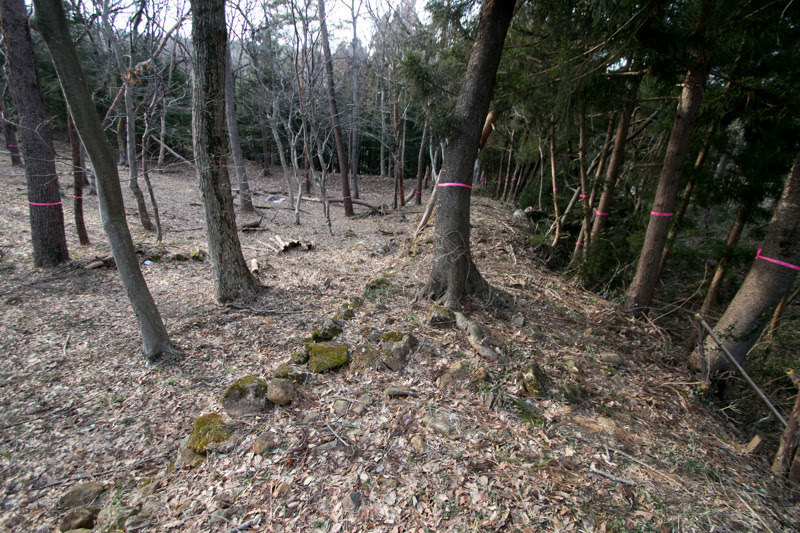 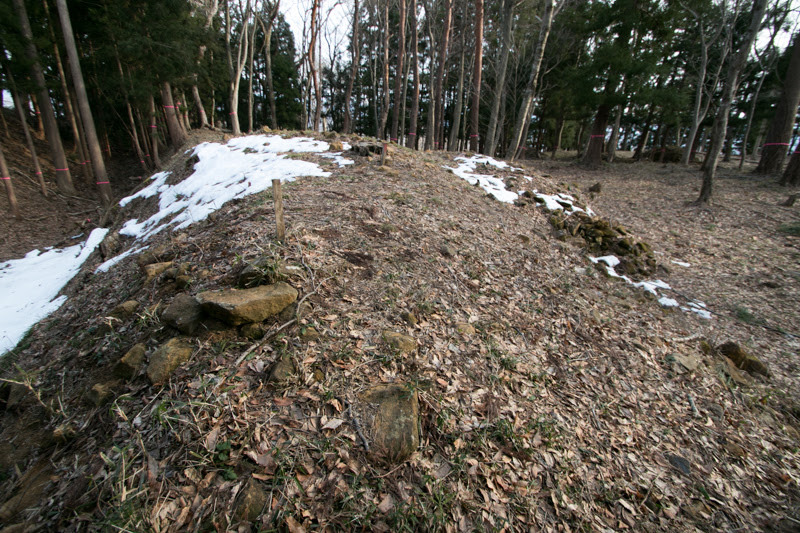 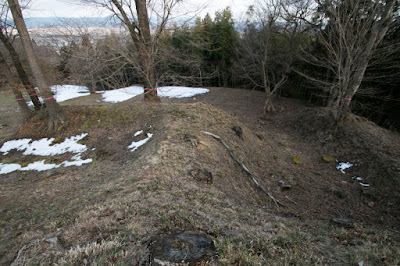 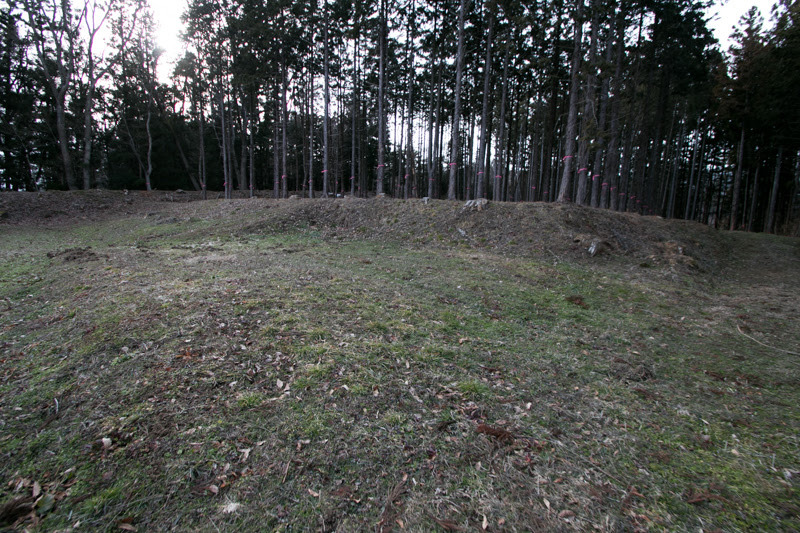 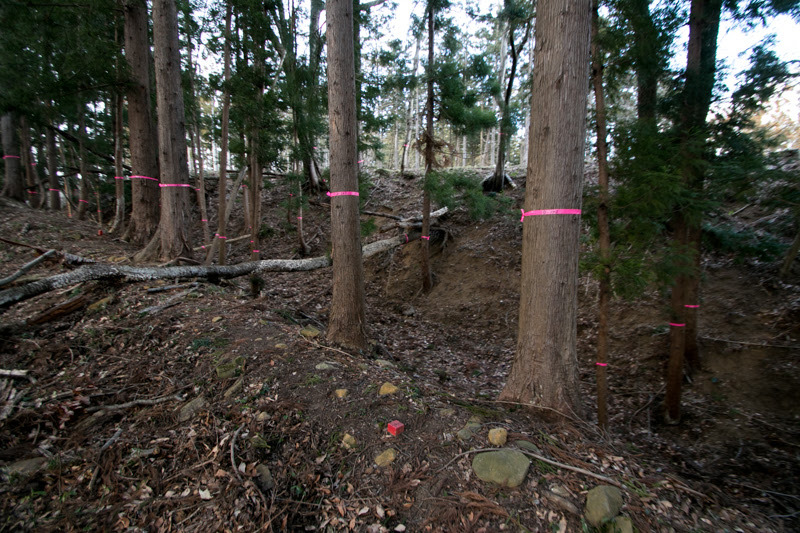 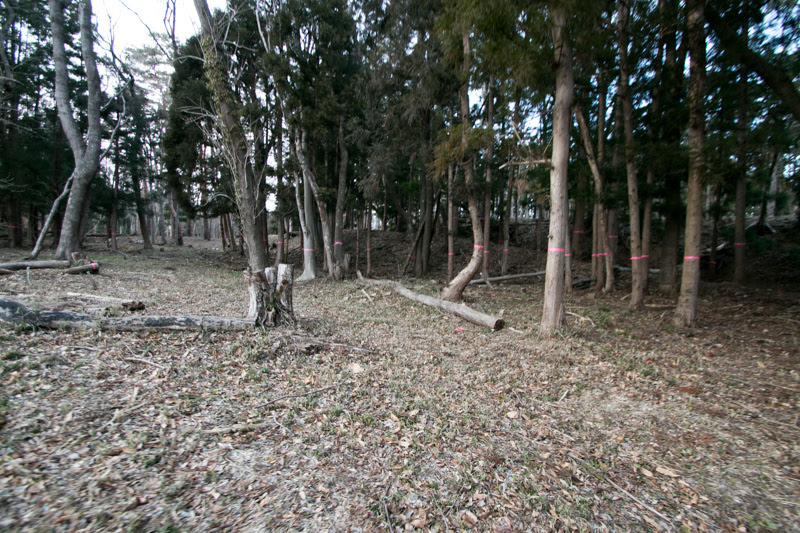 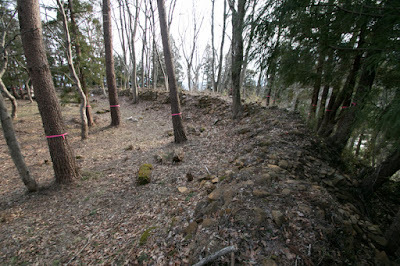 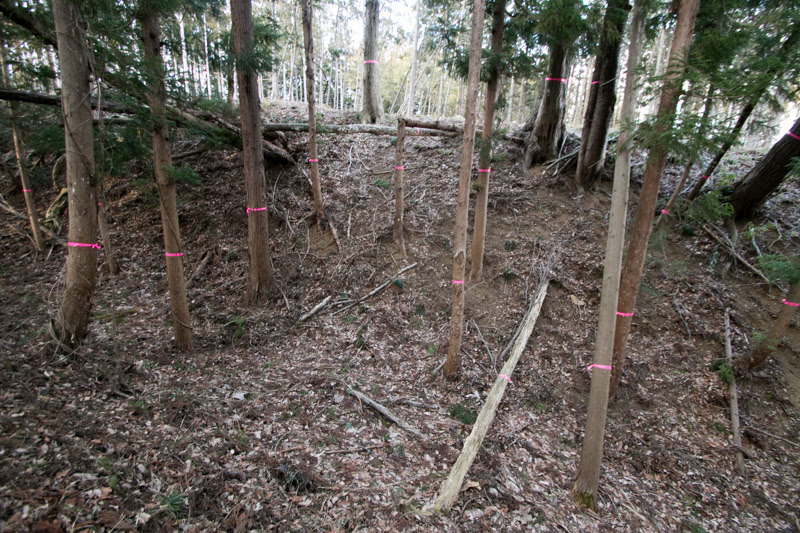 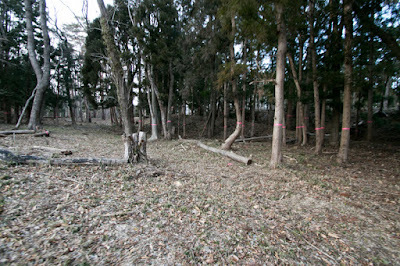 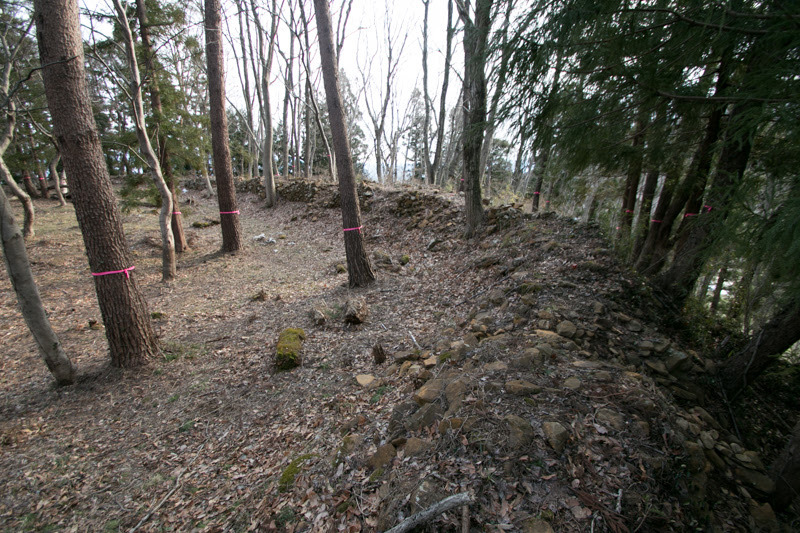 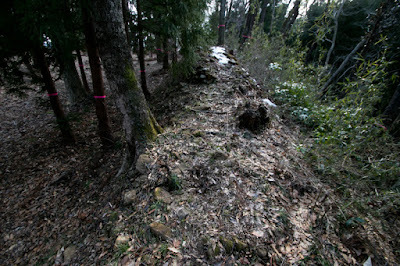 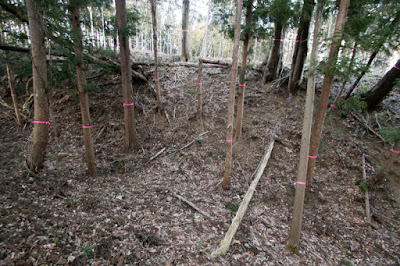 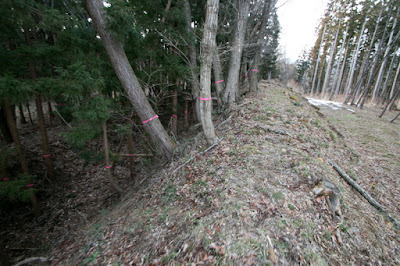 Main base of Date clan was kept at Yonezewa castle, Kori Nishiyama castle might be kept as a major base at Fukushima basin. Masamune Date (1567-1636), son of Harumune and praised as single-eyed dragon, ruined Ashina clan which was the lord of Kurokawa castle (later Aizu Wakamatsu castle) and seized major part of south part of Tohoku region. 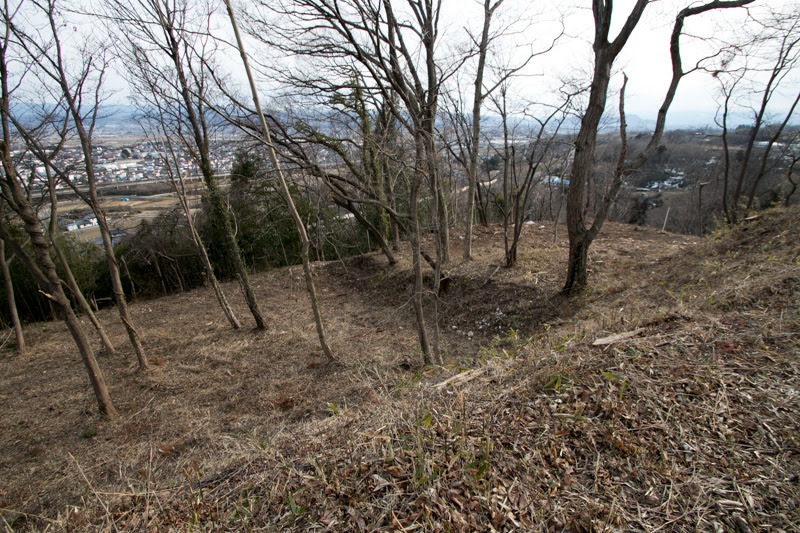 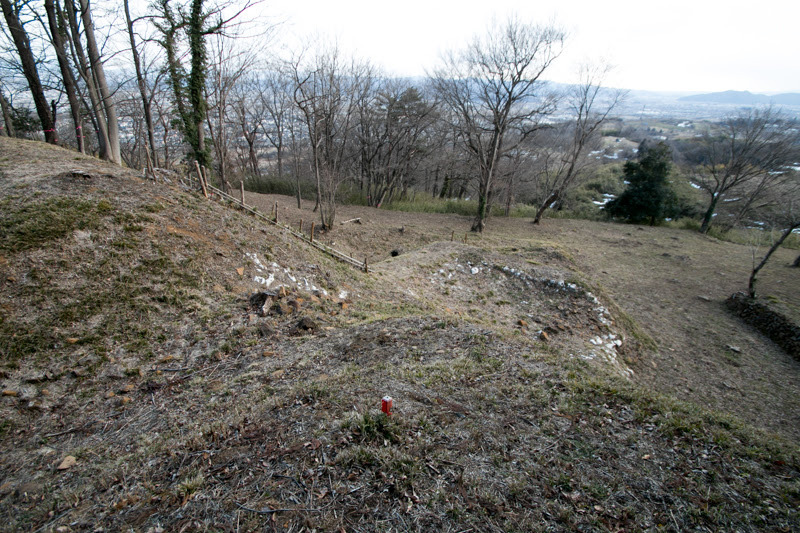 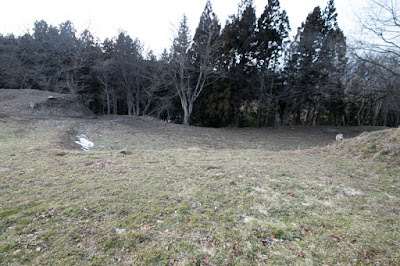 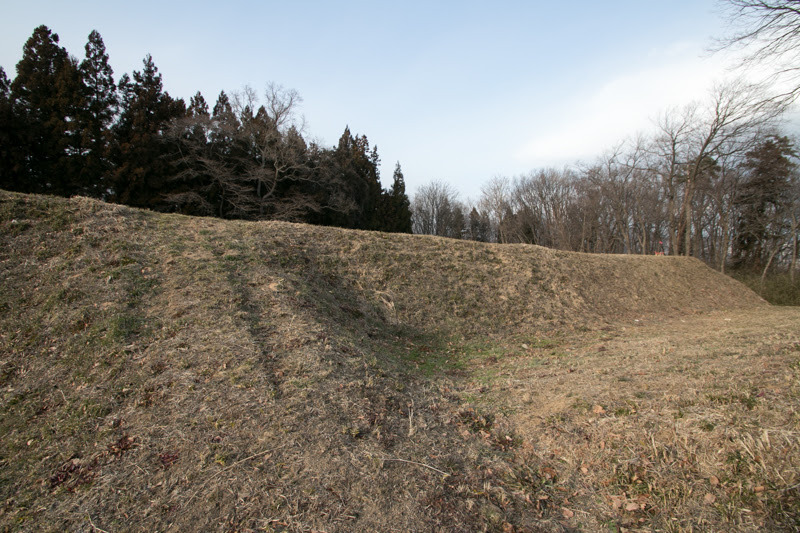 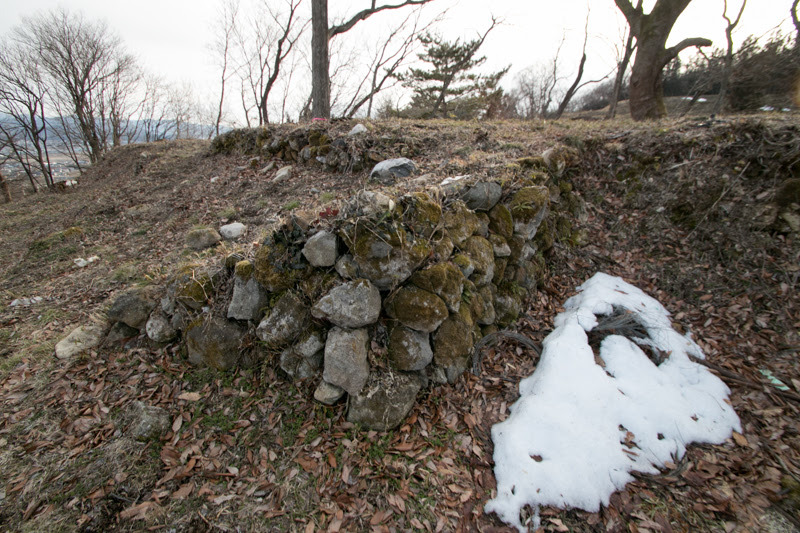 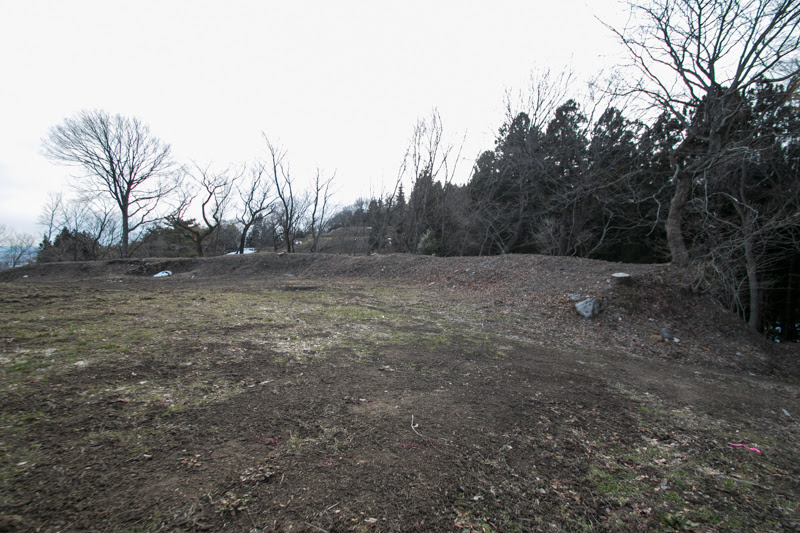 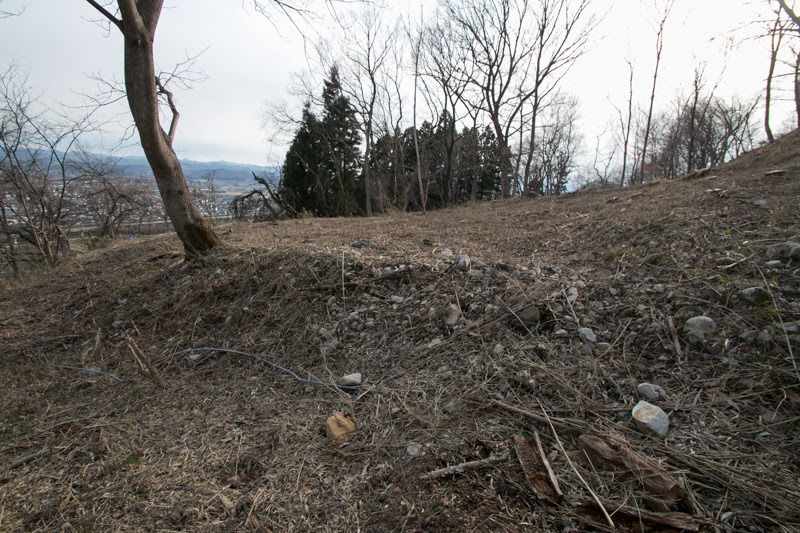 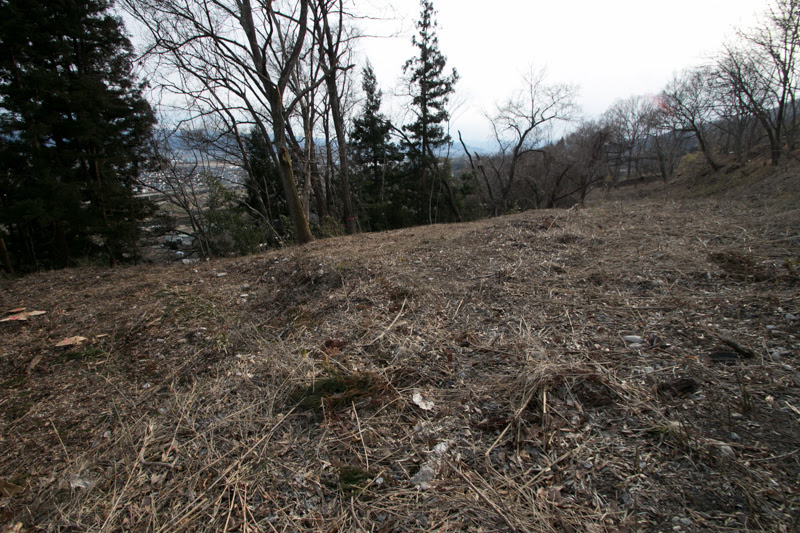 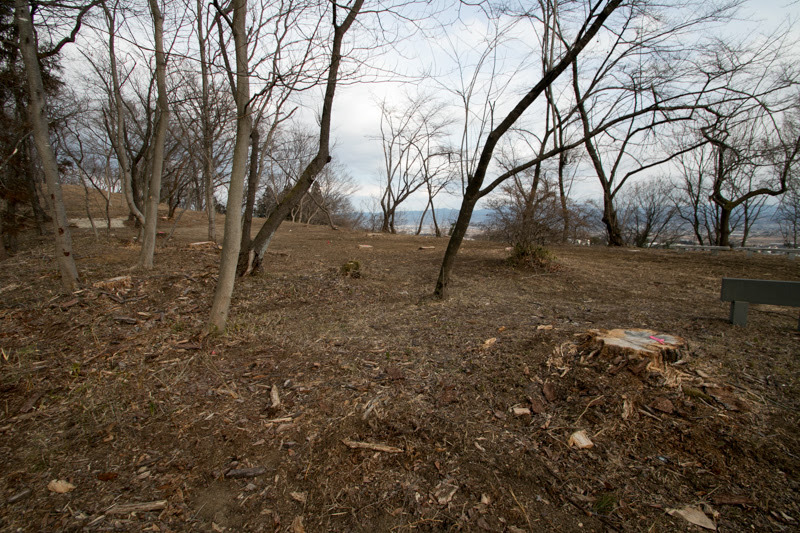 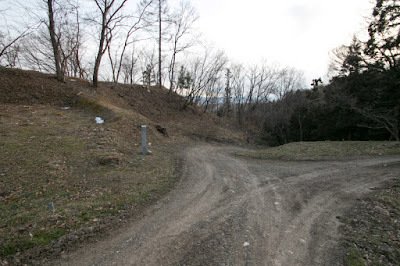 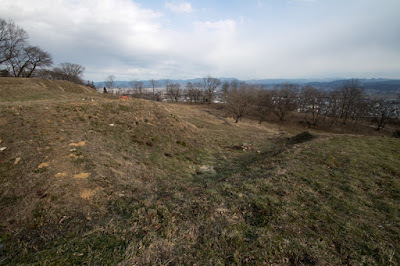 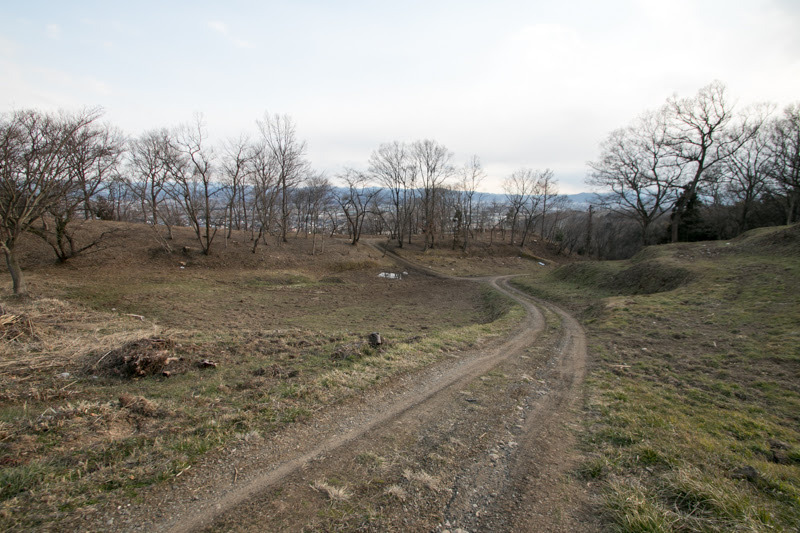 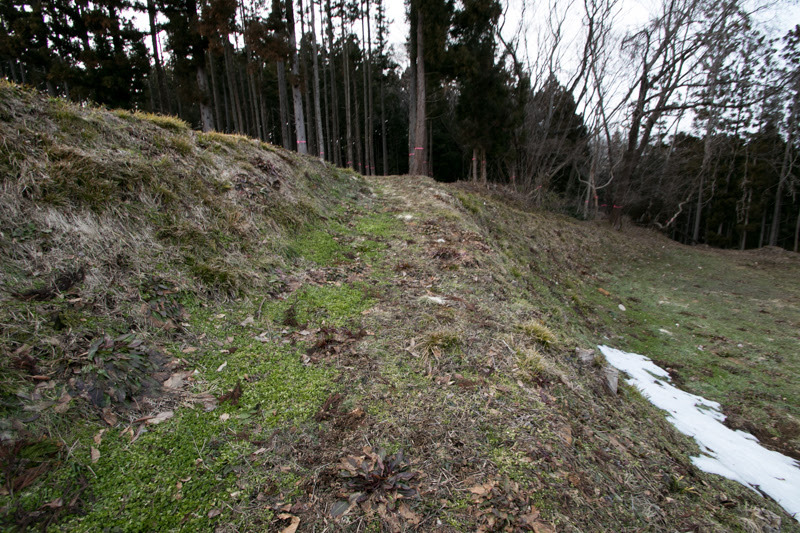 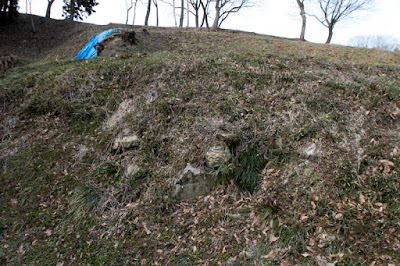 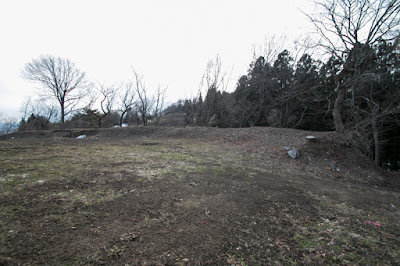 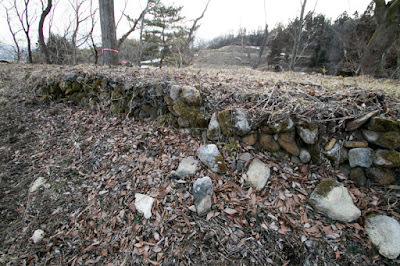 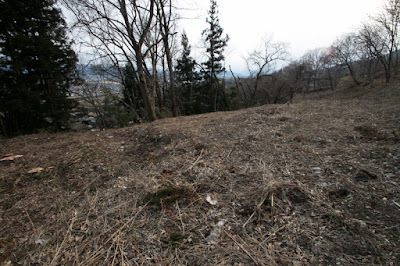 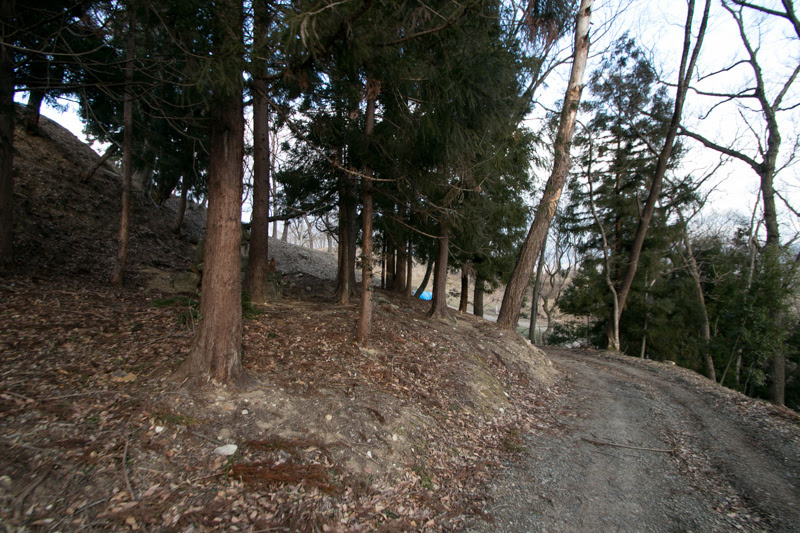 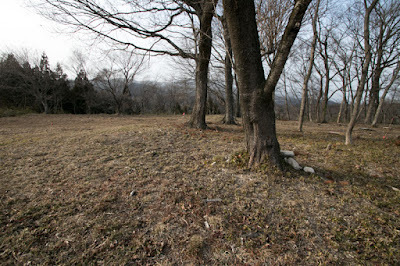 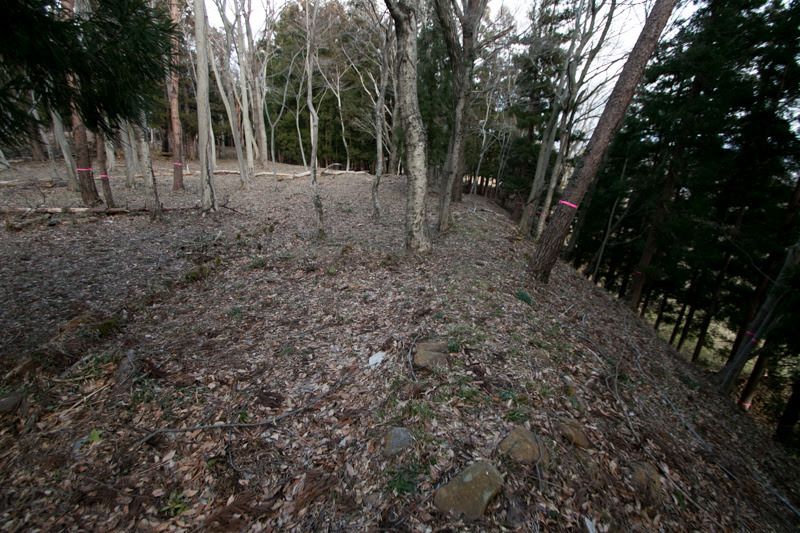 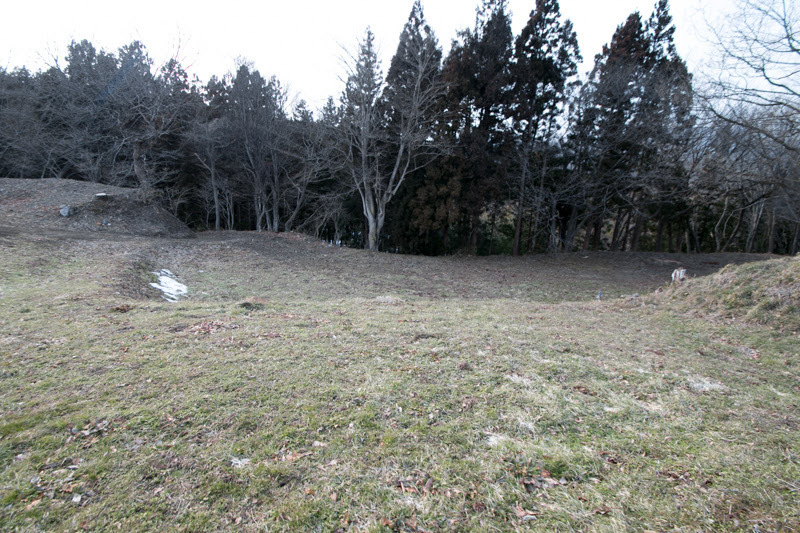 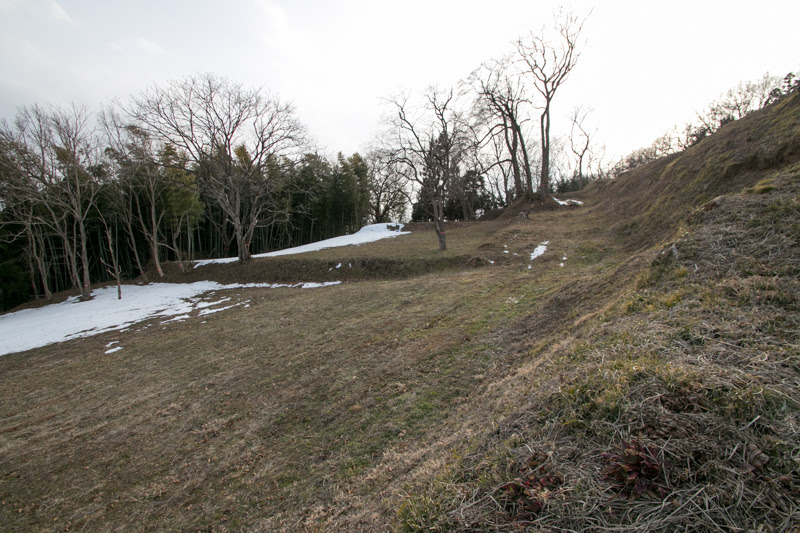 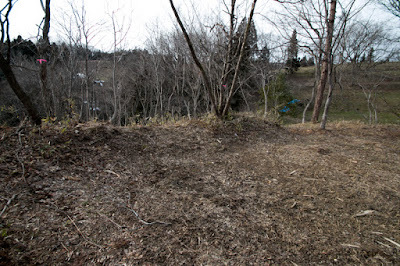 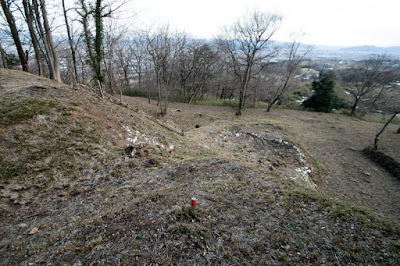 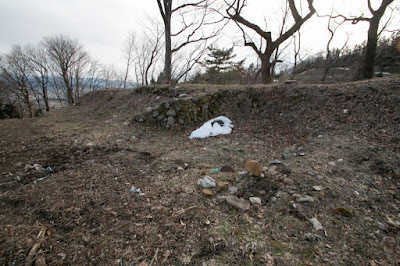 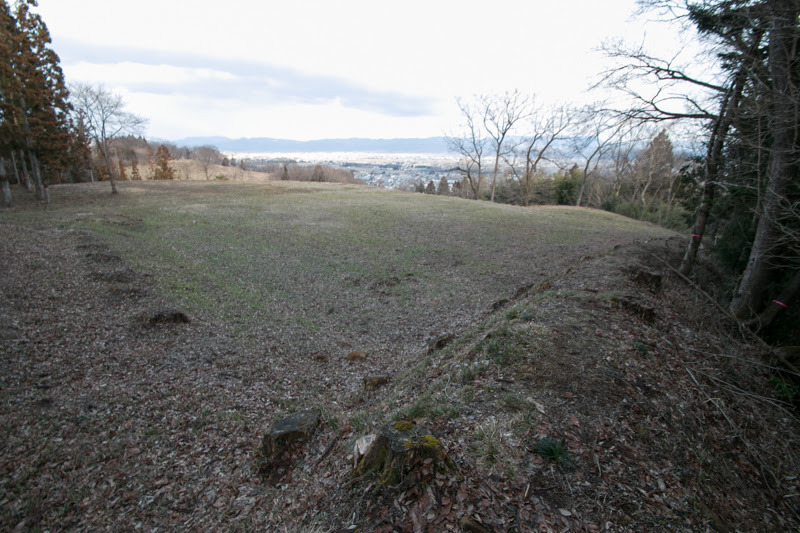 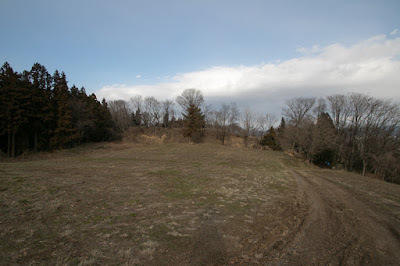 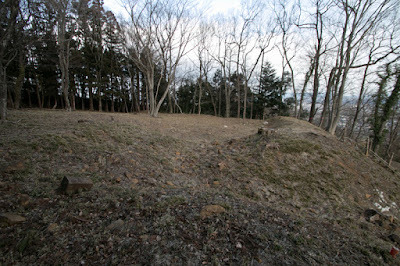 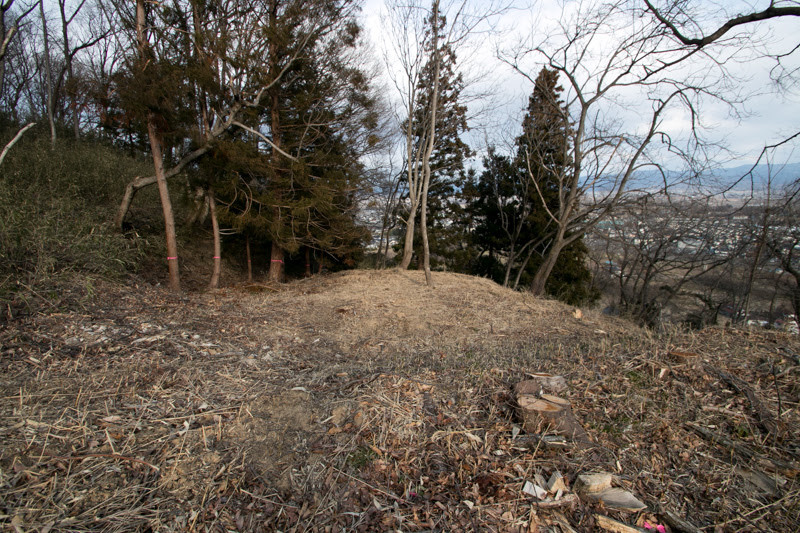 Along with the expansion of territory Masamune moved his residence from Yonezawa castle to Kurokawa castle, but looking at the ruin of Hojo clan by central ruler Hideyoshi Toyotomi (1537-1598), Masamune subordinated to Hideyoshi. 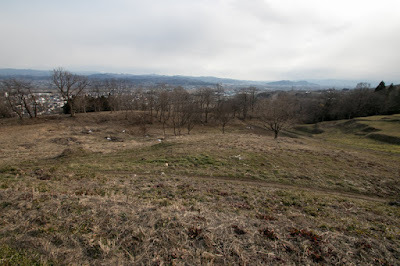 In 1591, under suspect of support for rebellion of retainers of former Osaki clan, Masamune was ordered to move to Sendai area which was the former territory of Osaki clan. 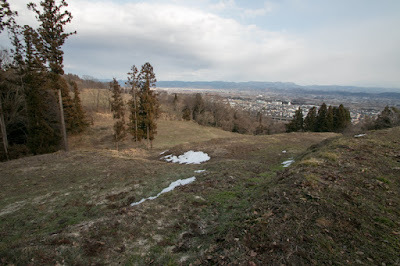 Masamune lost Yonezawa basin and Fukushima basin had to change his main base from Yonezawa castle to Iwadeyama castle, and Kori Nishiyama castle was abolished at this time. 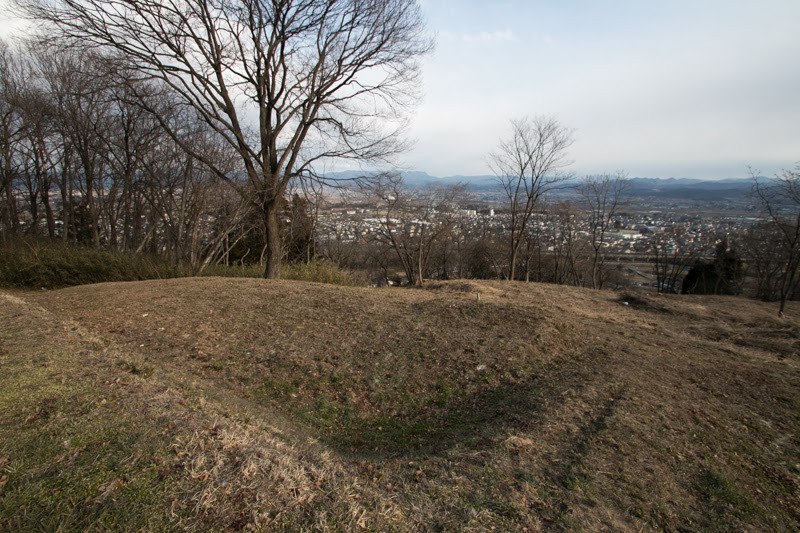 Finally in 1601, Masamune built Sendai castle where had a large flat area and good port to develop economy, moved his residence from inland Iwadeyama castle and fixed it. 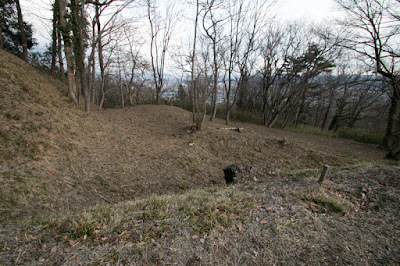 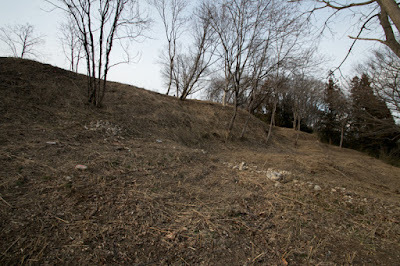 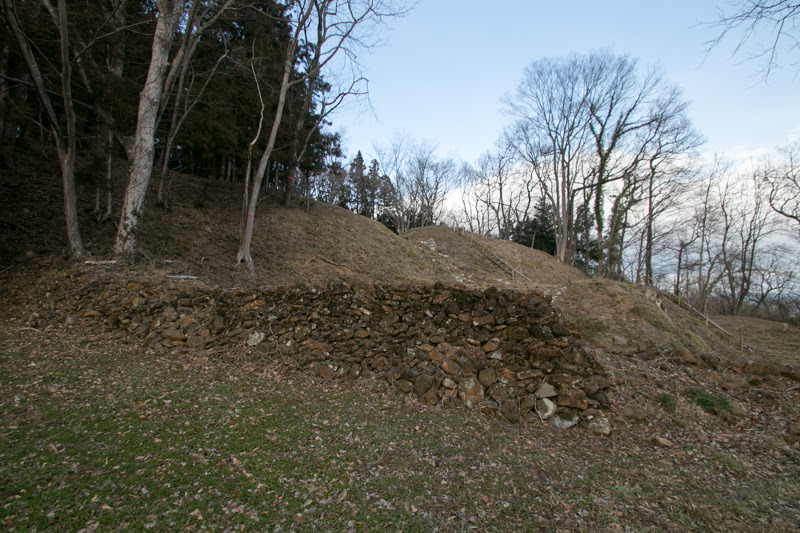 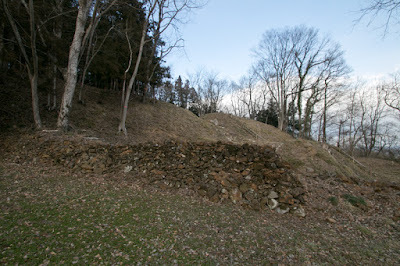 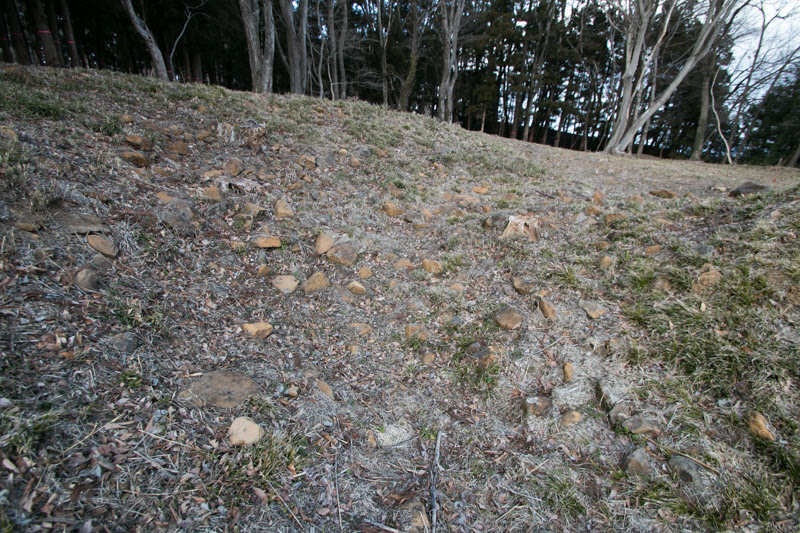 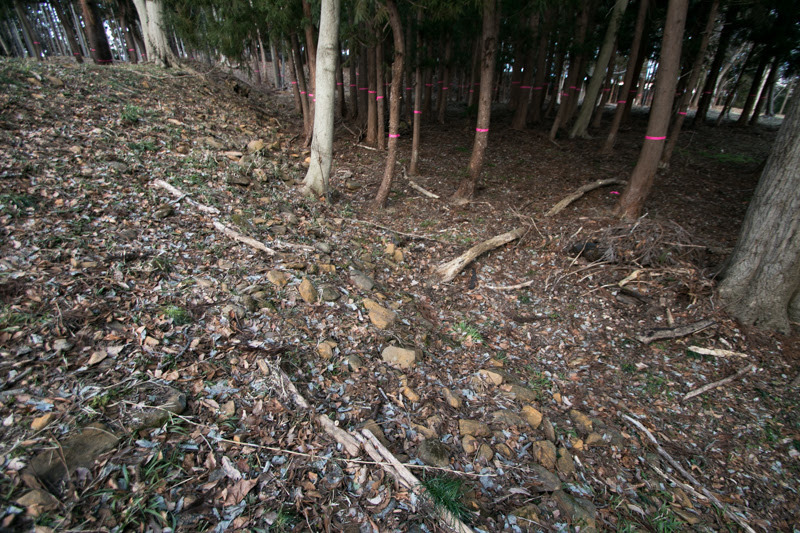 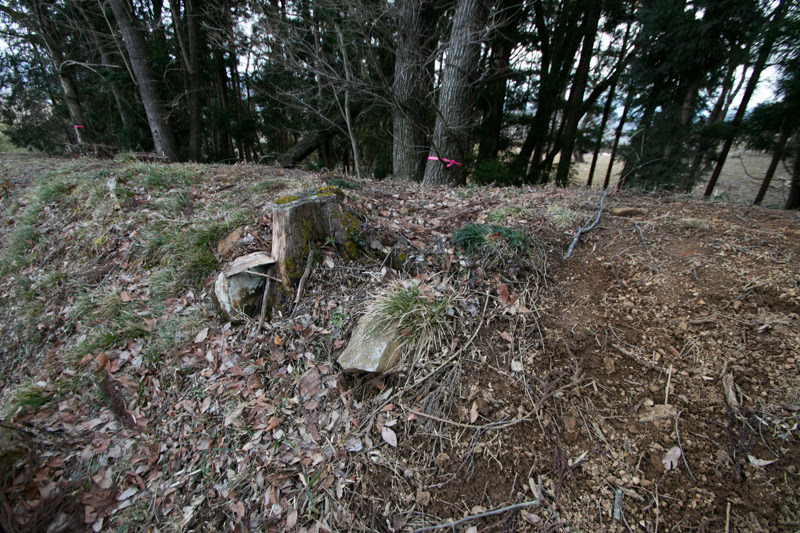 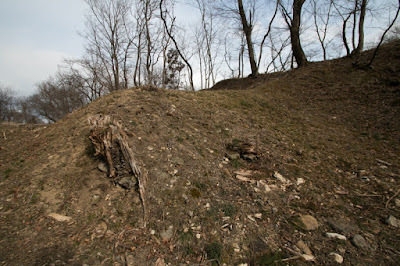 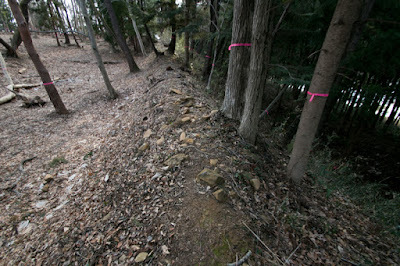 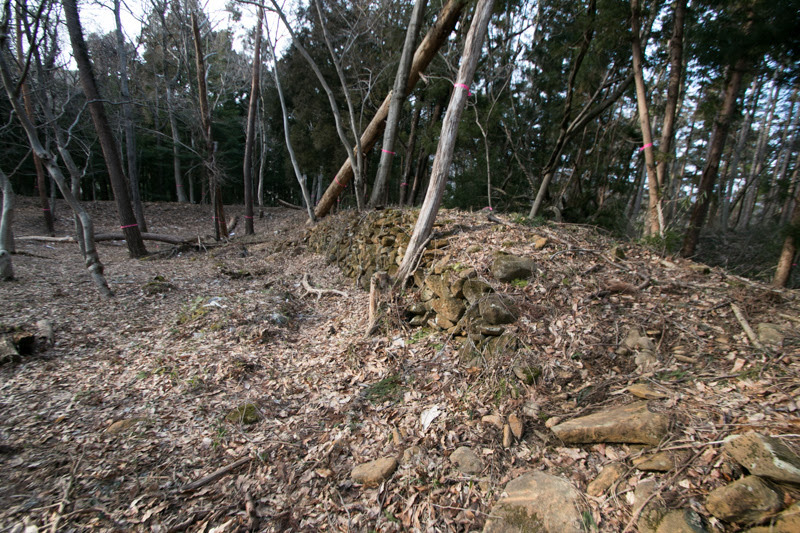 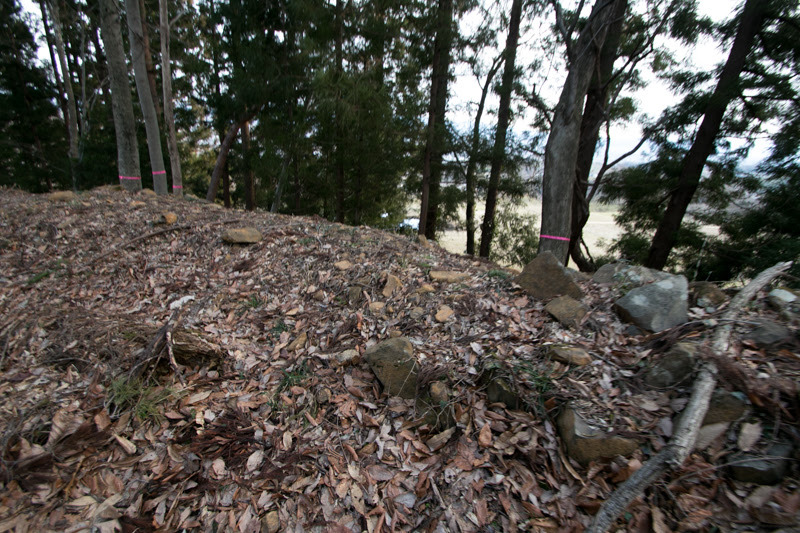 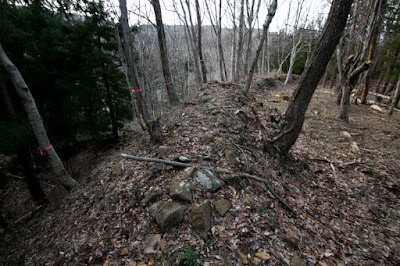 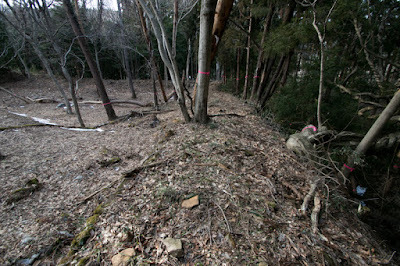 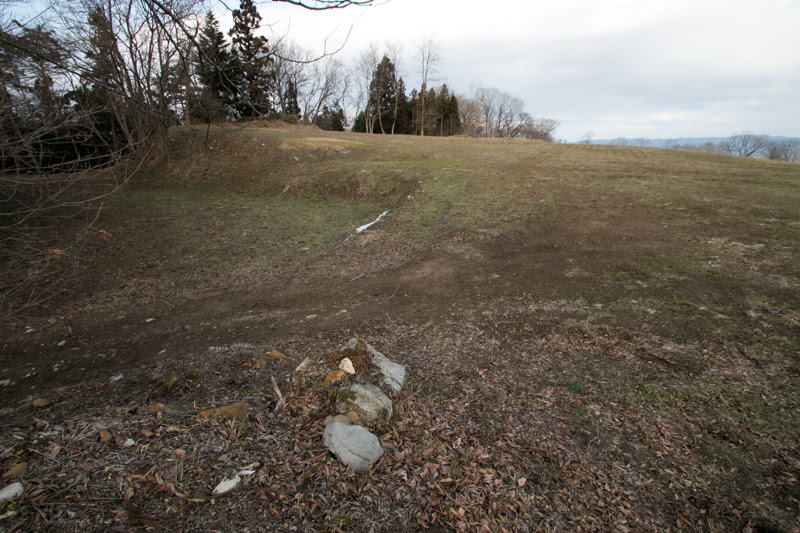 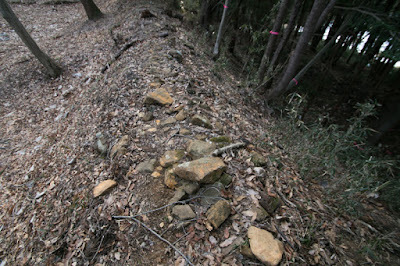 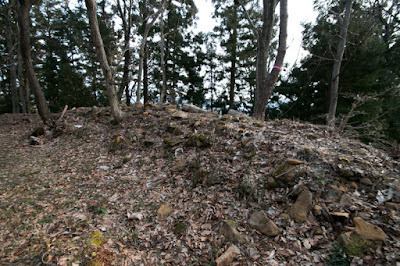 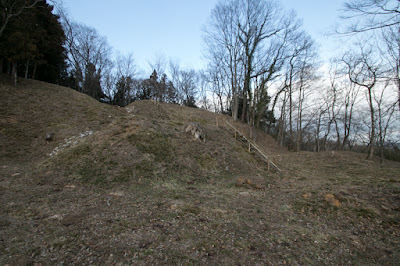 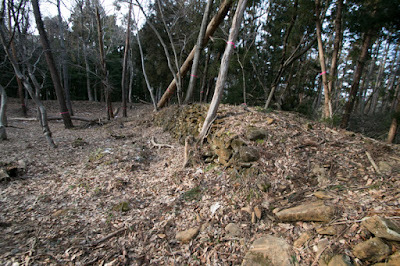 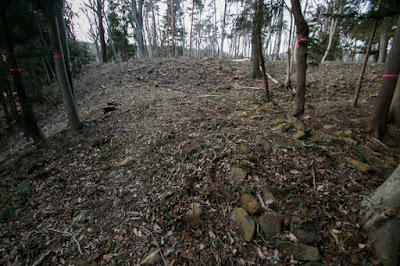 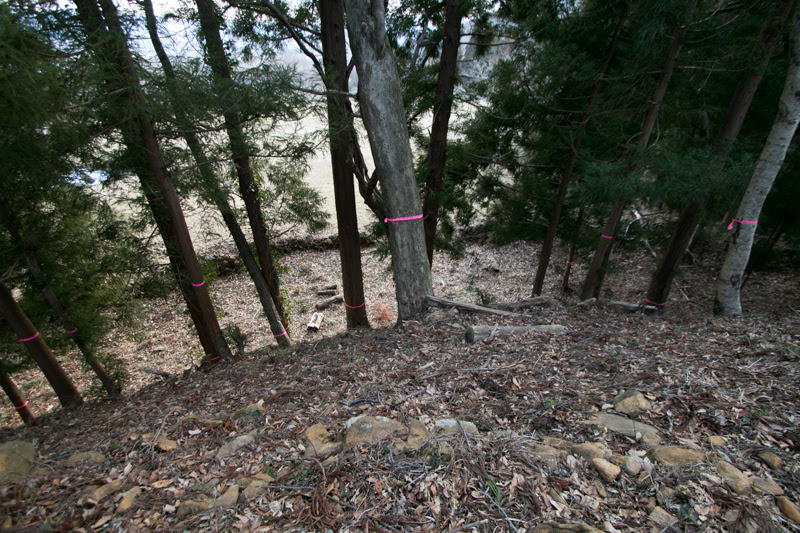 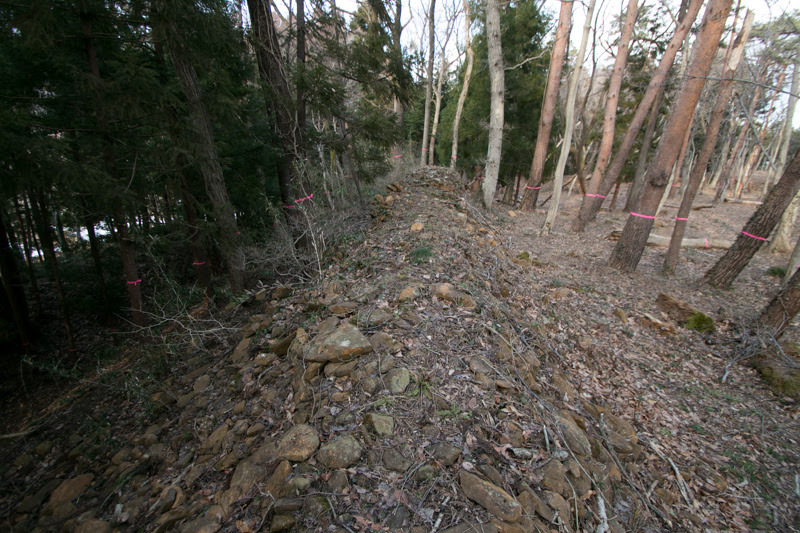 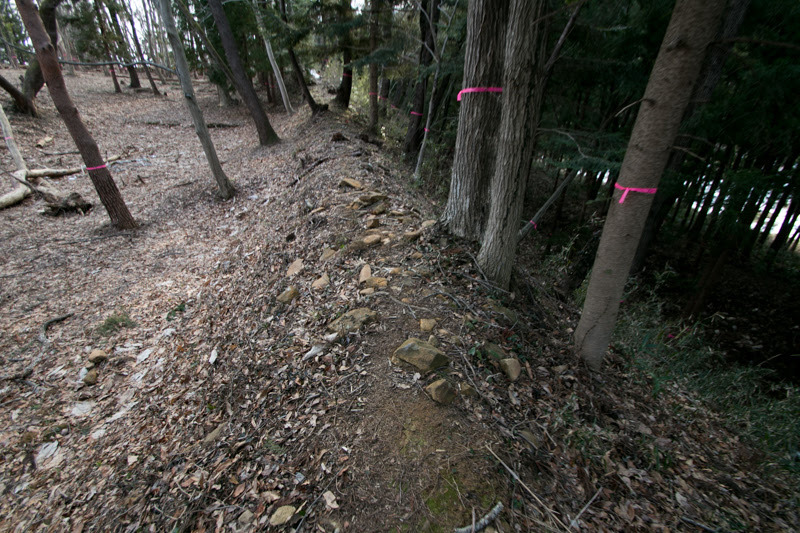 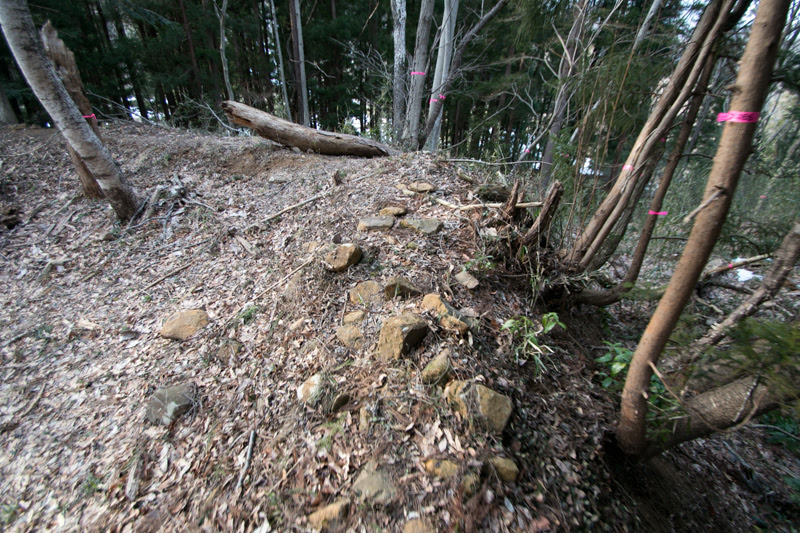 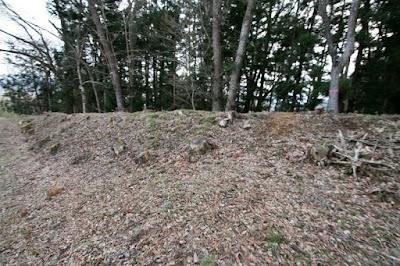 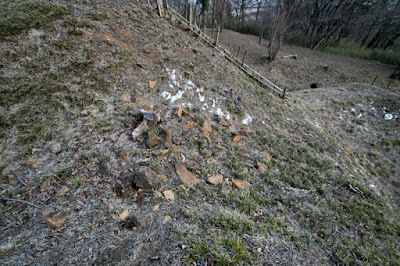 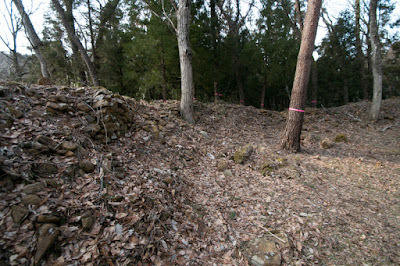 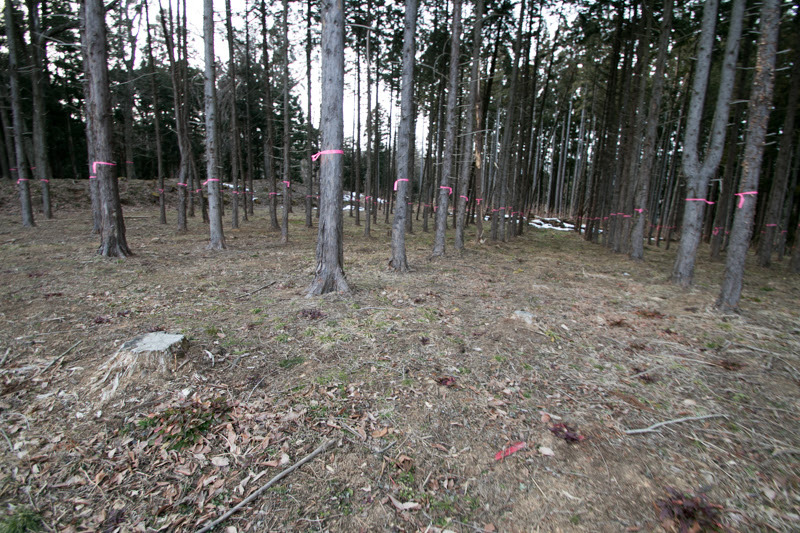 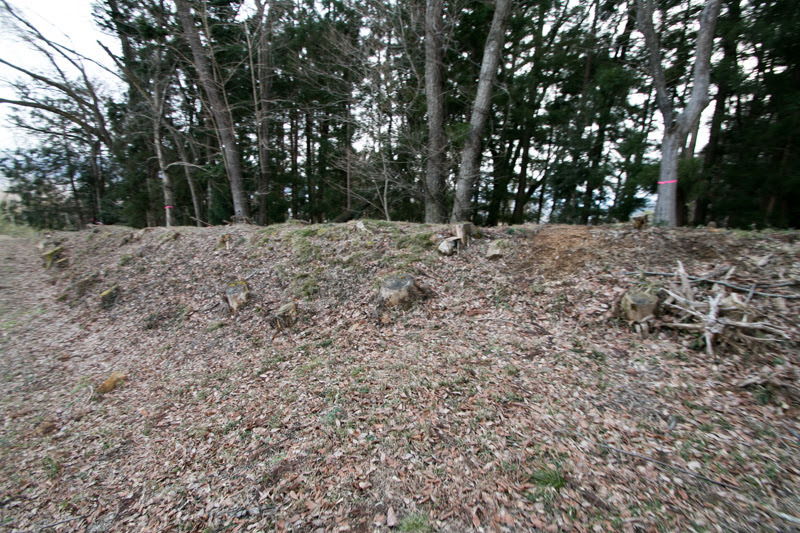 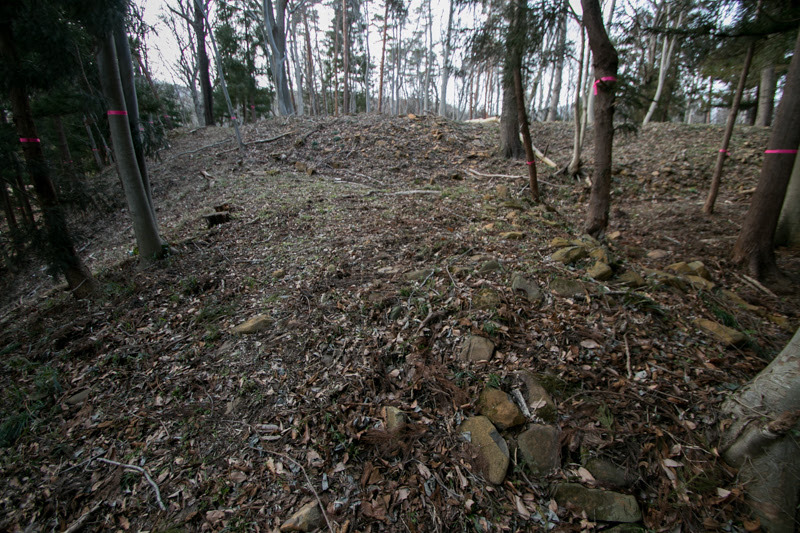 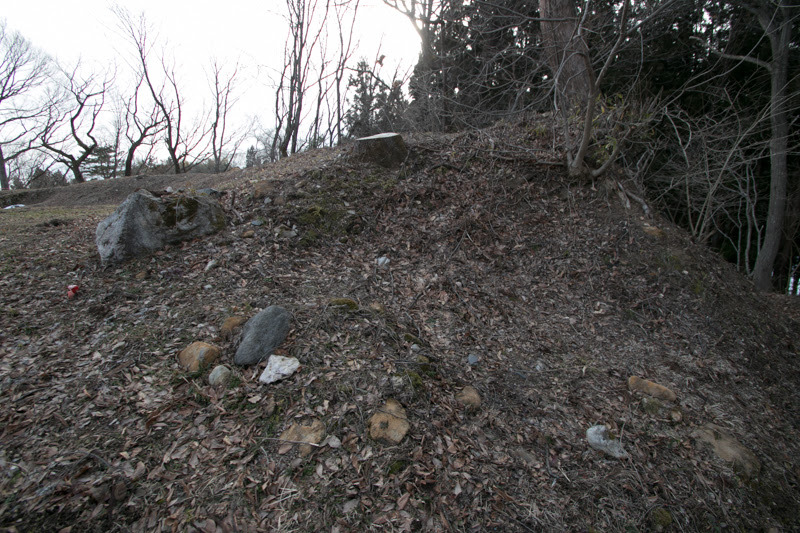 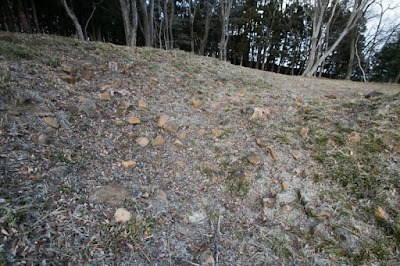 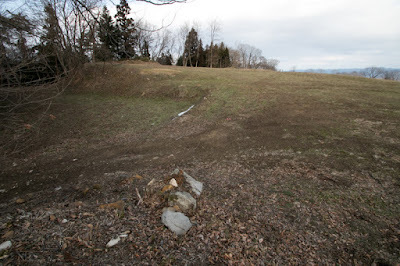 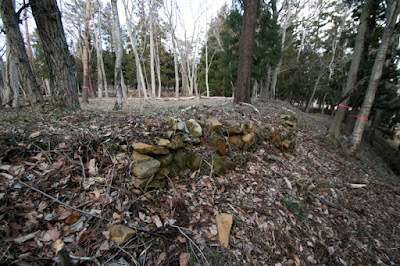 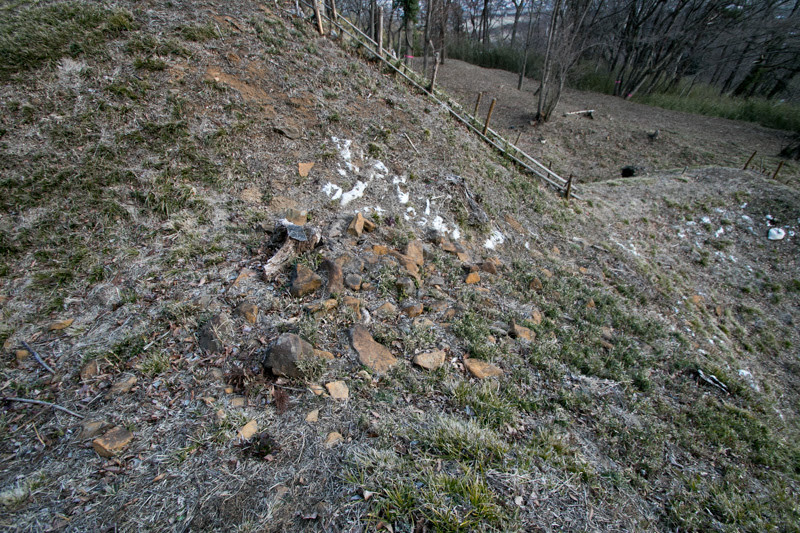 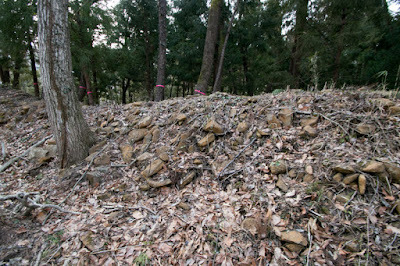 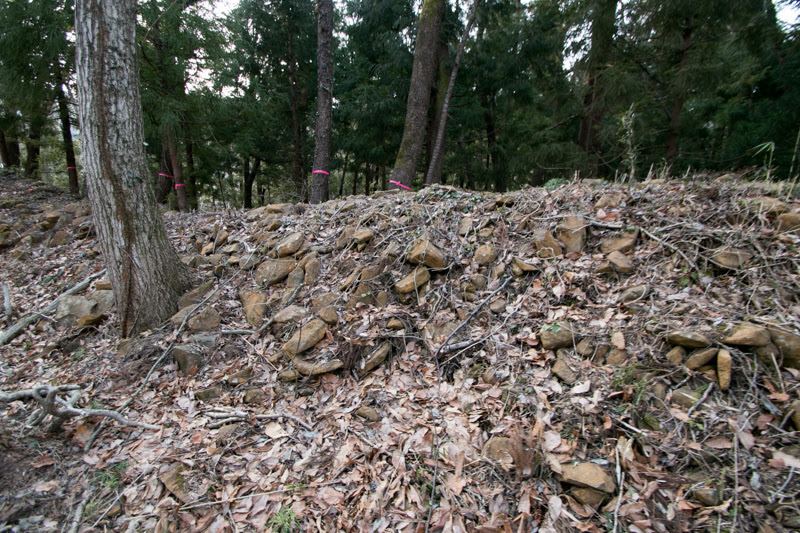 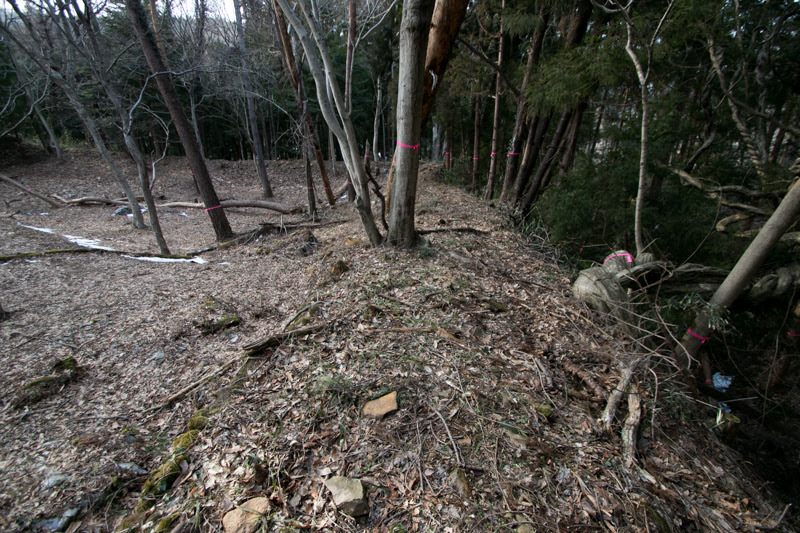 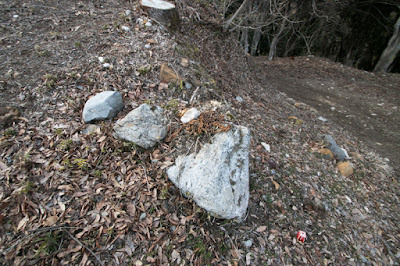 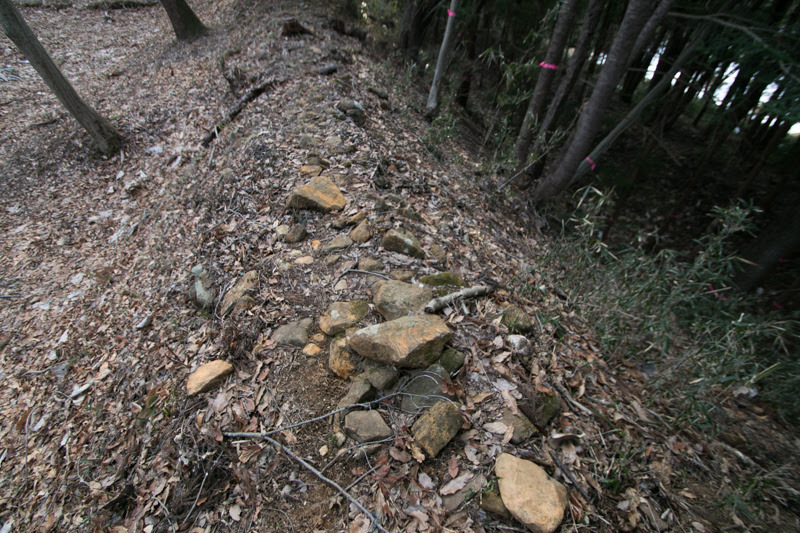 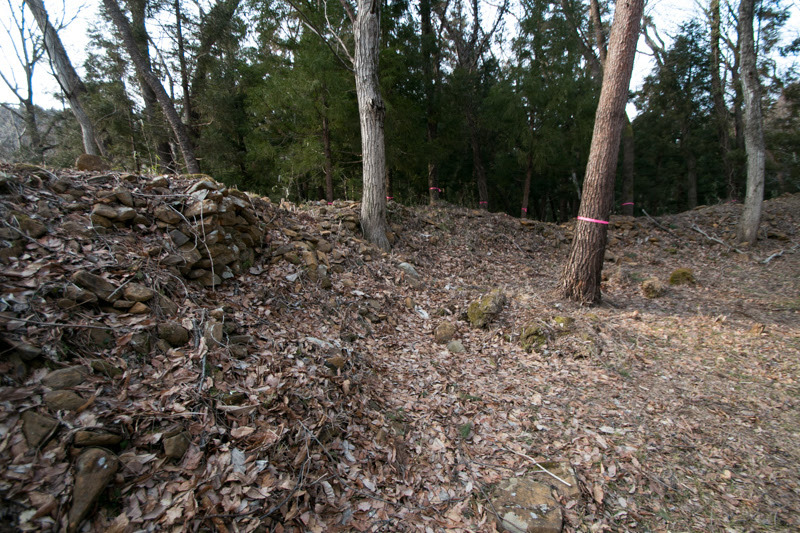 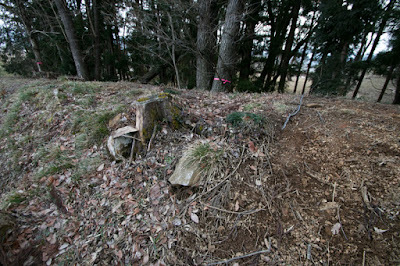 Now all building was lost but structures of the castle well remain on the hill. 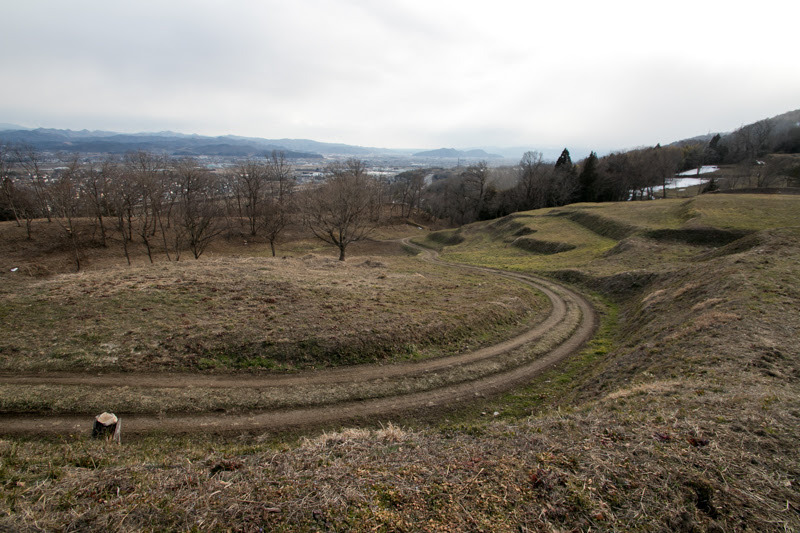 Layers of curved terraces seen from main gate of the castle has a magnificent view as a main base of prominent lord of Tohoku region. Mixture of medieval element such as aggregation of highly independent terraces and modern element such as stone wall or dignified front gate reflects contradiction and evolution of Date clan at transitional period from traditional lord to warlord. 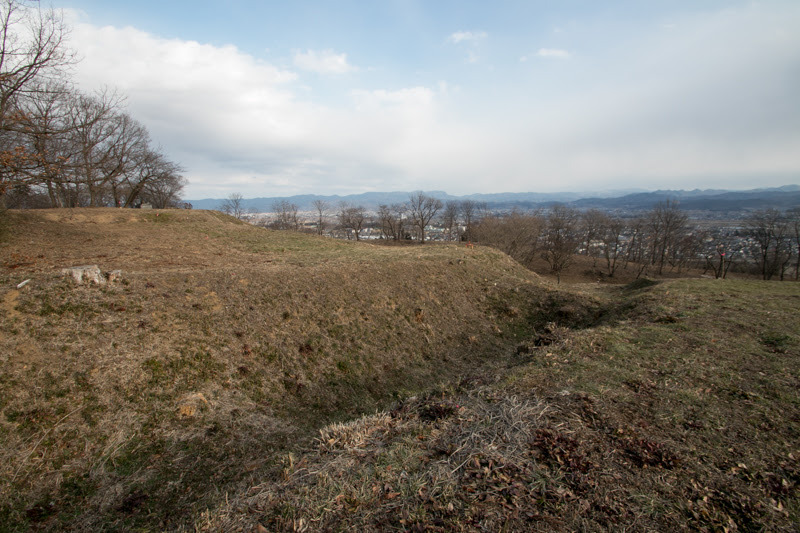 It takes time to visit all six main bases of Date clan, but that is the very thing to show long and turbulent history of Date clan. 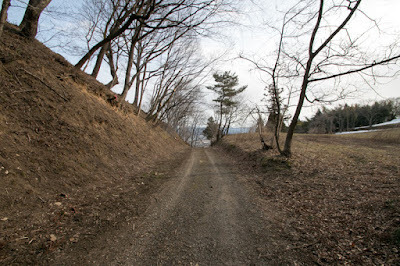 30 minutes walk from JR East Tohoku-Honsen line Kori station. 15 minutes drive from Tohoku-Jidoshado Expressway Kunimi interchange.